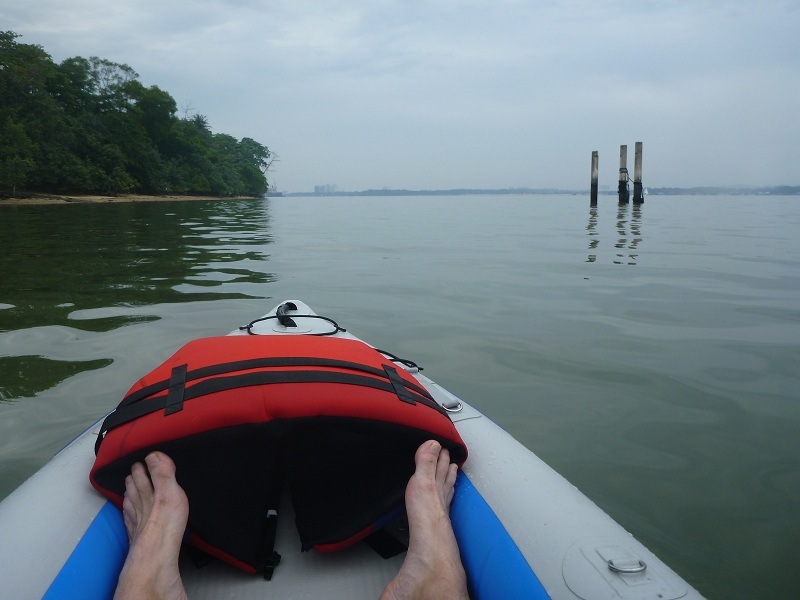 The skipper of the Divorce Machine was unavailable for selection this morning, so I made the first solo excursion. 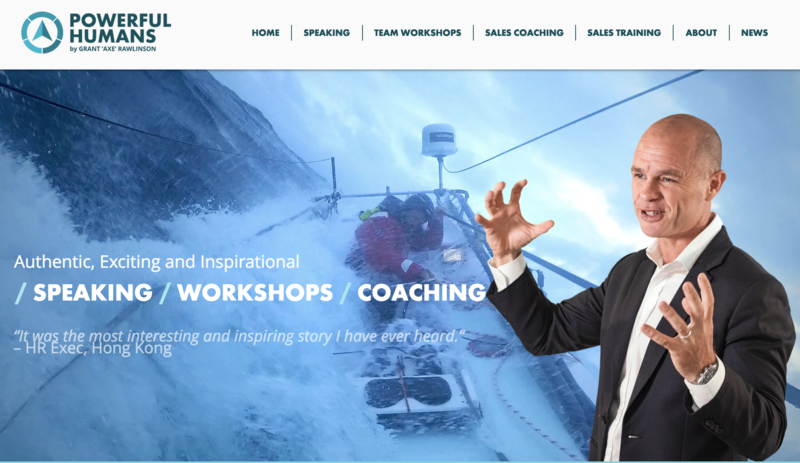 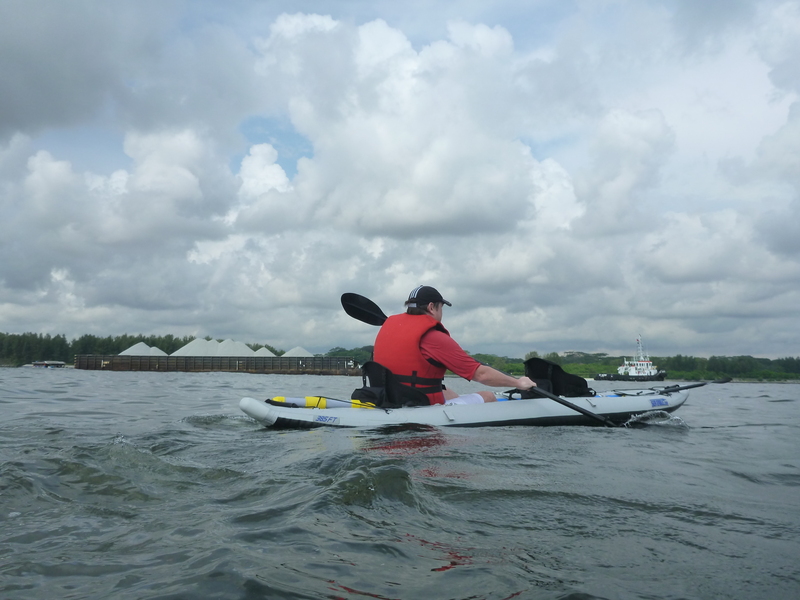 I am currently in training to paddle across a potentially dangerous stretch of water as part of my next expedition coming up in December. 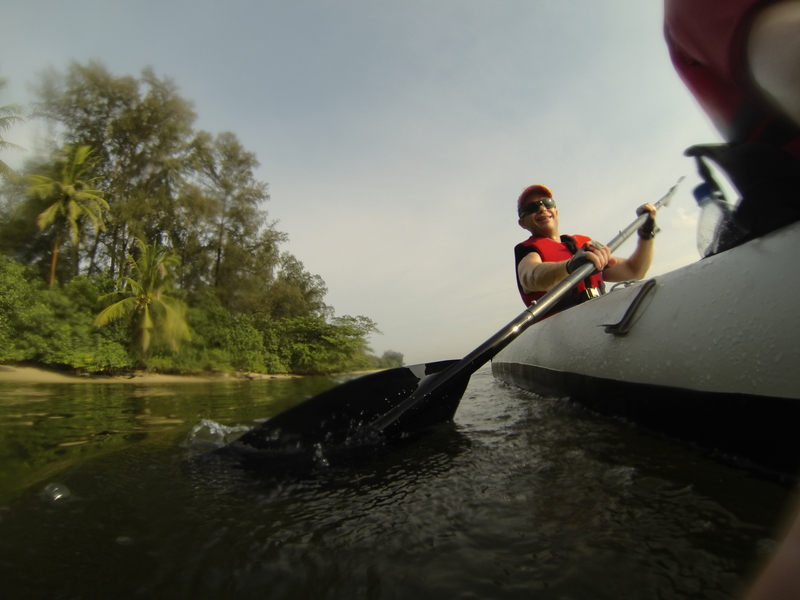 So as well as microadventuring, my weekend paddles also serve as training for my December trip. 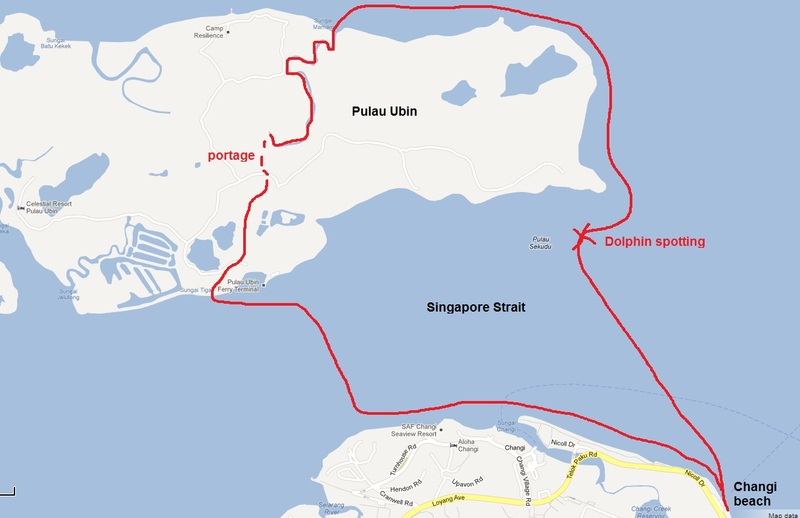 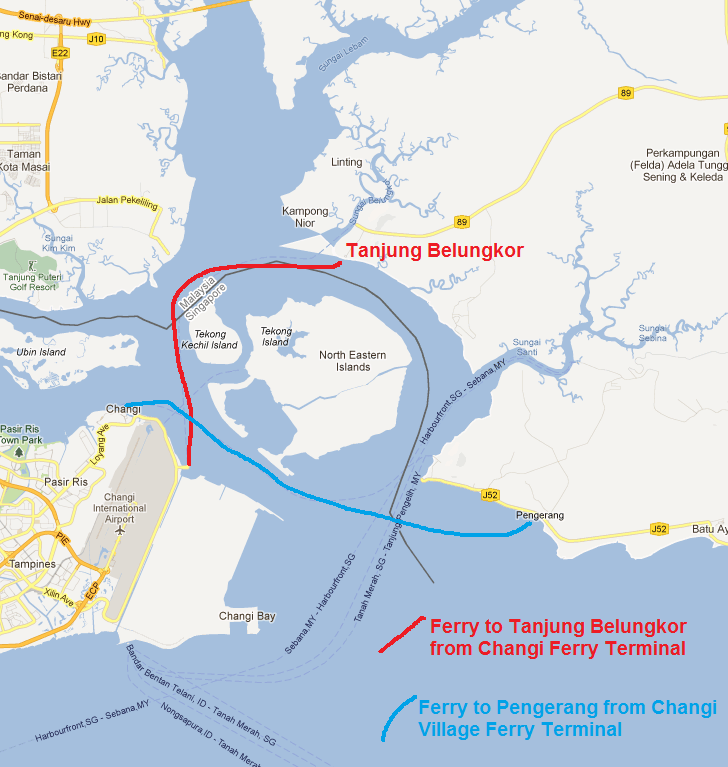 Today’s plan was a circumnavigation of Seletar Island on the North East coast of Singapore. 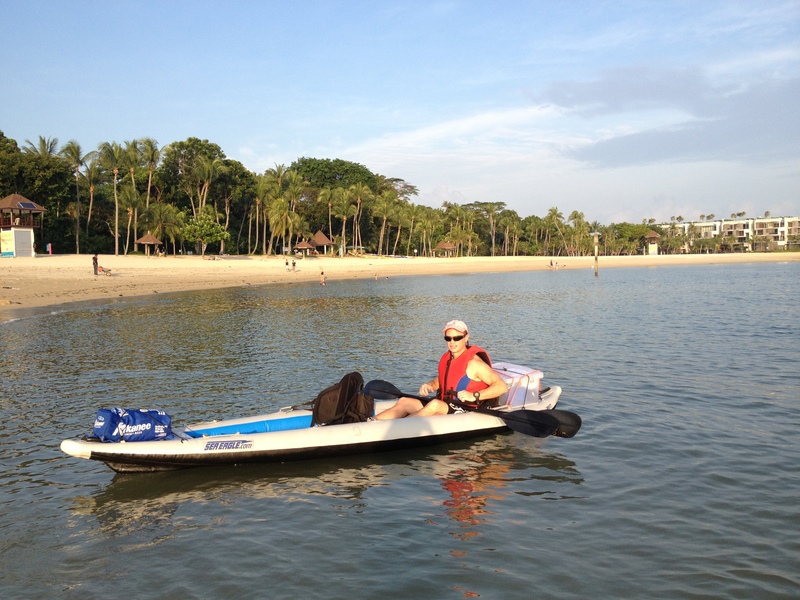 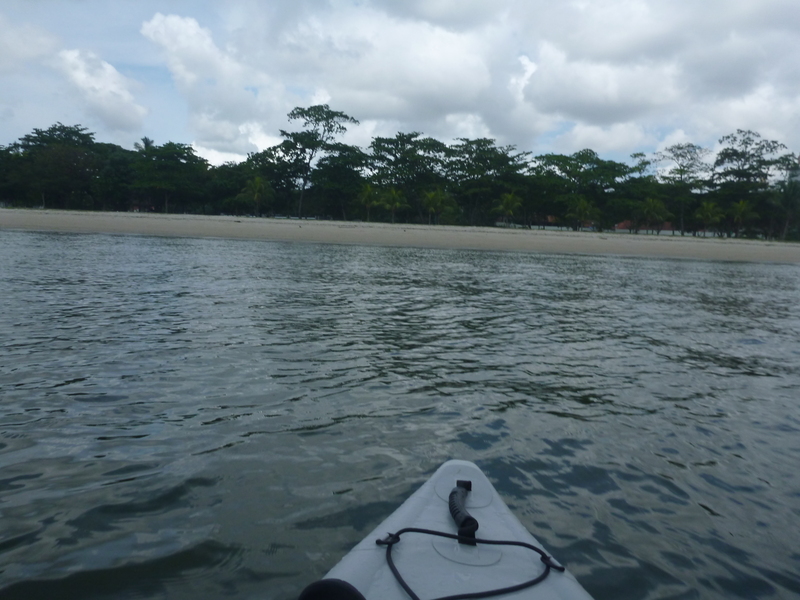 Departing and returning to Sembawang beach this is a round trip of just over 12km. 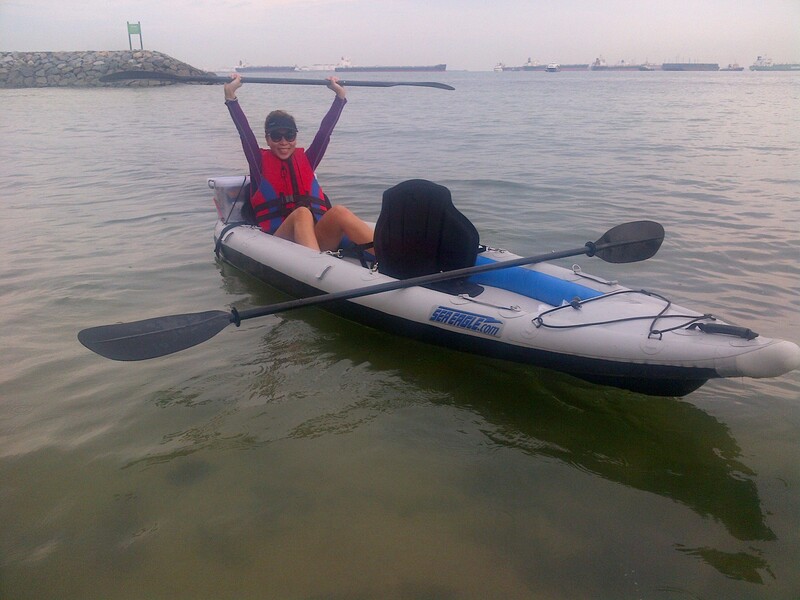 I was pleasantly surprised by how the Divorce Machine handles as a single-seater. 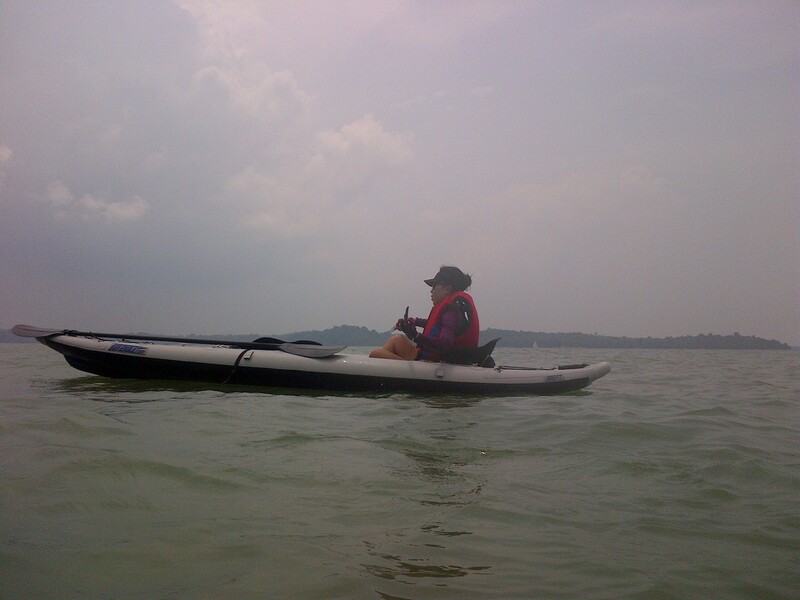 She rides higher and therefore does not take on as much water as when we have two people. 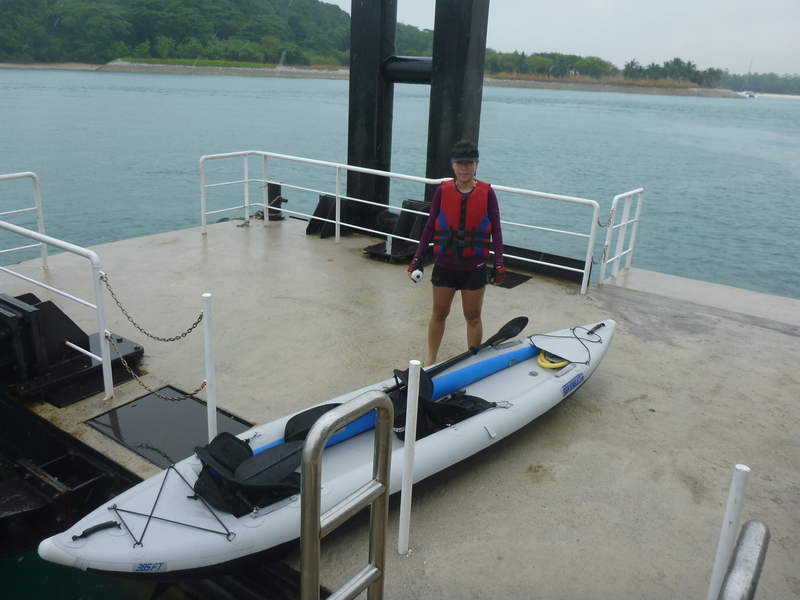 Of course it is much more fun when my wife joins me but it was also nice to have some time to myself as I paddled along the coastline and around the Selatar island. 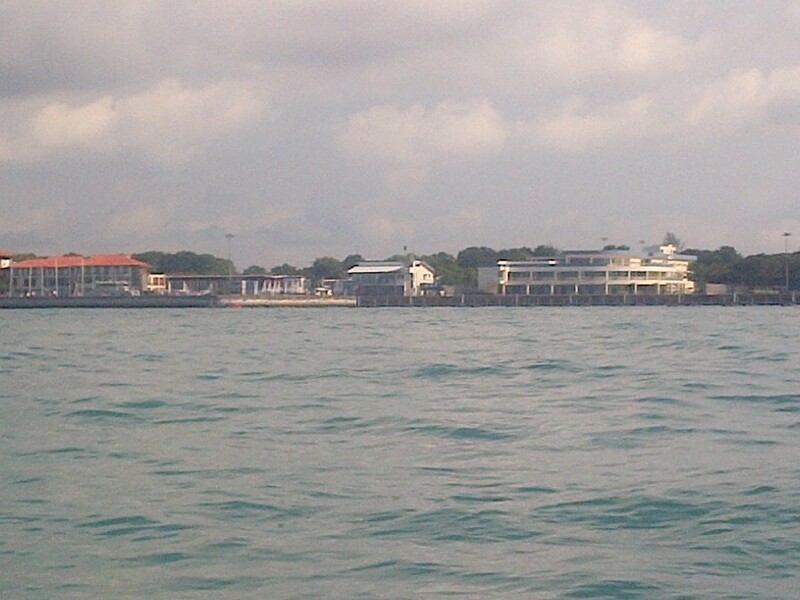 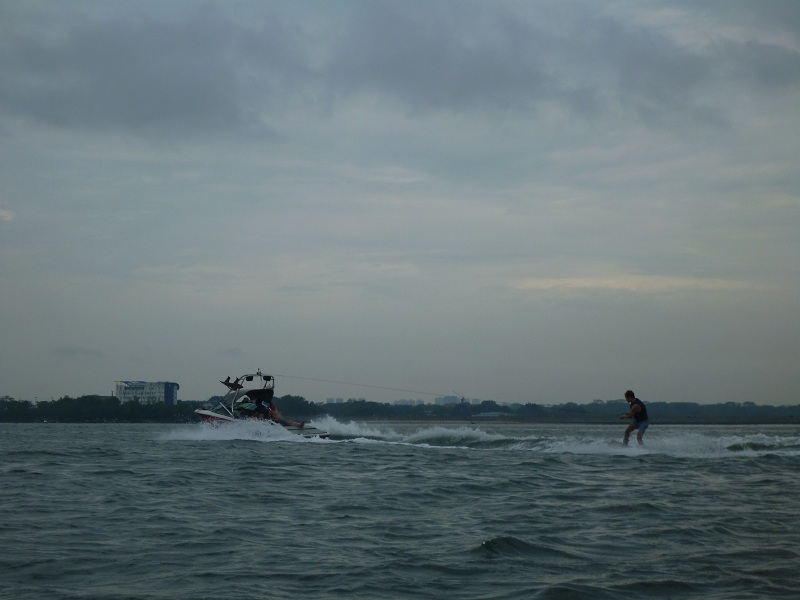 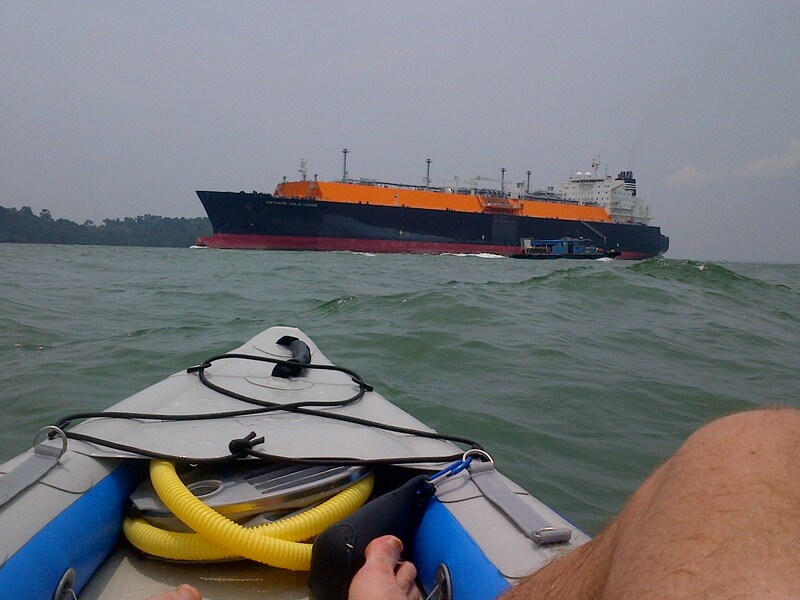 Seletar Island is a popular spot for wakeboarding and a number of boats were zipping up and down the channel past me. 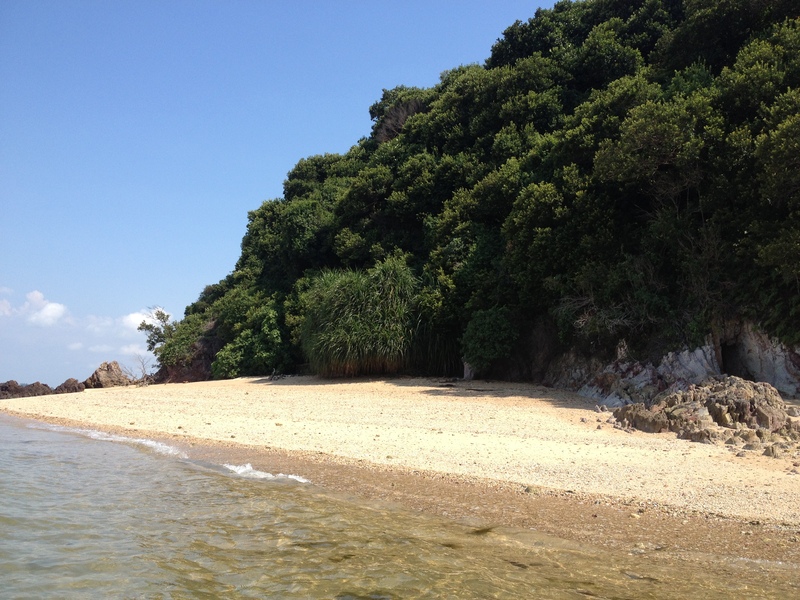 So I opted to return on the northern side of the island where it is much quieter. 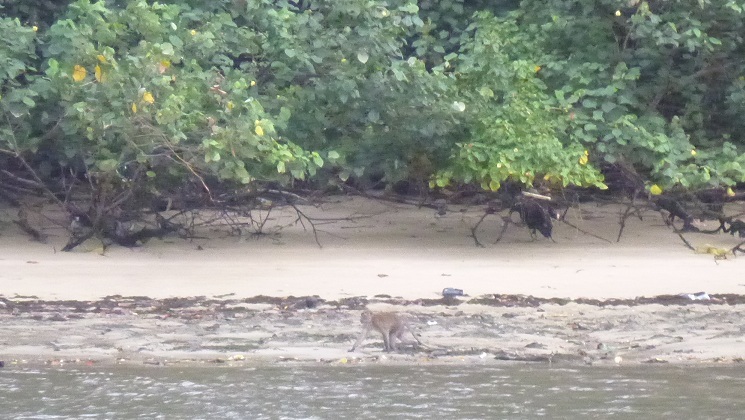 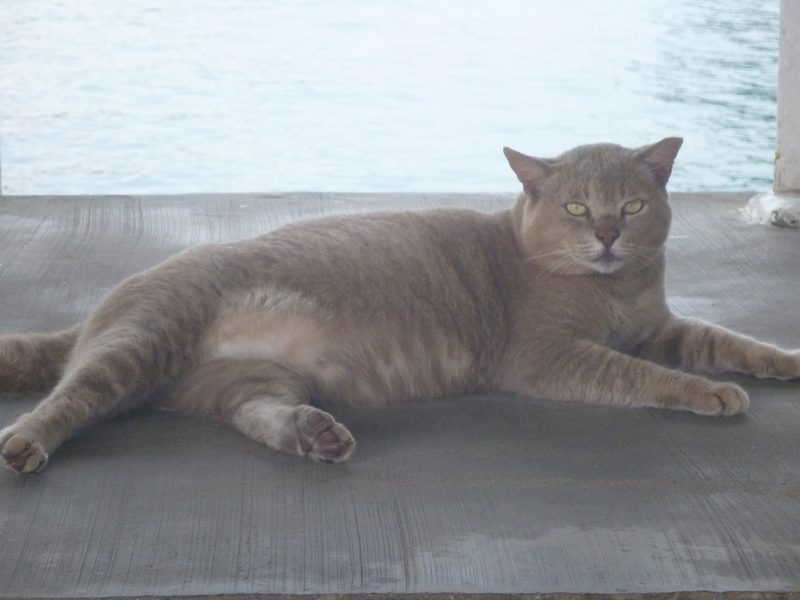 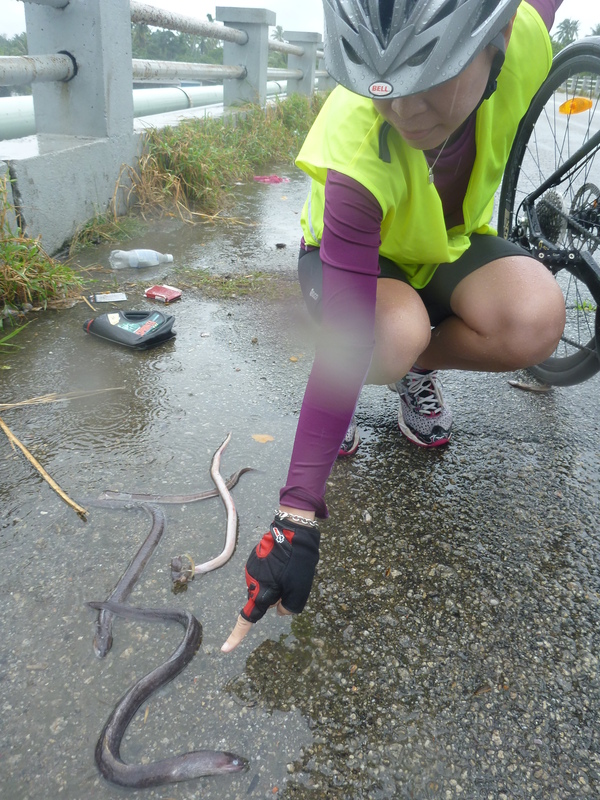 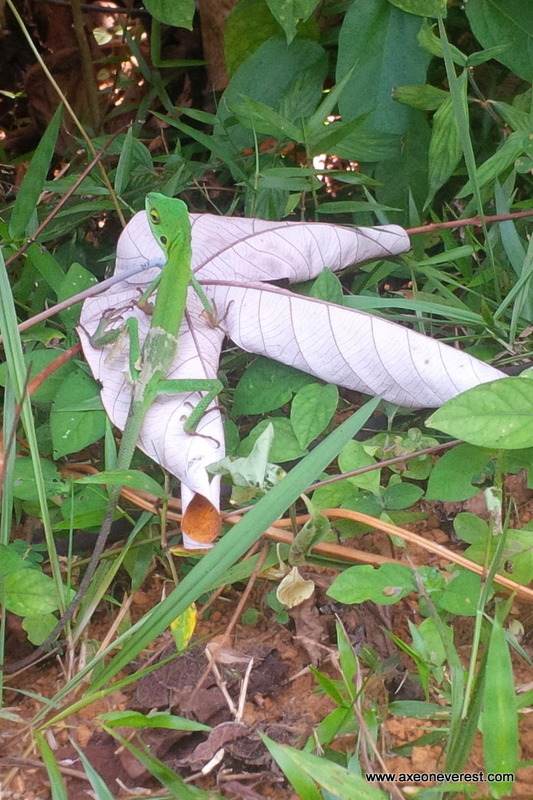 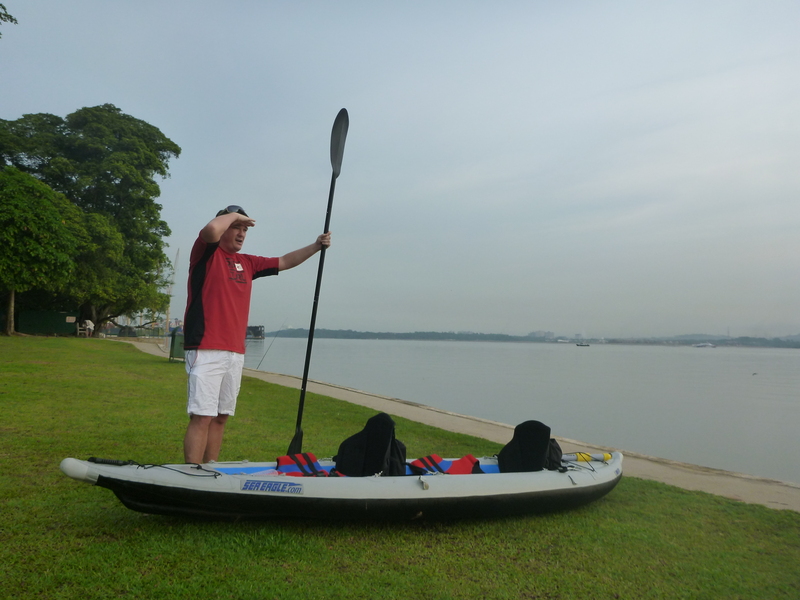 After just over 2 hours I returned to Seletar beach to a small crowd of curious onlookers. 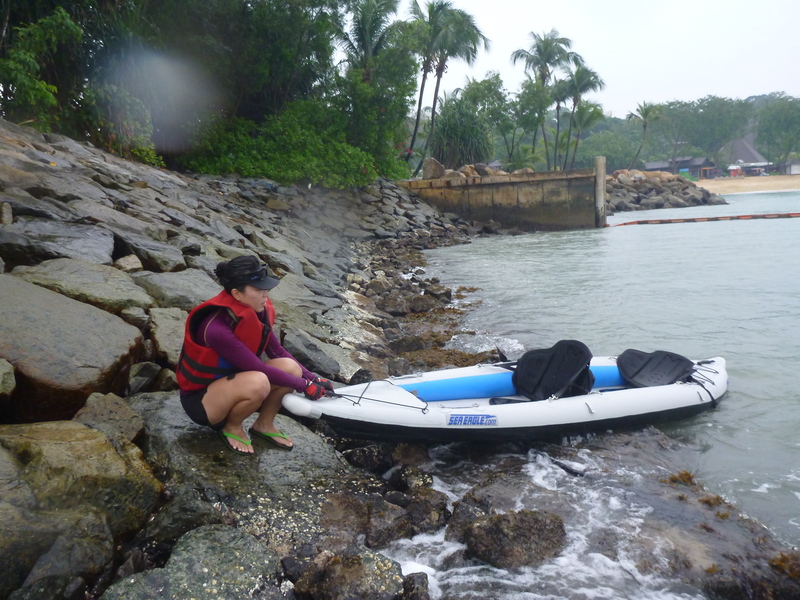 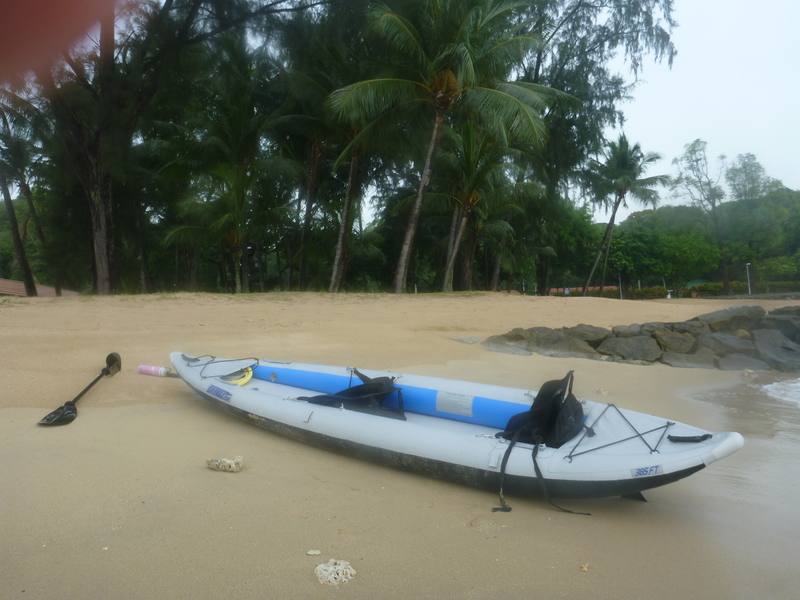 They watched me paddle into shore, pull out the kayak onto the beach, let out the air and roll it up into its bag, then haul it onto my back and walk off up the path. 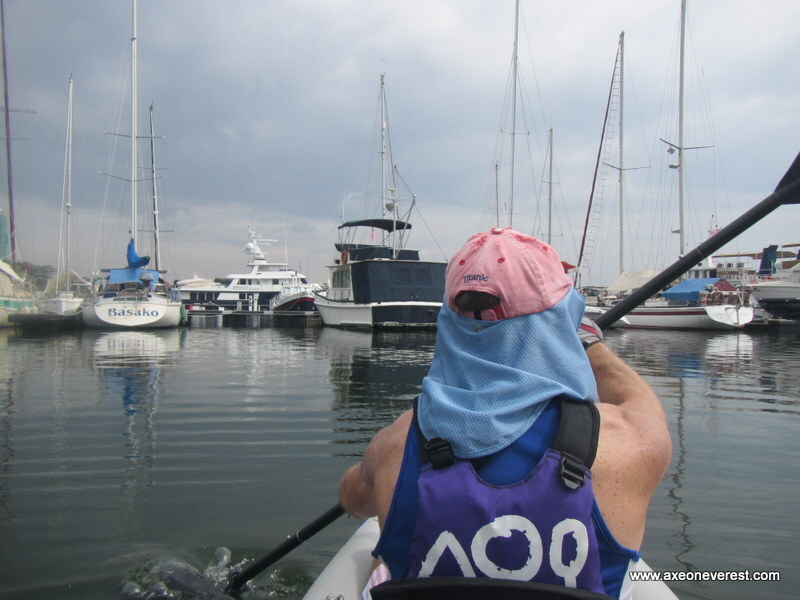 I got the feeling by the attention I was receiving that they thought this was very odd behavior, and where on earth did I come from and where was I going! 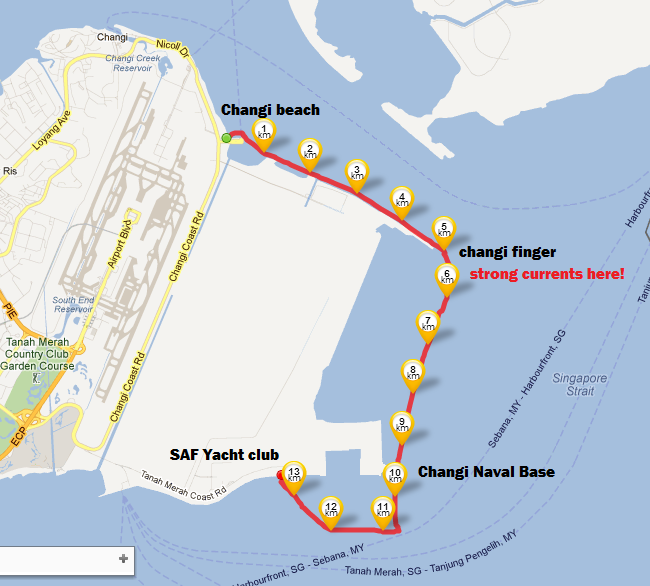 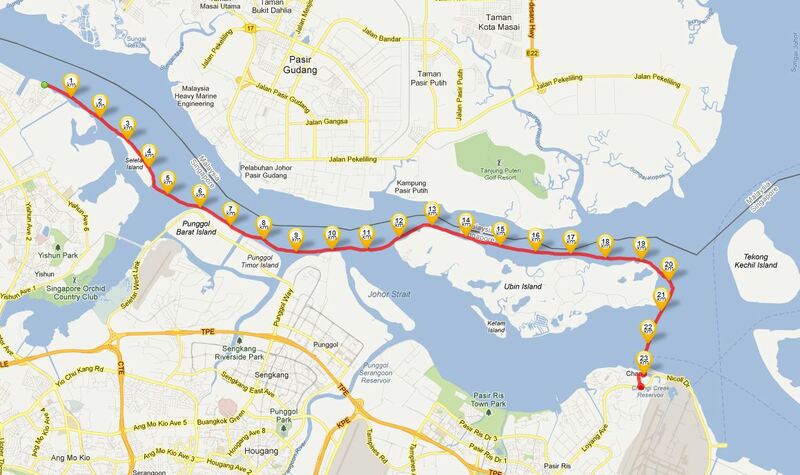 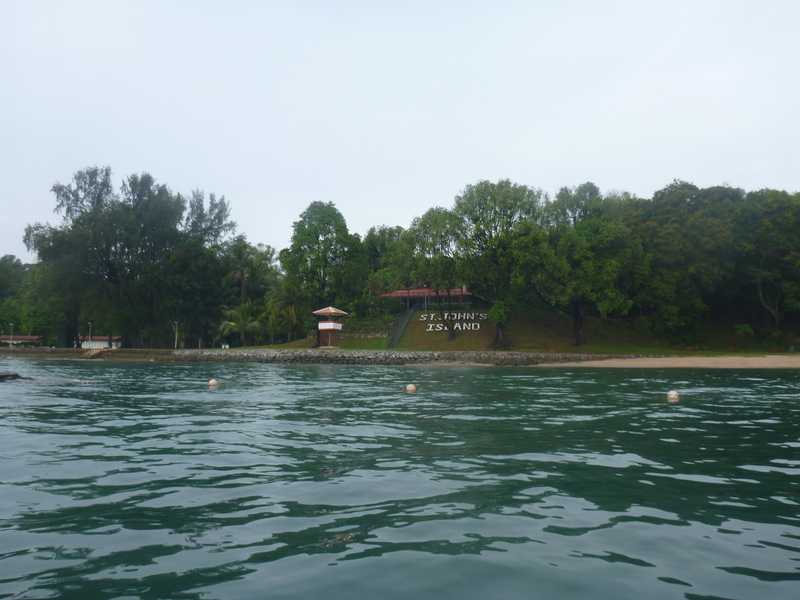 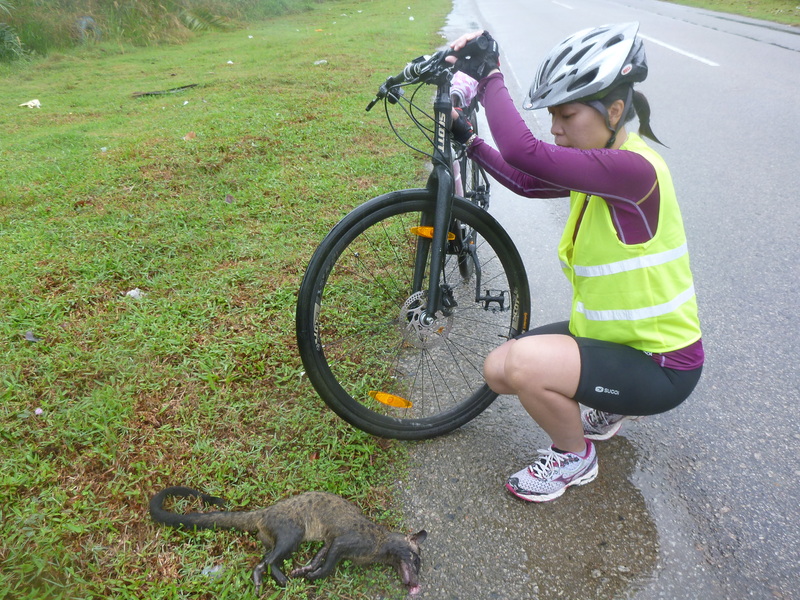 The 12km loop around Seletar Island starting and stopping at Sembawang beach. 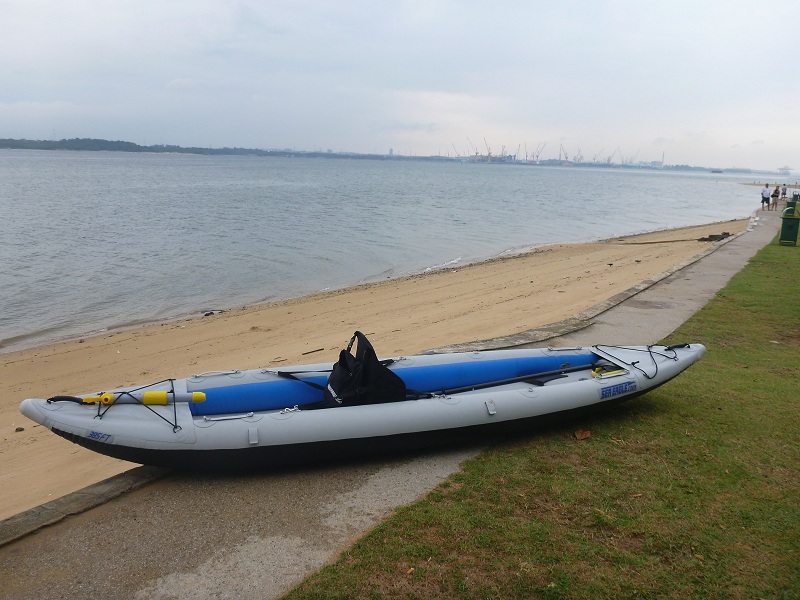 The Divorce Machine set up to ride solo. 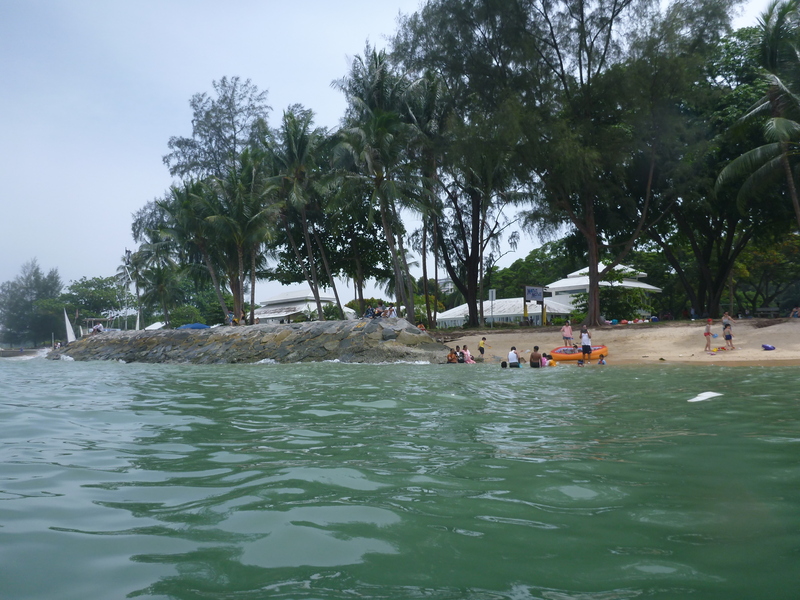 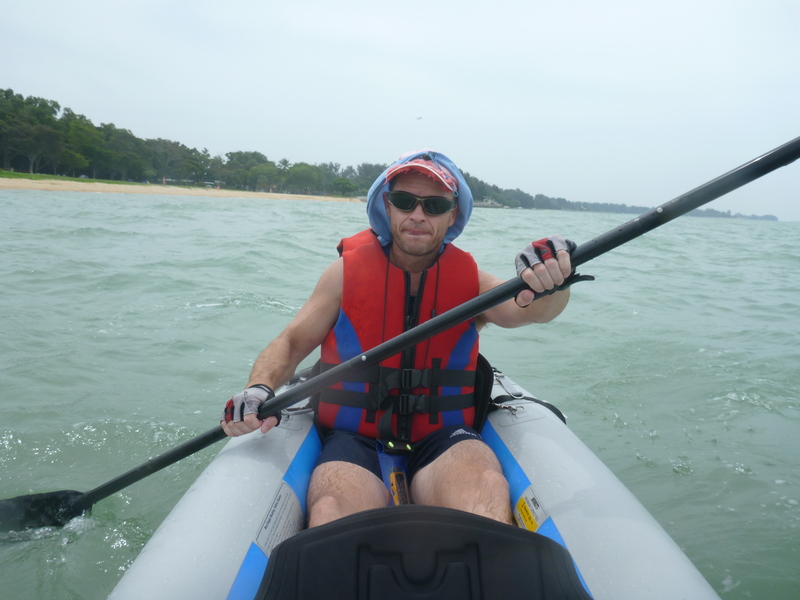 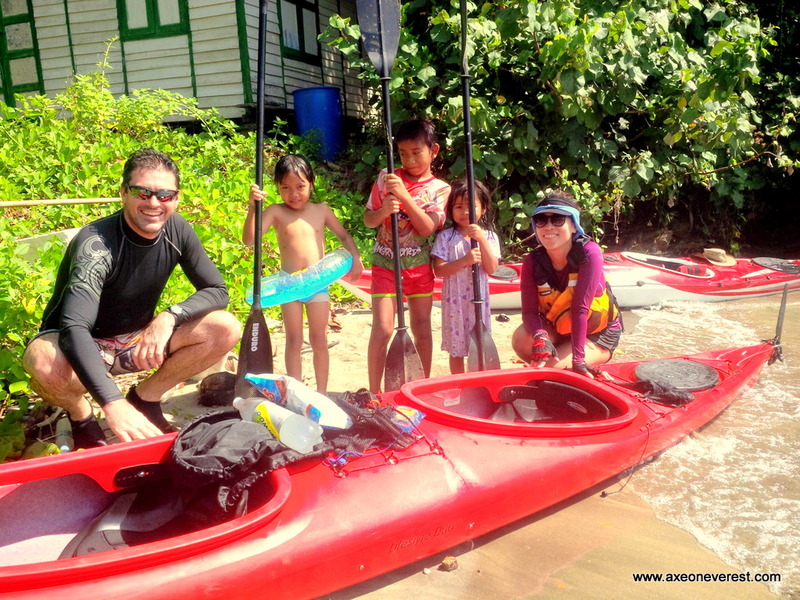 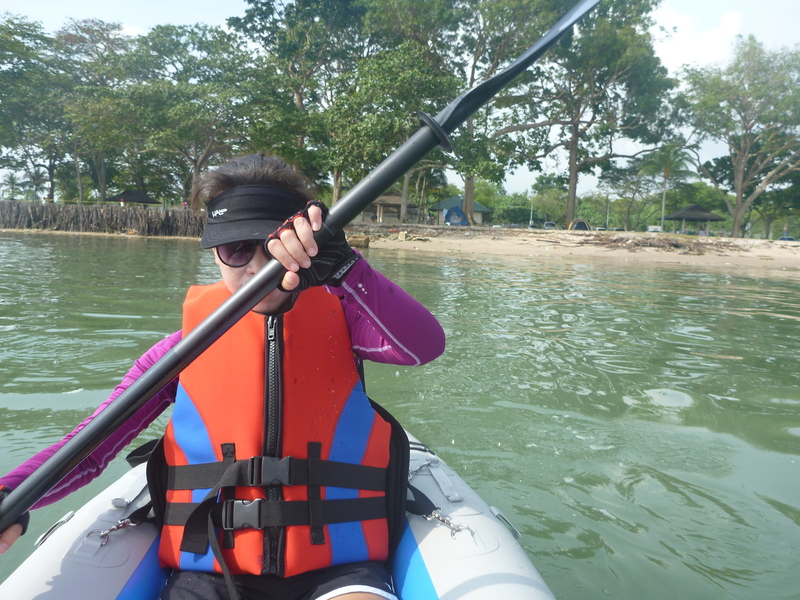 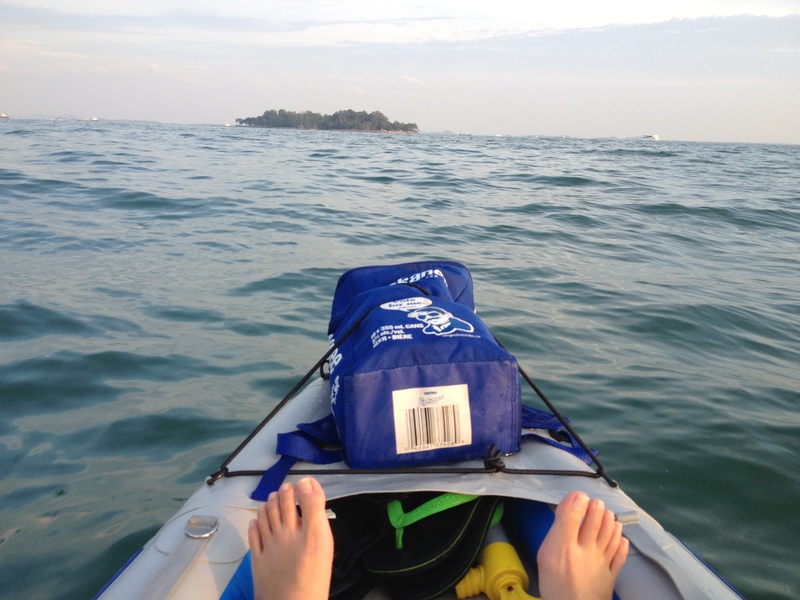 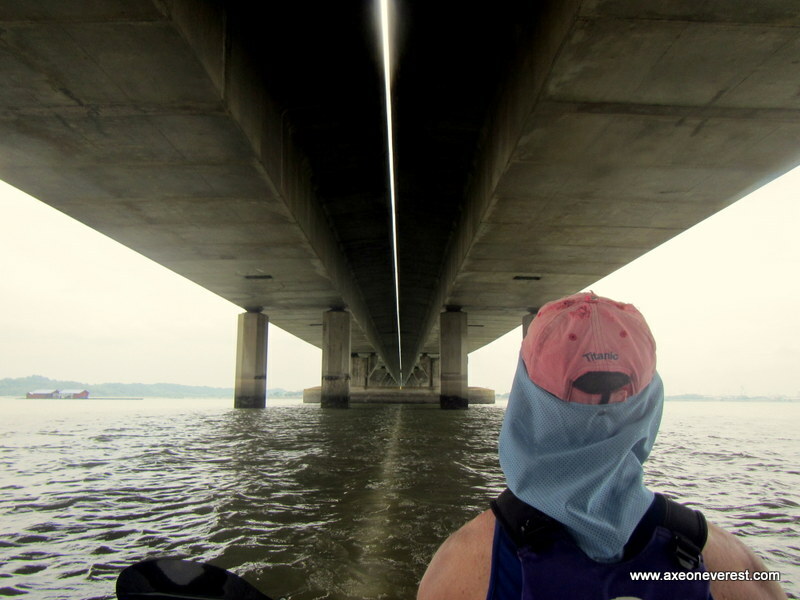 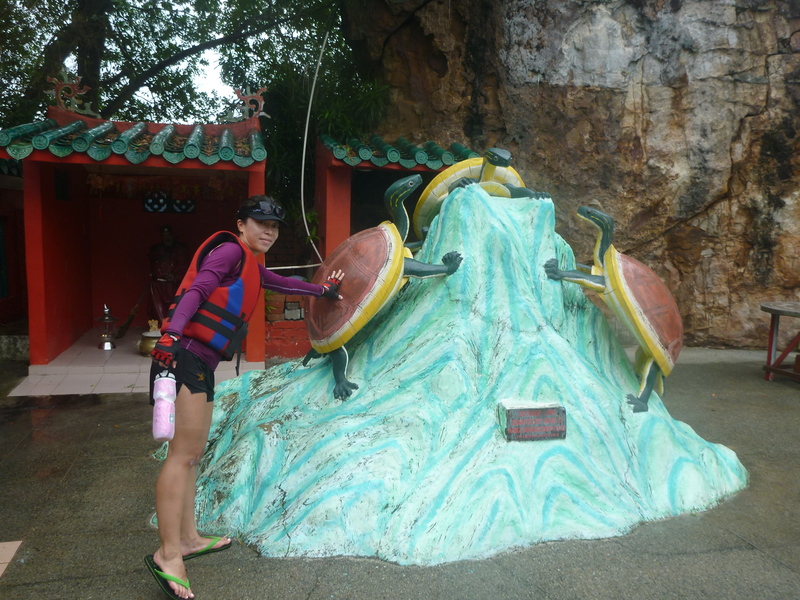 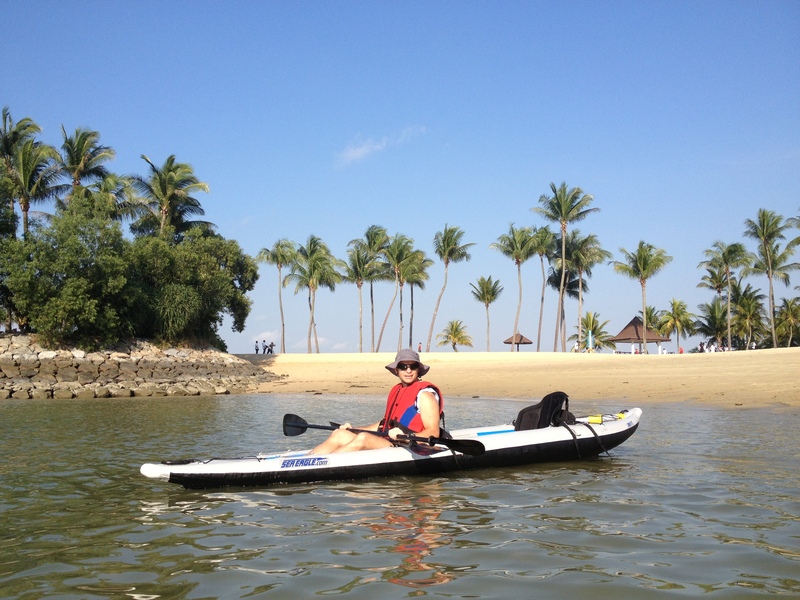 Paddling under a kelong or fishfarm. 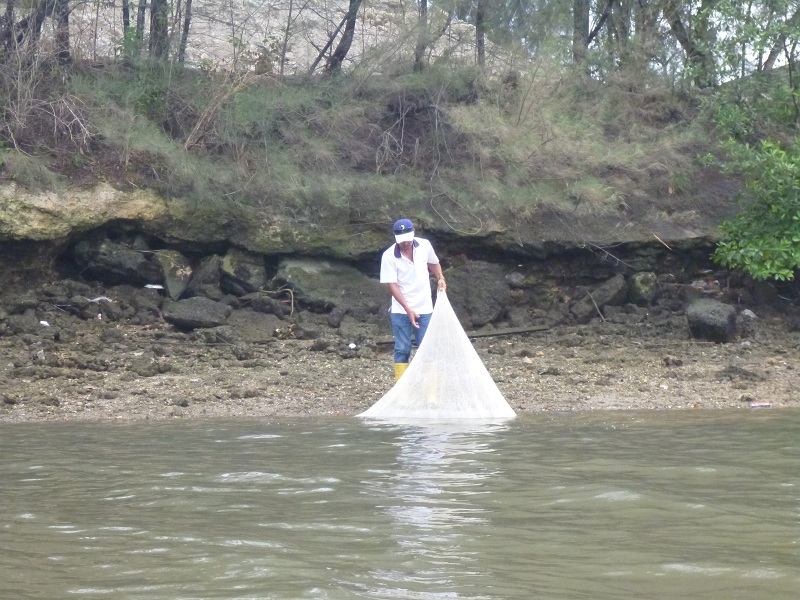 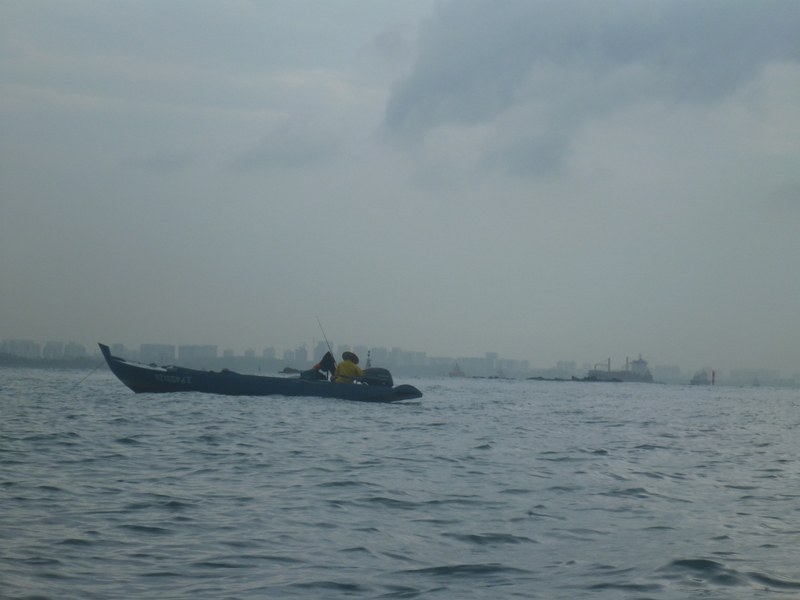 This guy was fishing for crabs from his boat. 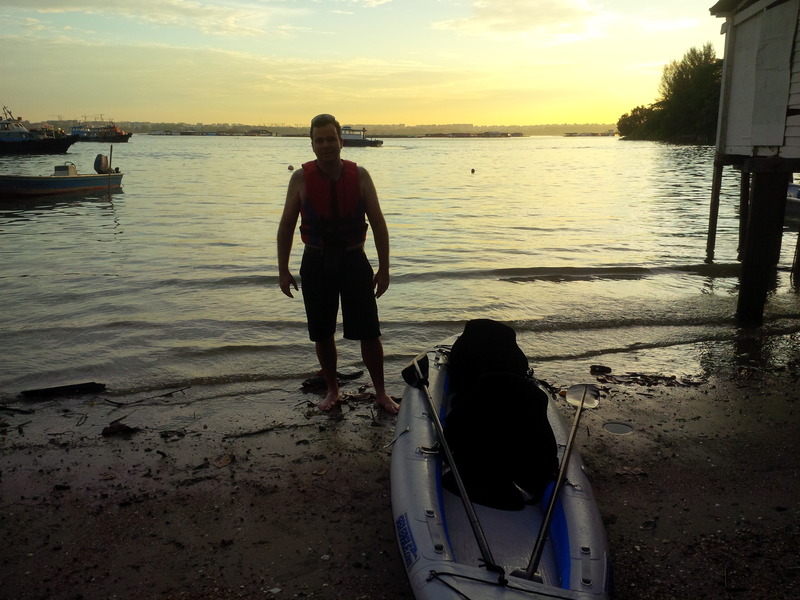 This monkey came down to the beach to check me out as I paddled past. 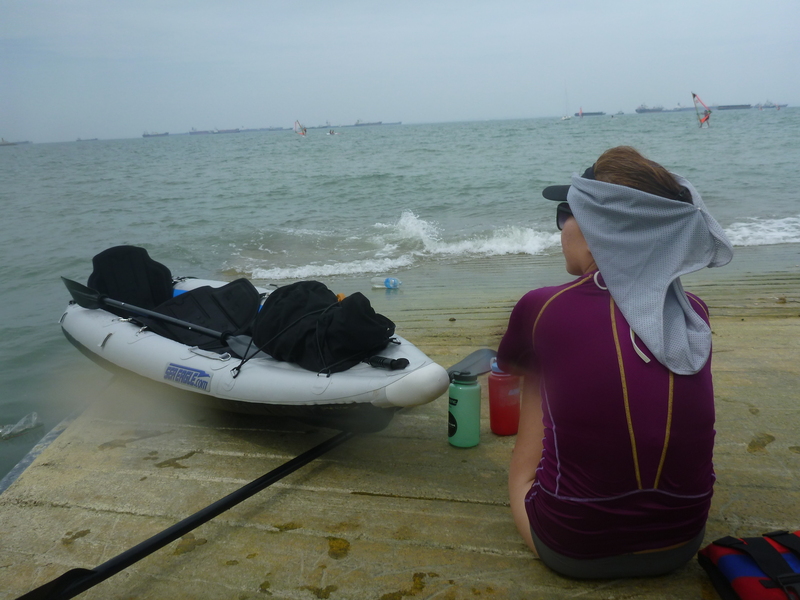 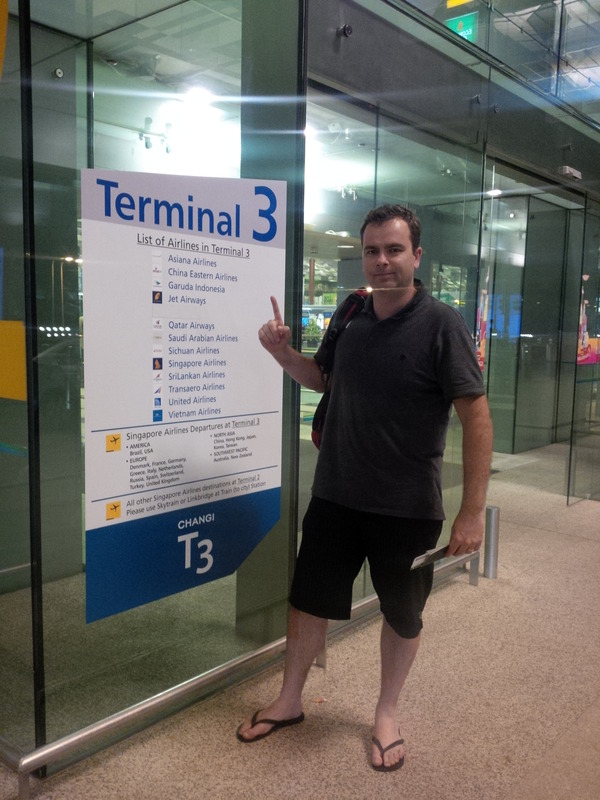 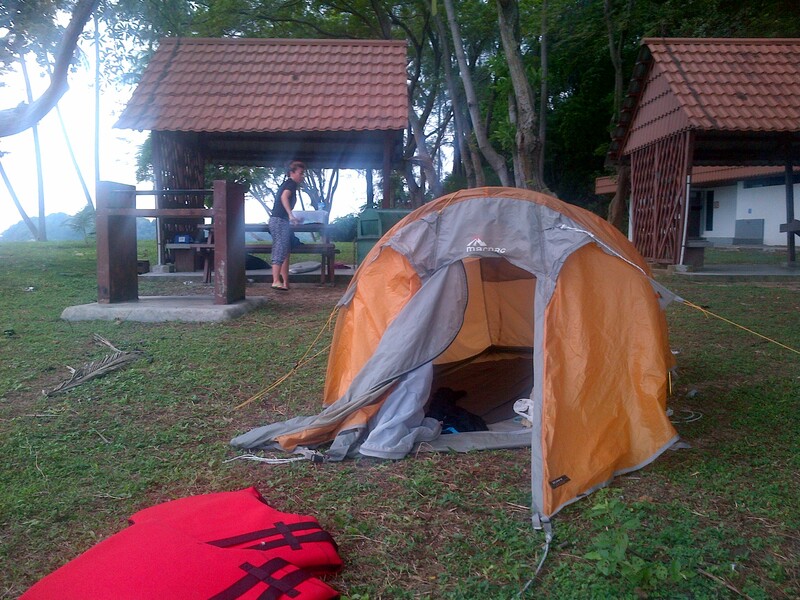 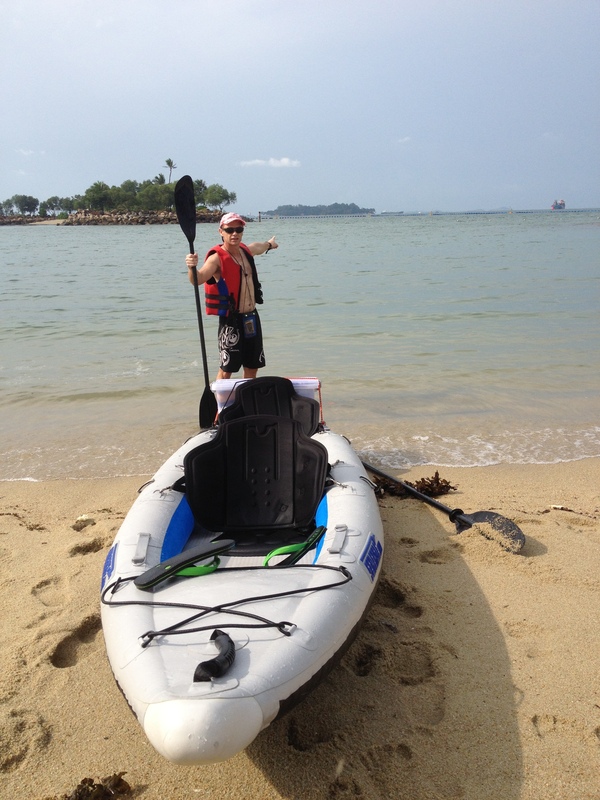 After 5 previous microadventures around the coast of Singapore, it was time to venture further afield. 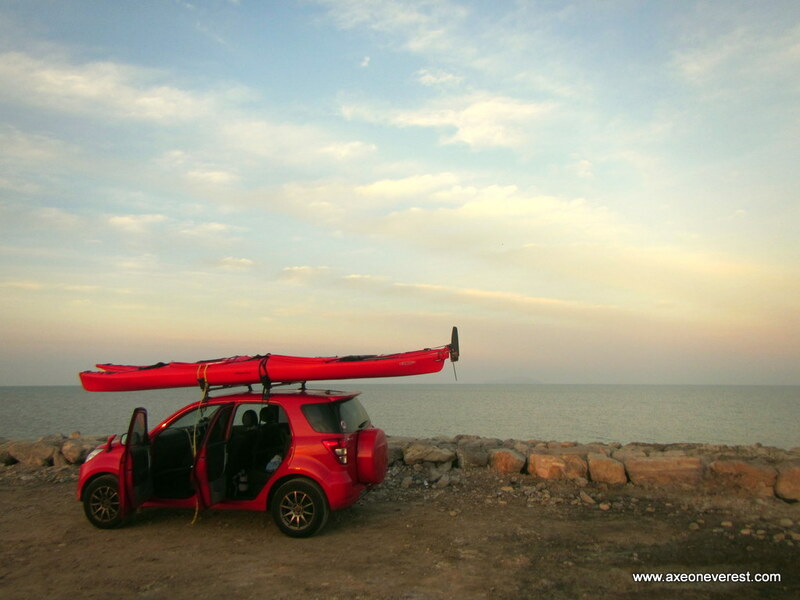 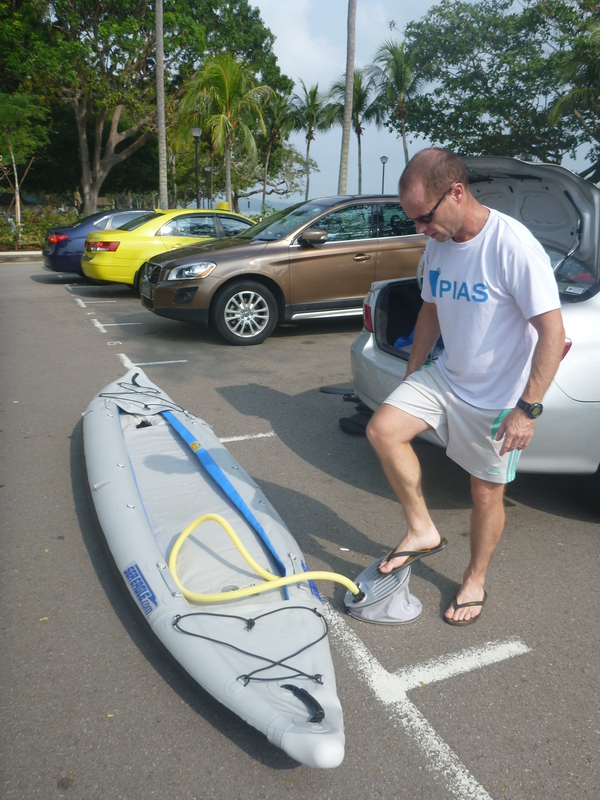 Together with my wife Stephanie we loaded our sleek gray inflatable kayak (affectionately known as the ‘Divorce Machine’) into the boot of our sleek gray Toyota VIOS (we have a thing for gray) and set off for a microadventure in Malaysia. 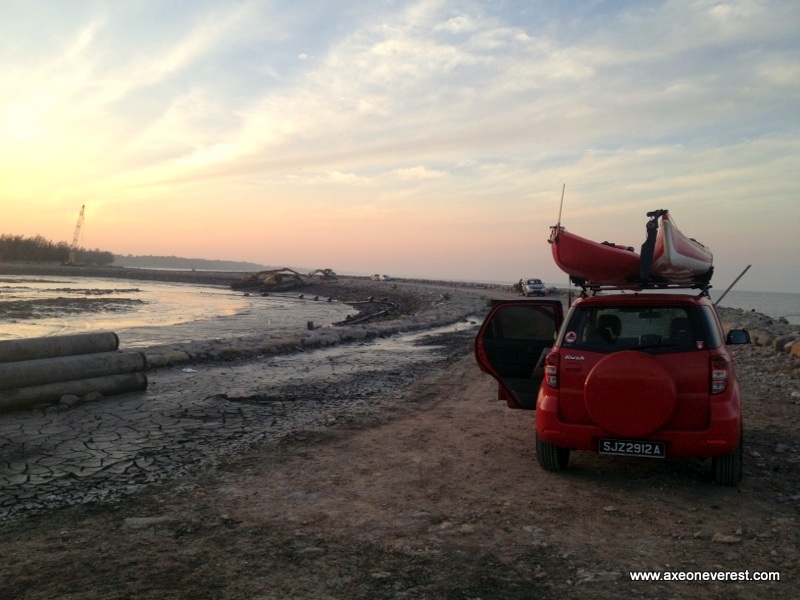 The plan was to drive over to the small fishing village of Kukup. 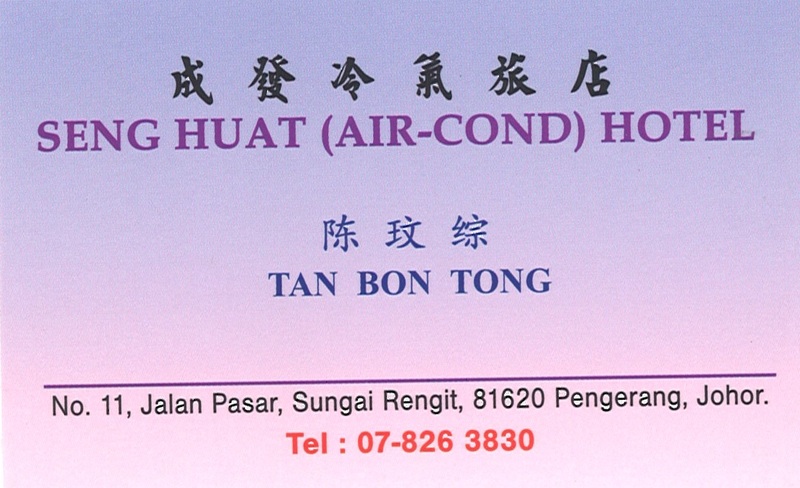 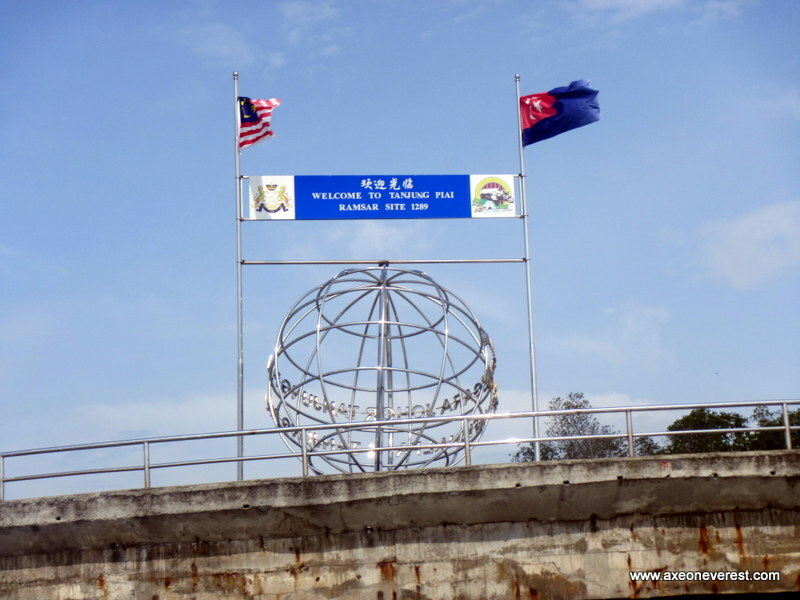 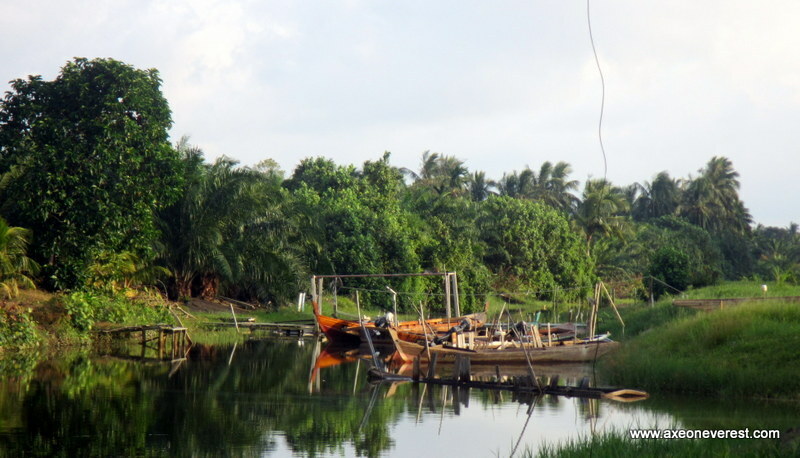 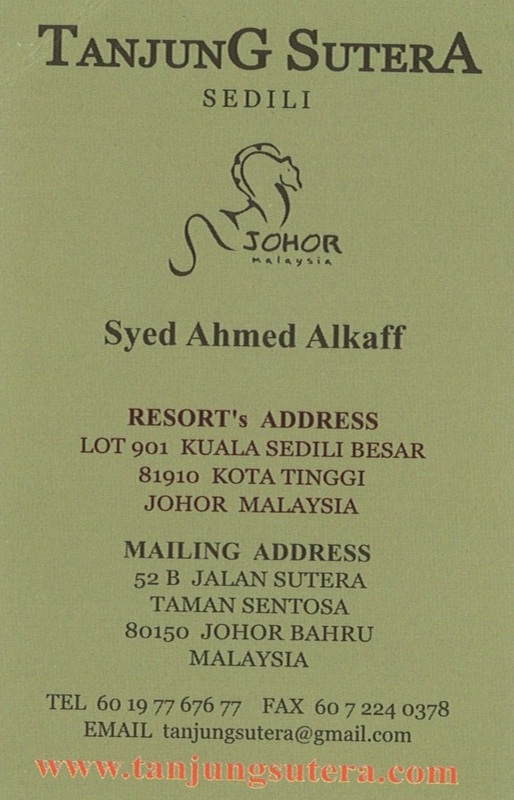 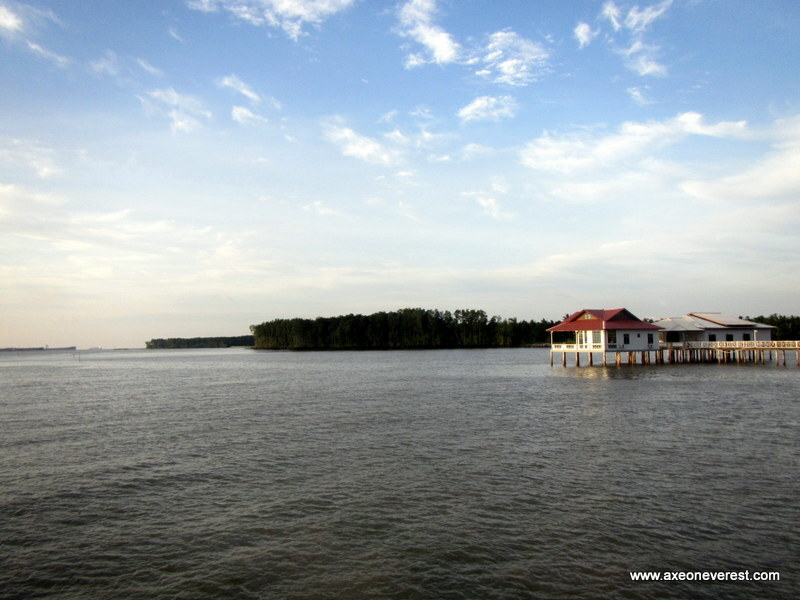 Kukup is located in the south-eastern corner of Peninsula Malaysia. 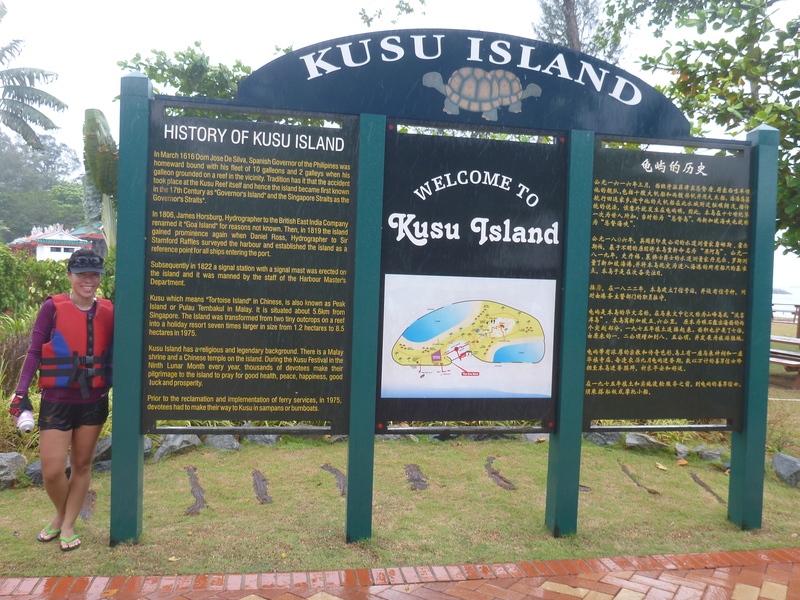 Kukup is 150 years old. 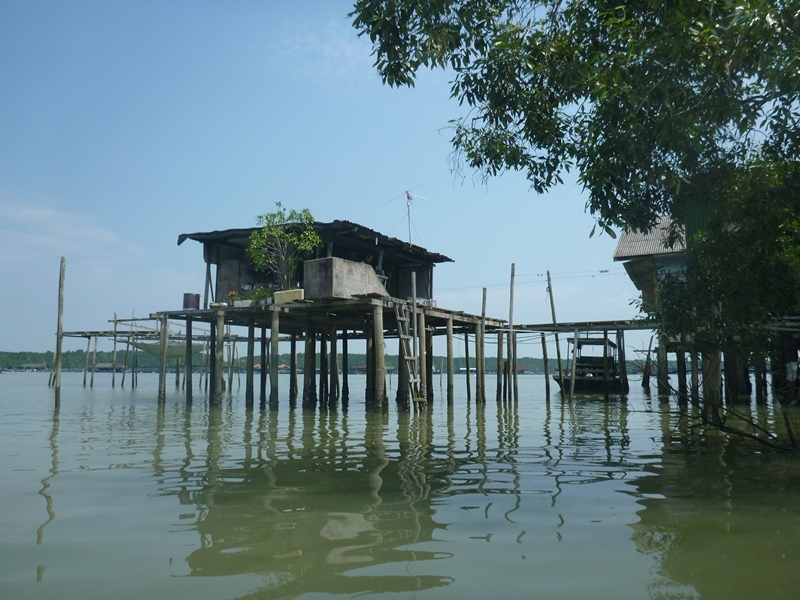 Many of the houses are built on stilts over the water. 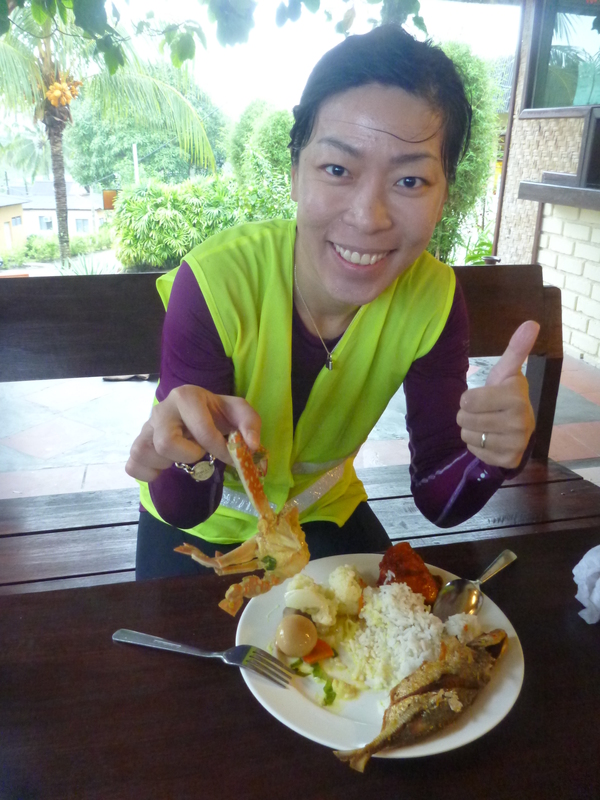 The main industries are fish farming and feeding car loads of hungry Singaporeans who come to sample the fresh seafood at the small restaurants which line the main street. 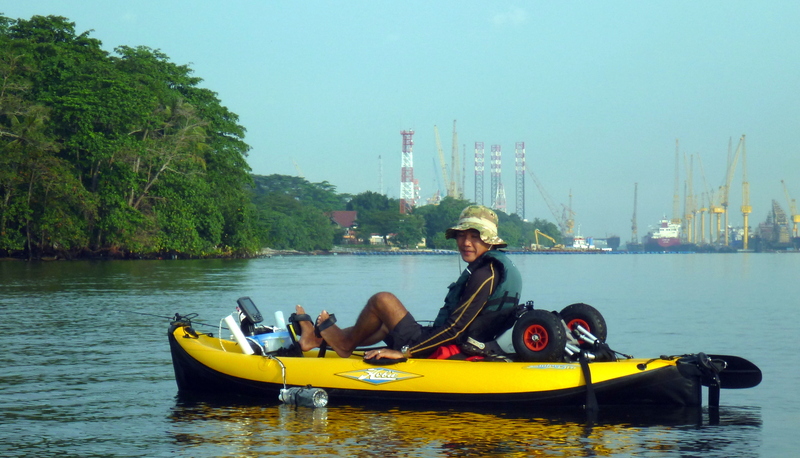 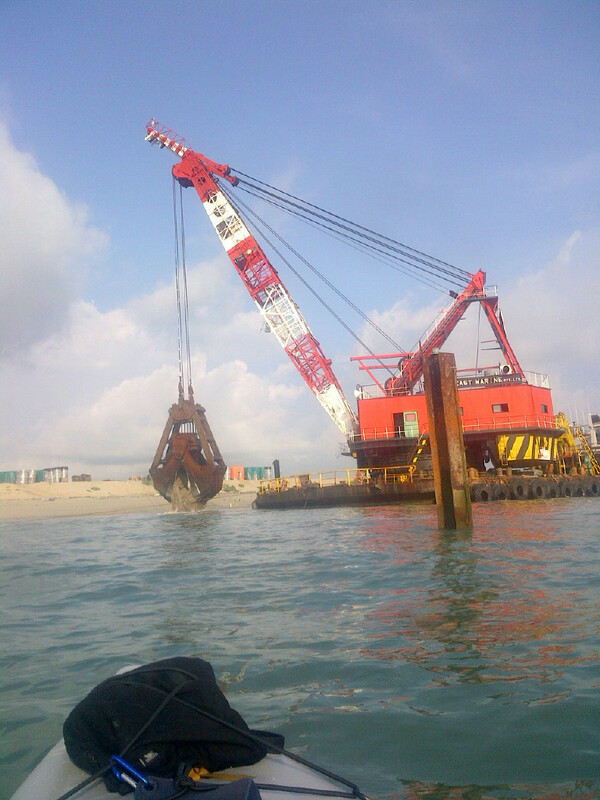 From Kukup we planned to launch the Divorce Machine and do a complete circumnavigation of Pulau Kukup Island. 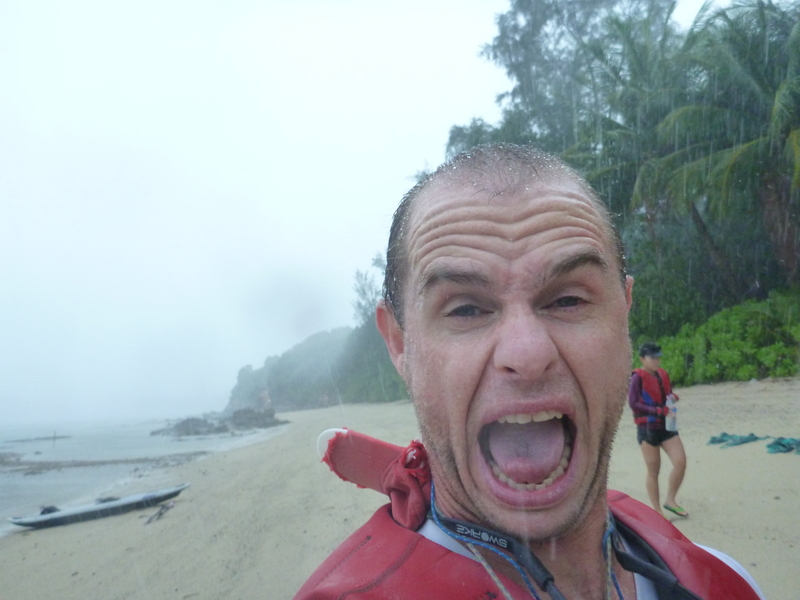 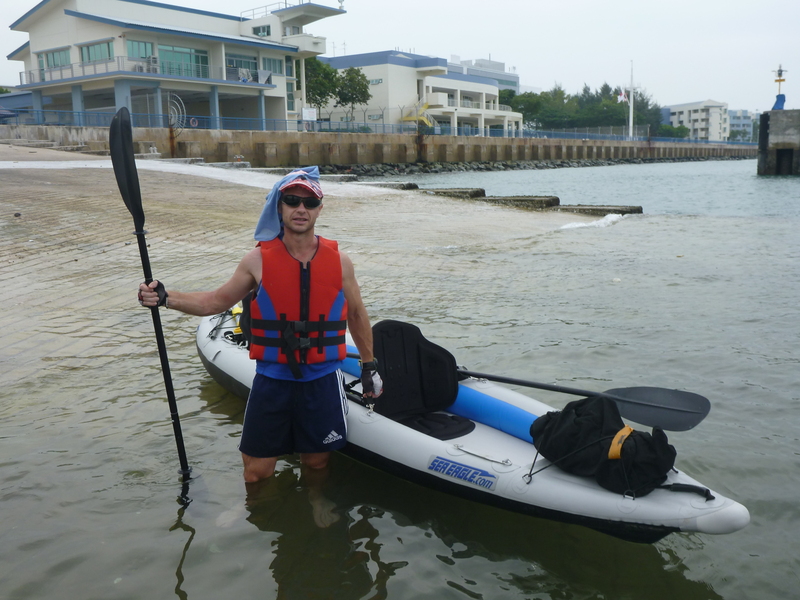 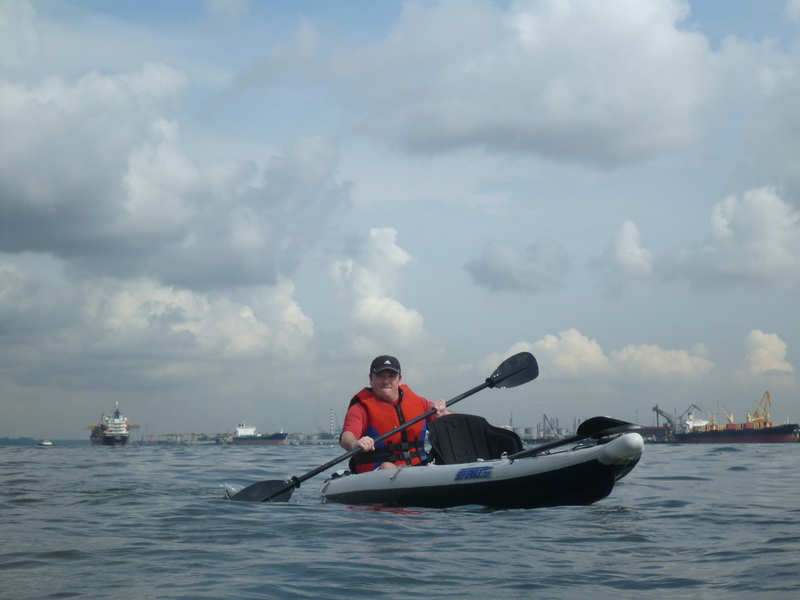 I had scoured the internet for information on kayaking around Pulau Kukup and came up empty so was looking forward to a real adventure today trying something that I had no idea was even possible. 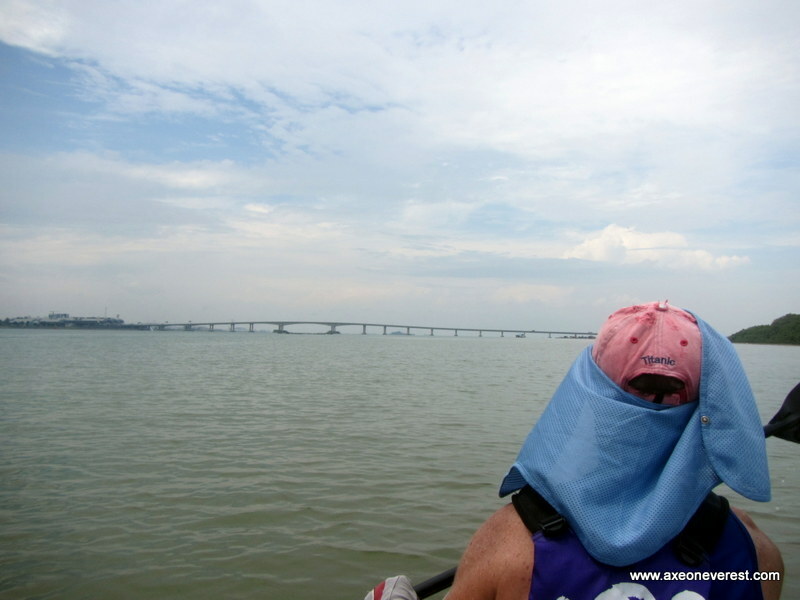 After spending 1hour and ten minutes stuck in a school holiday traffic jam crossing the 2nd link causeway into Malaysia, we got through just in time before I was forced to urinate in our water bottle(I was busting to pee and the was the only thing we had available). 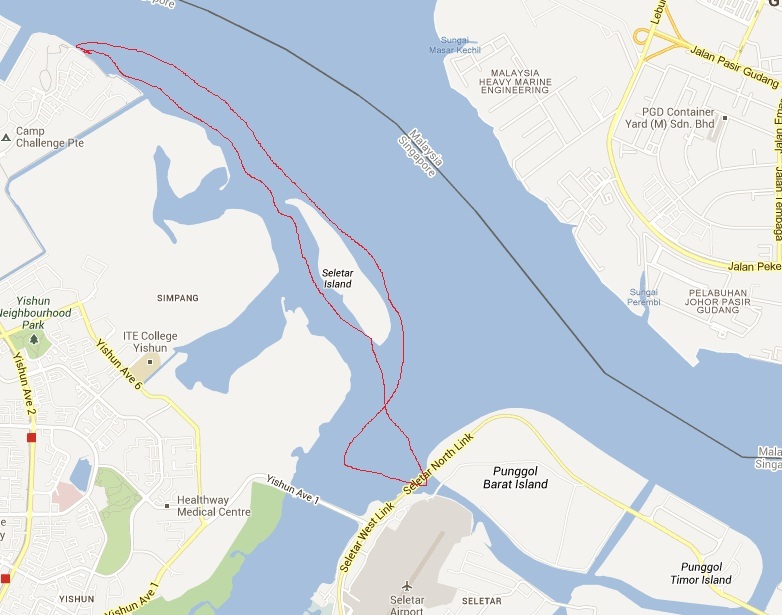 It’s approximately a one hour to drive to get to Kukup. 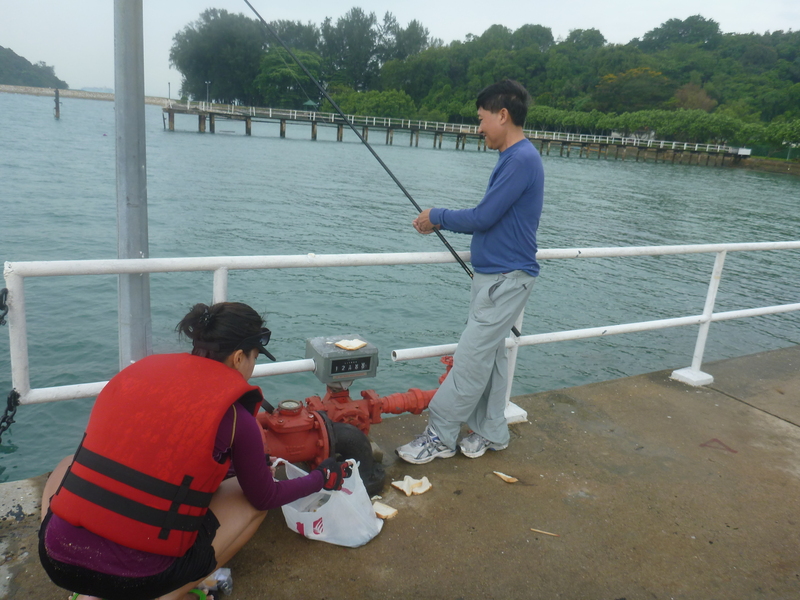 However all engines need fuel to operate and Stephanie and mine are no exception. 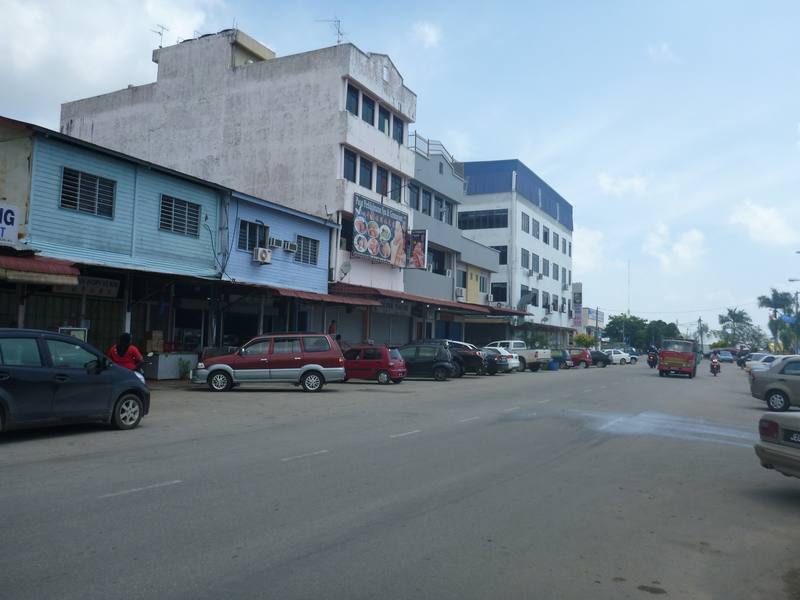 We stopped off at our favorite ‘Roti Prata’ stall in the small town of Gelang Patah. 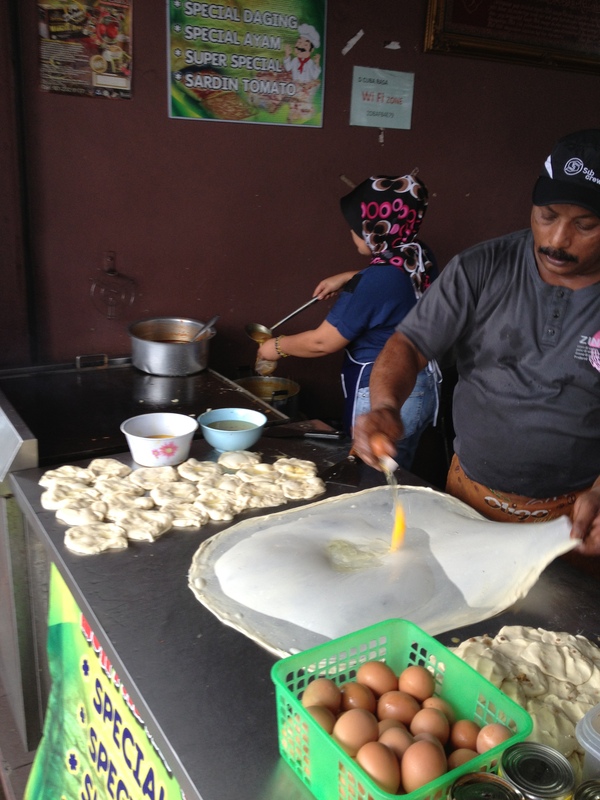 Roti Prata is an Indian type of flat, fried pancake(more commonly known as ‘Roti Canai’ in Malaysia). 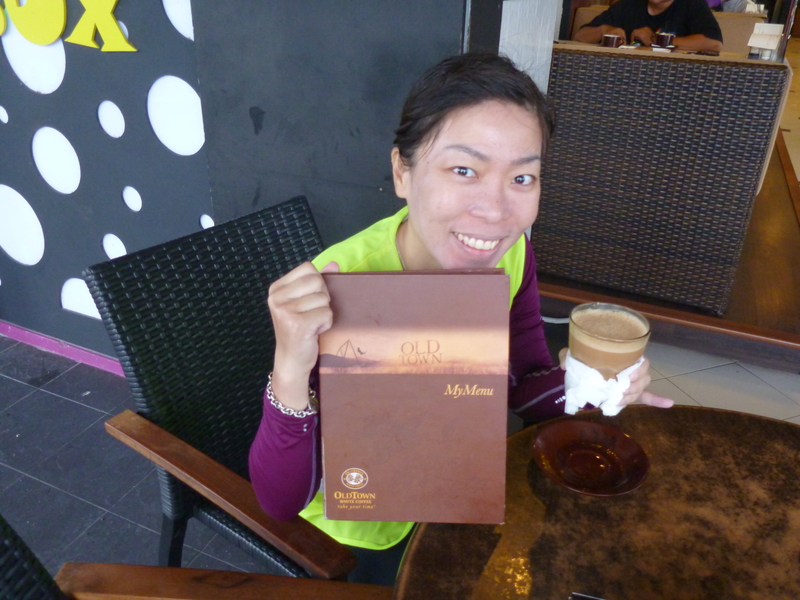 I like my Roti Prata accompanied with fish curry while Stephanie prefers hers with sugar. 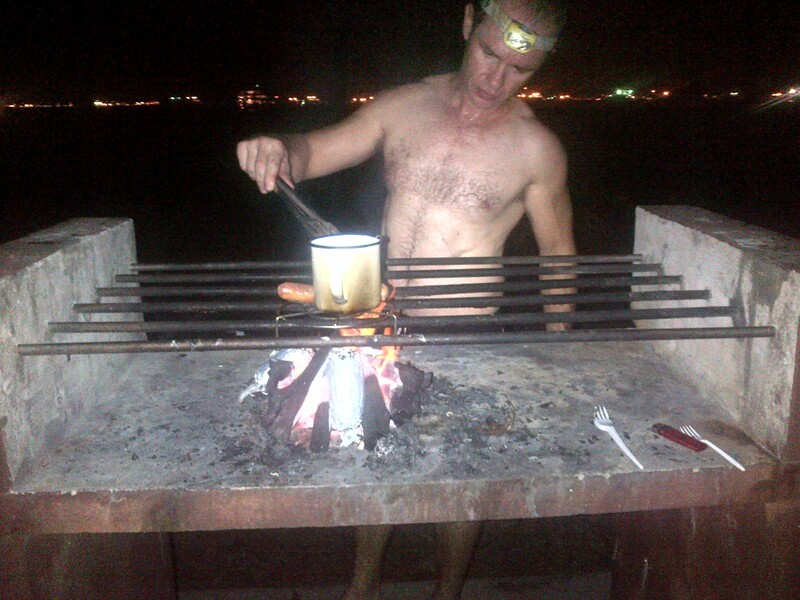 All washed down mugs of hot sweet ‘teh tarik’ (tea sweetened with condensed milk) – a perfect start to the day. 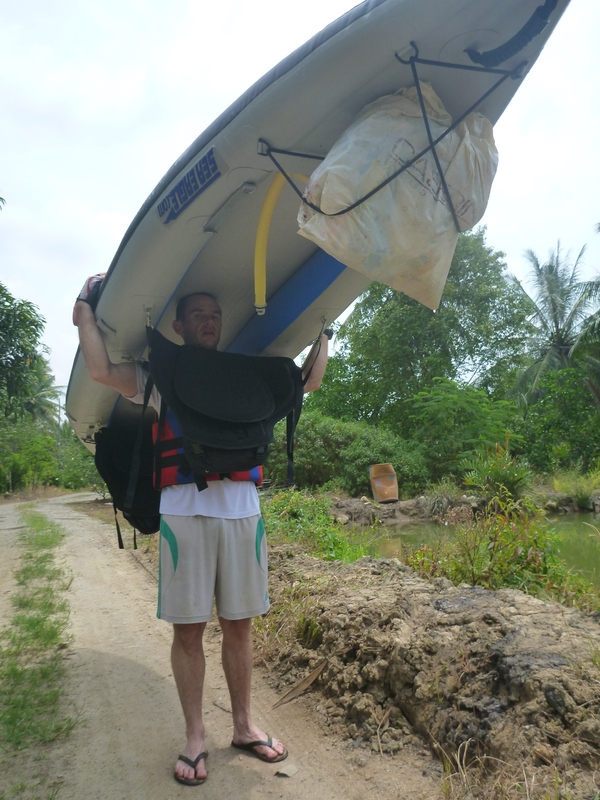 Upon arrival in Kukup village we had a small problem in finding a suitable launching spot for the Divorce Machine. 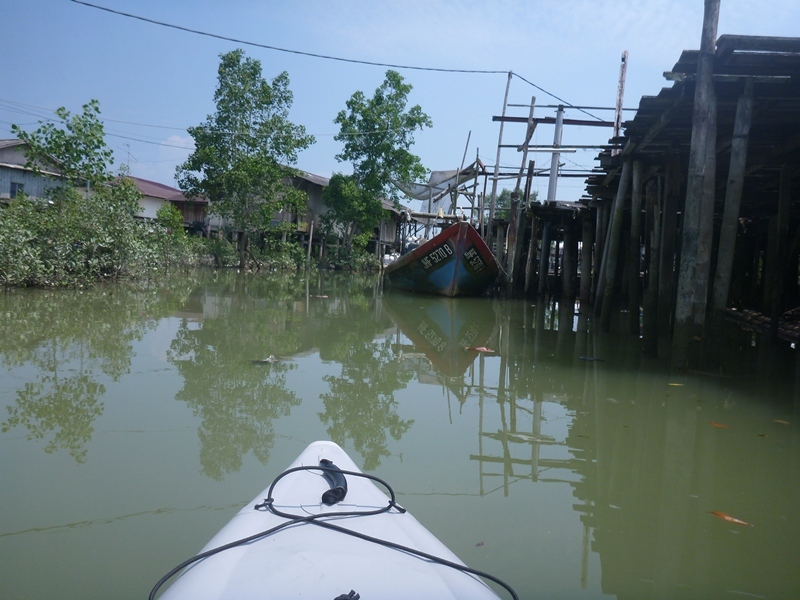 The houses along the main street back into the water but it is a busy area and not a good place to try and set up the kayak. 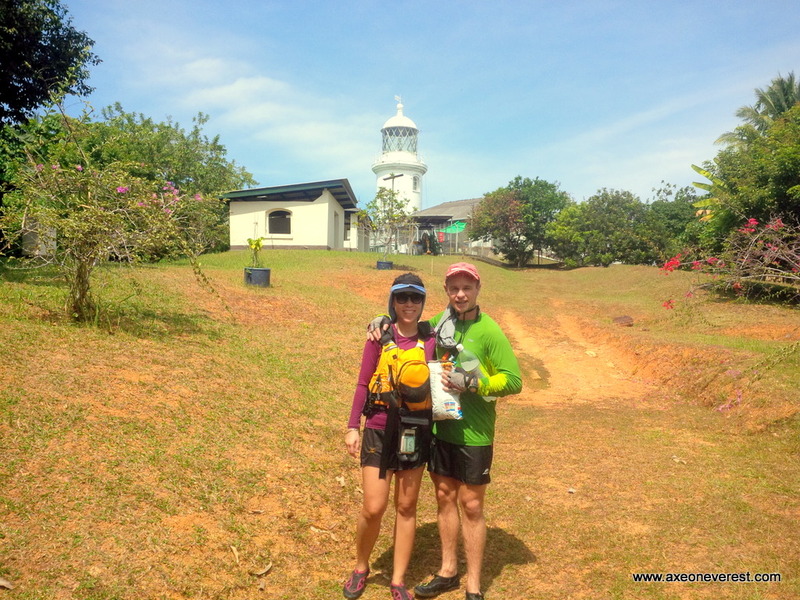 We spotted a visitor information center and I popped in to ask where we could launch from. 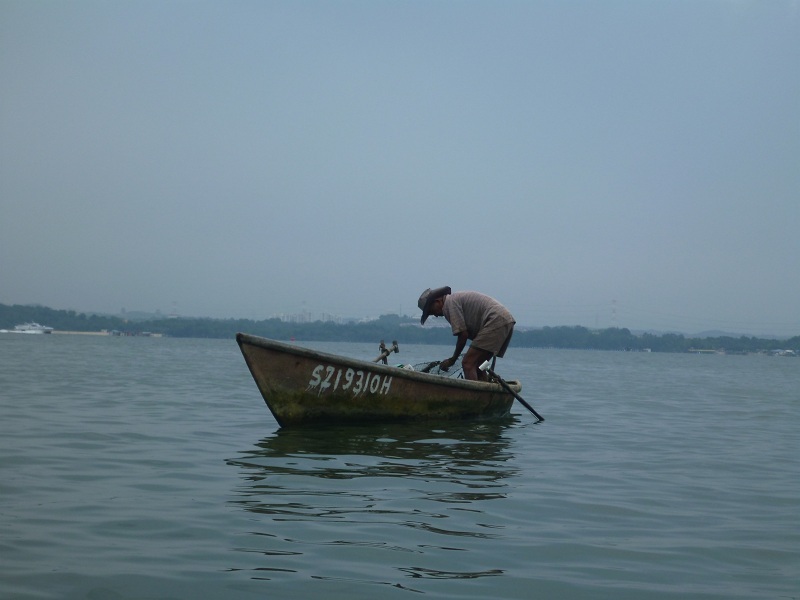 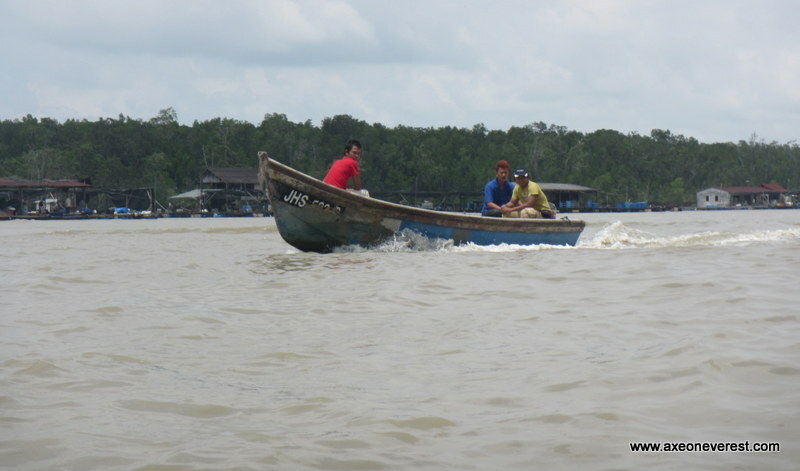 I was lucky to meet a very friendly chap who could not speak English so in my broken bahasa (malay language)I asked him where we could launch our boat. 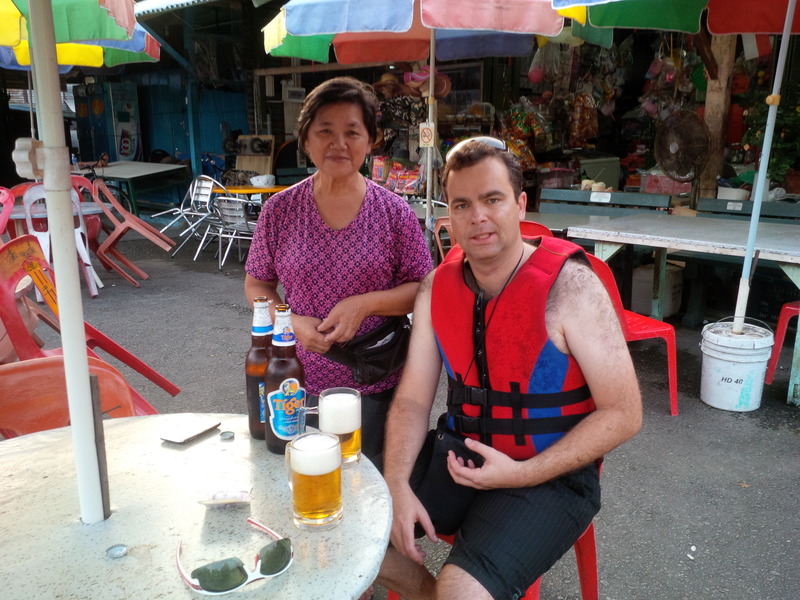 He was very helpful and offered to guide us to the local Sungei (river) on his motorbike. 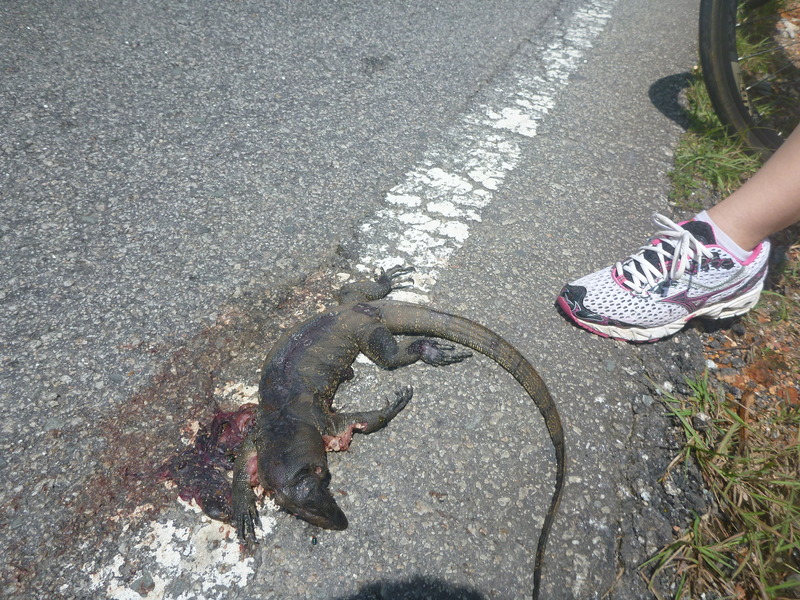 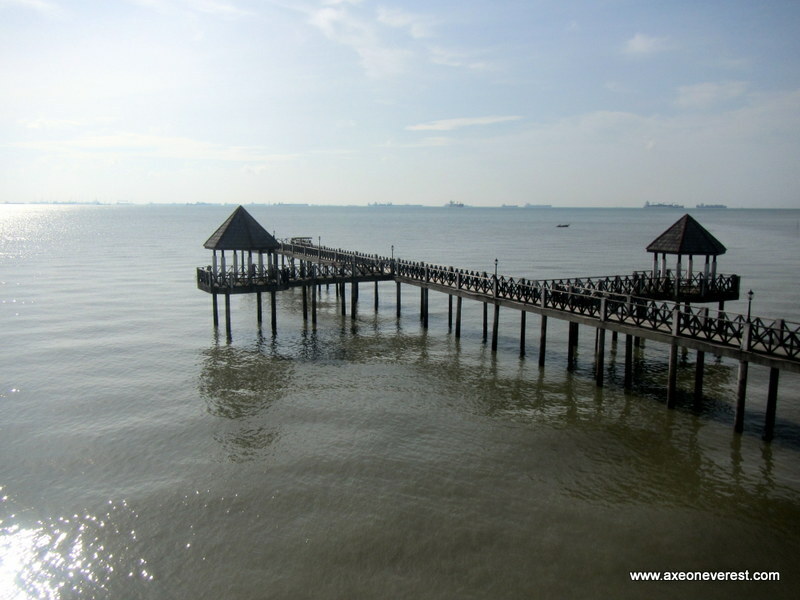 “Ada buaya dalam sungei?” I asked him (“is there crocodiles in the river?”). 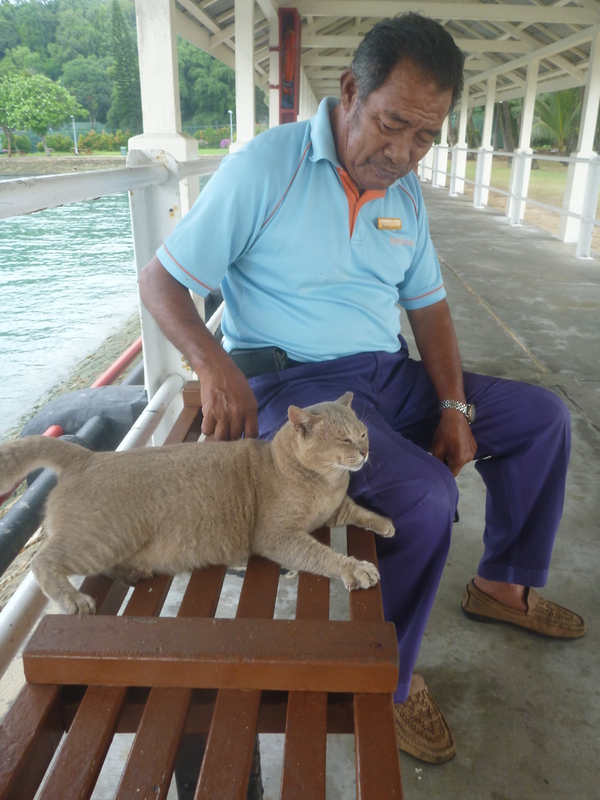 “Dula ada, skerang tedak ada” he chuckled in reply (“Last time there was but now not anymore”). 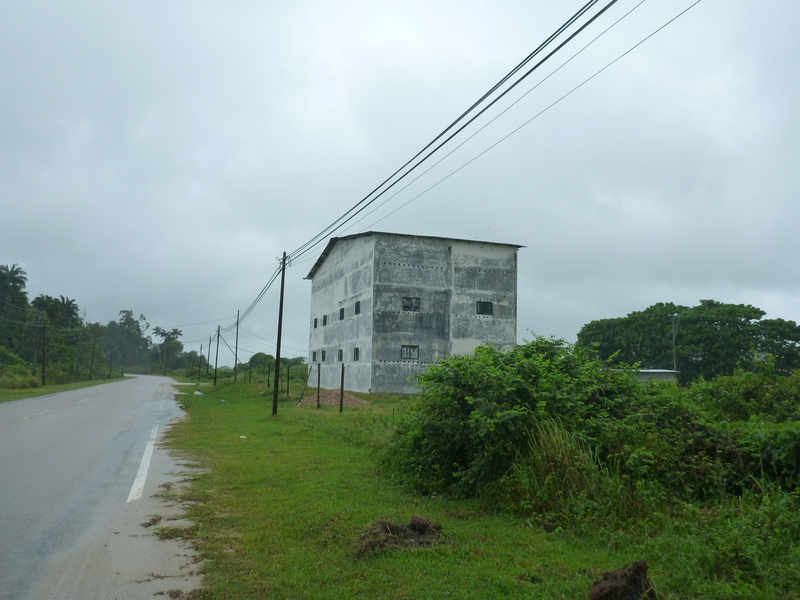 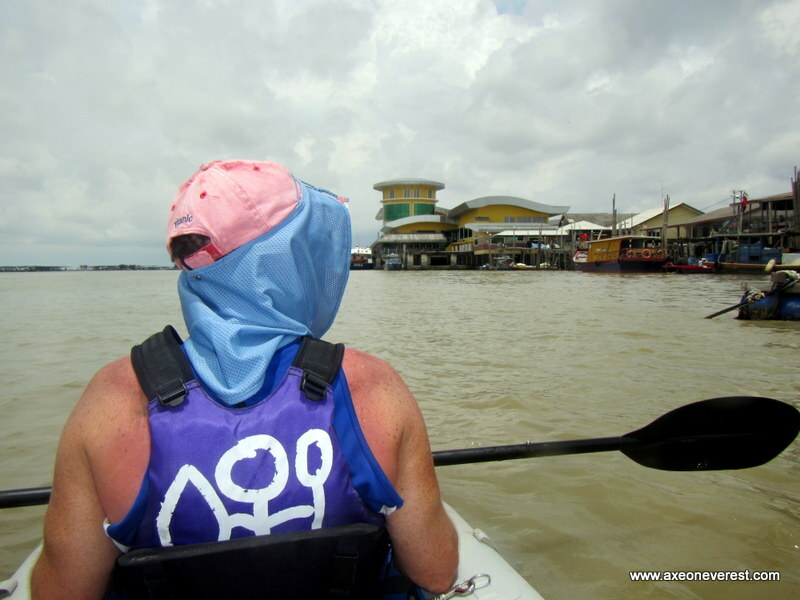 We drove behind him for a few hundred meters down a small lane lined with many small basic houses built on stilts. 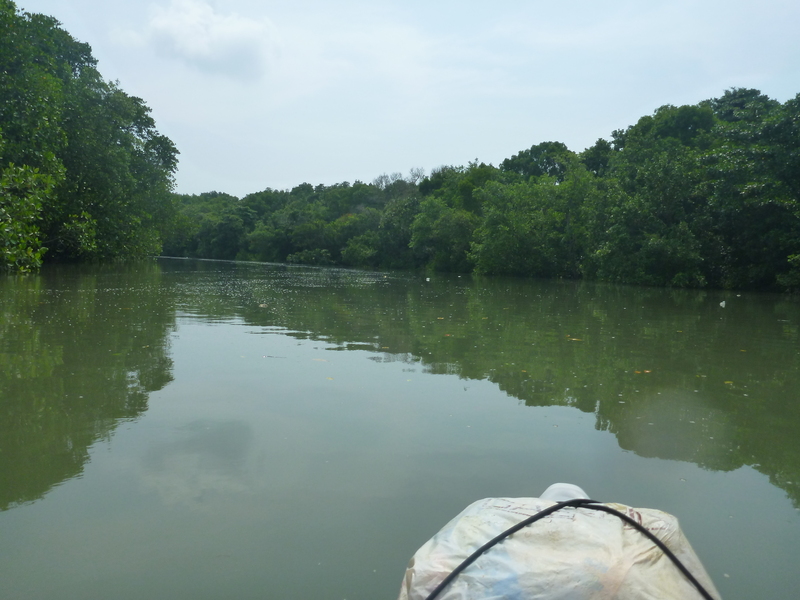 It looked like the inhabitants throw their rubbish directly into the swamp below their houses as litter lined the area. 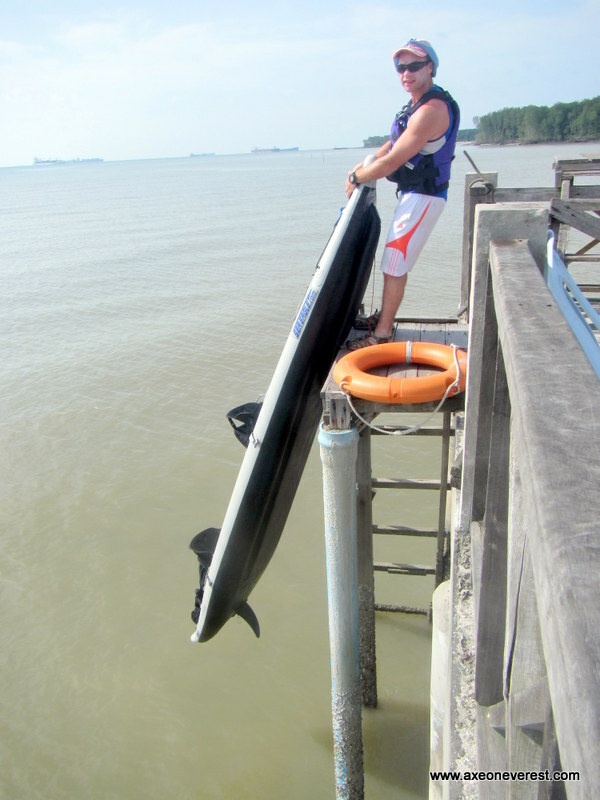 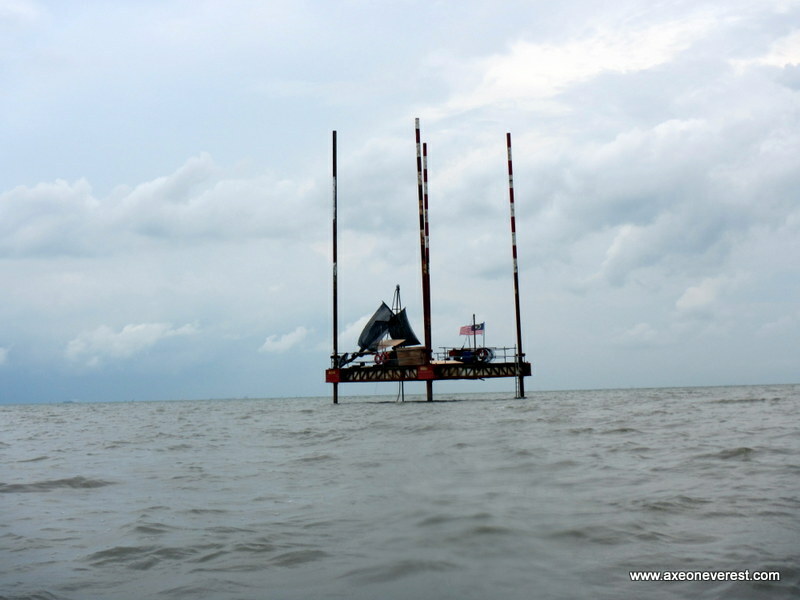 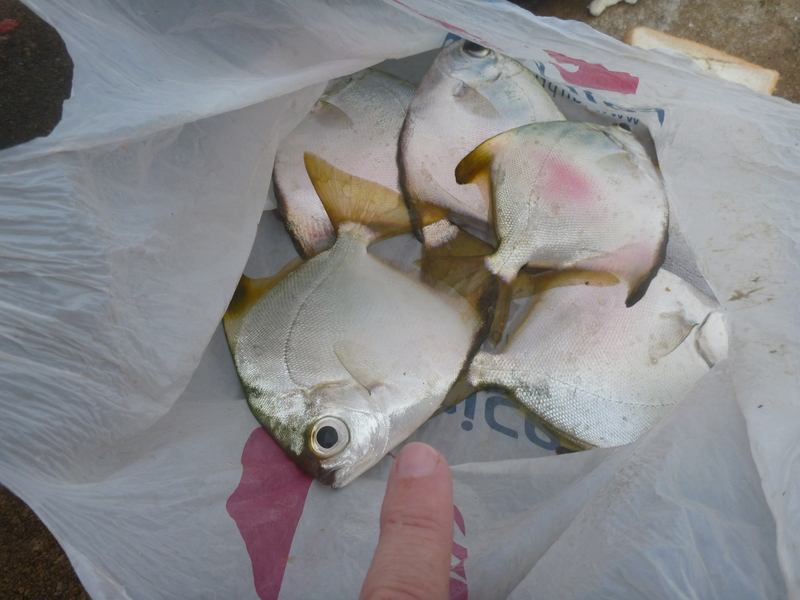 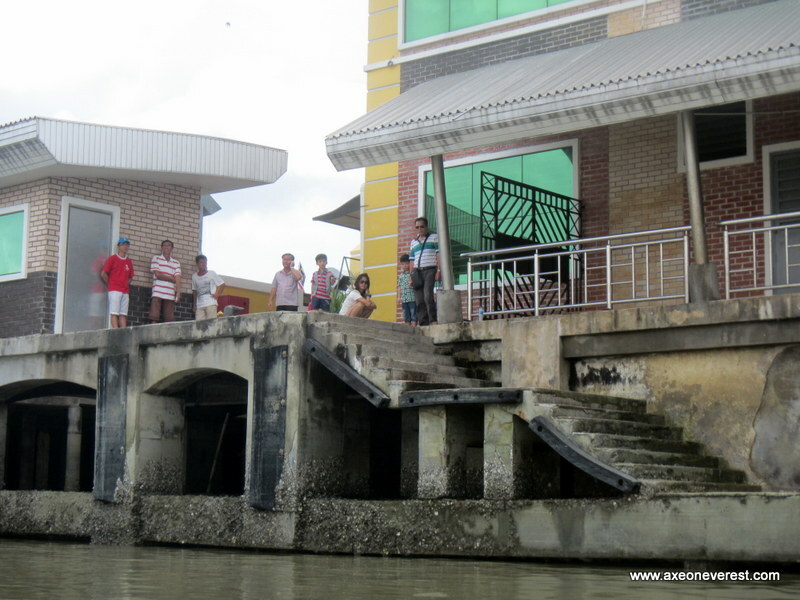 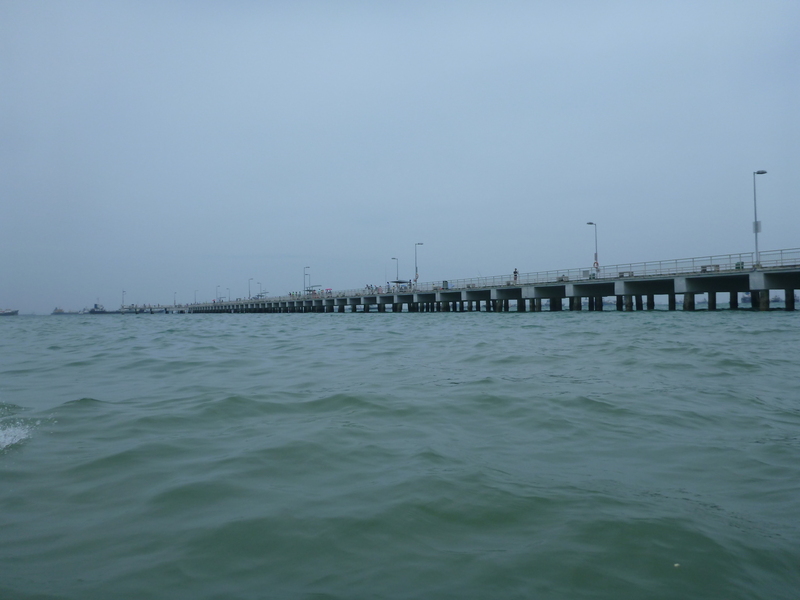 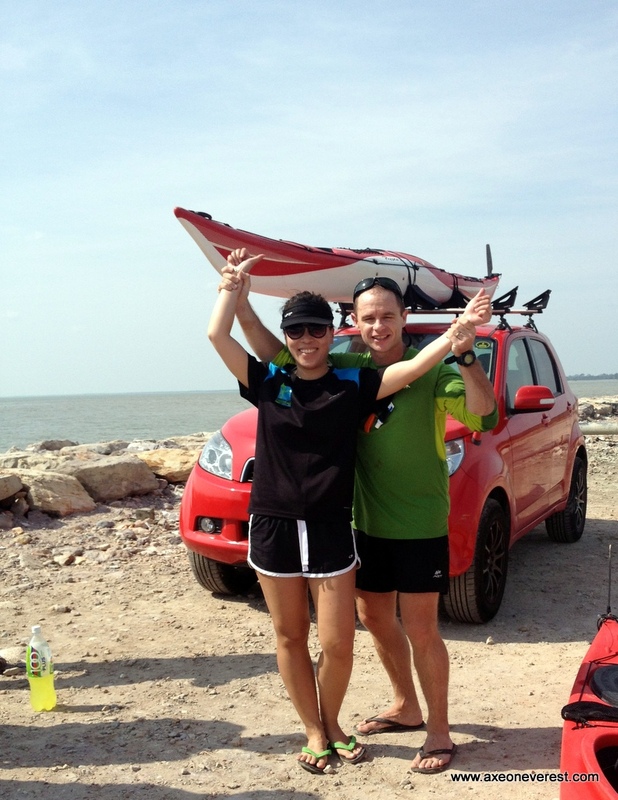 We soon found the small launching point at Jetty Nelayan Pengkalan Tok Ali. 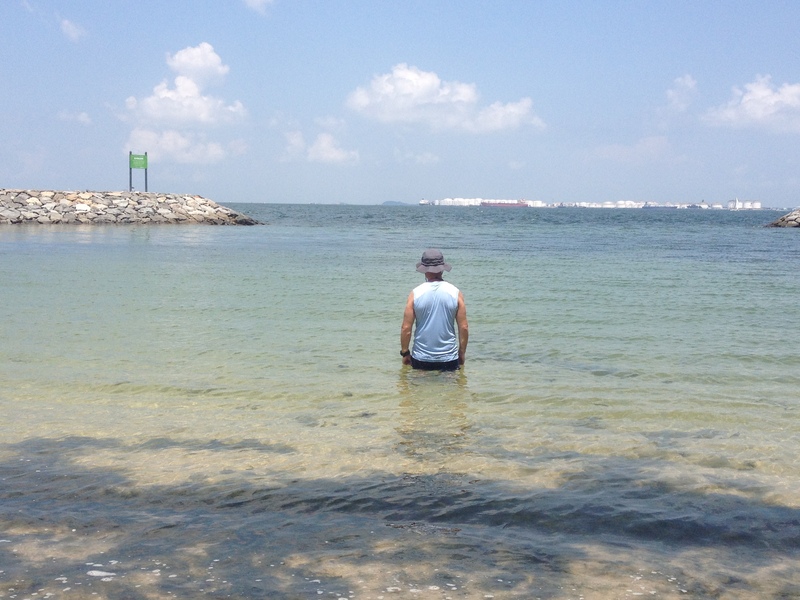 It was a sweltering hot day as we quickly set-up the Divorce Machine. 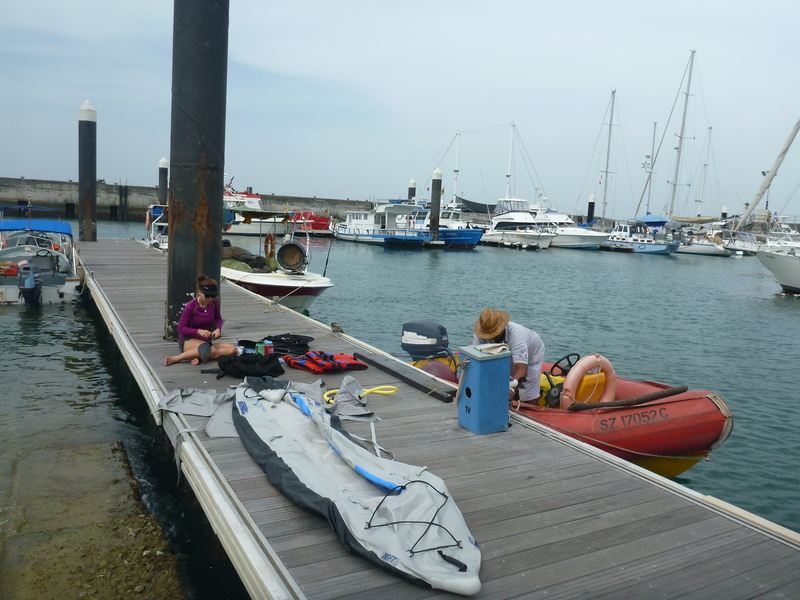 We are getting quick at this now and in less than ten minutes were ready to go. 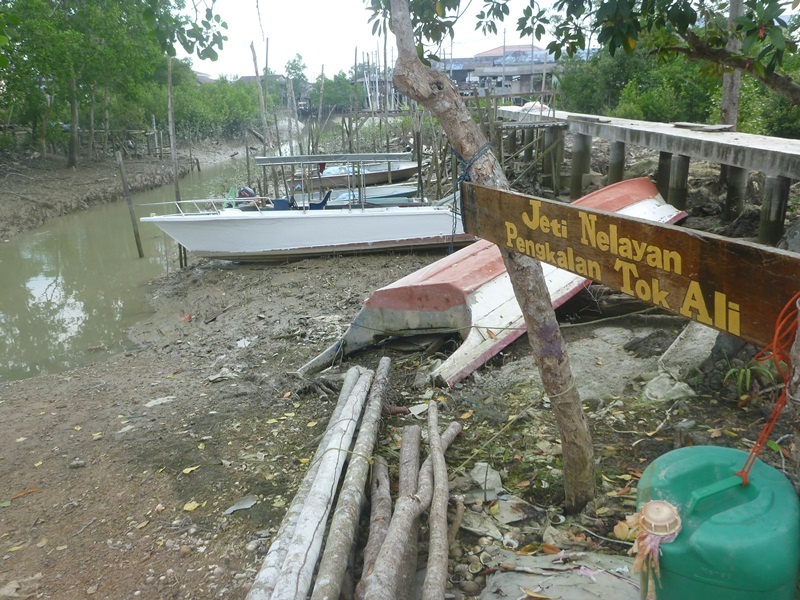 Jetty Nelayan Pengkalan Tok Ali where we launched from. 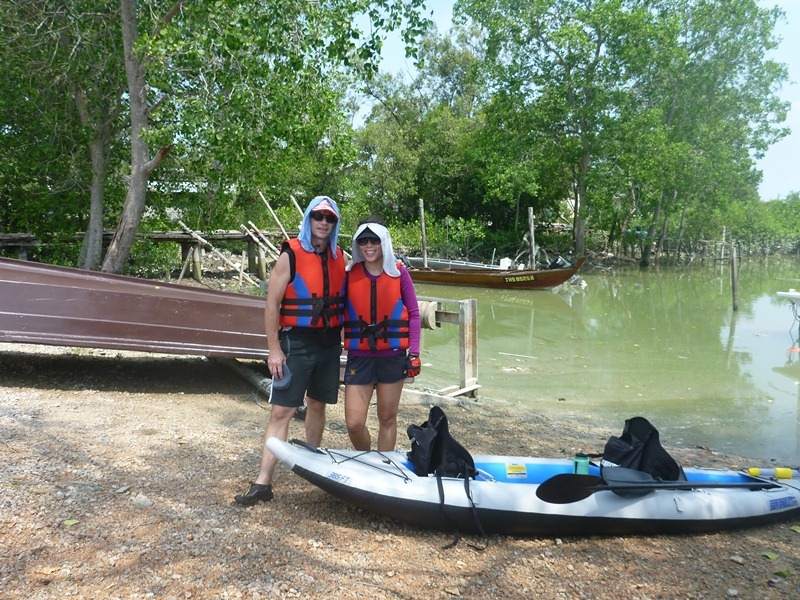 Ready to launch together with Stephanie with our new sun shields which were very helpful in the hot sun. 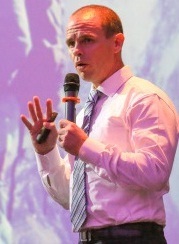 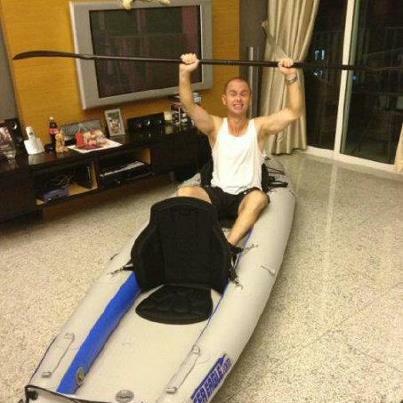 Skipper of the Divorce Machine ready to go. 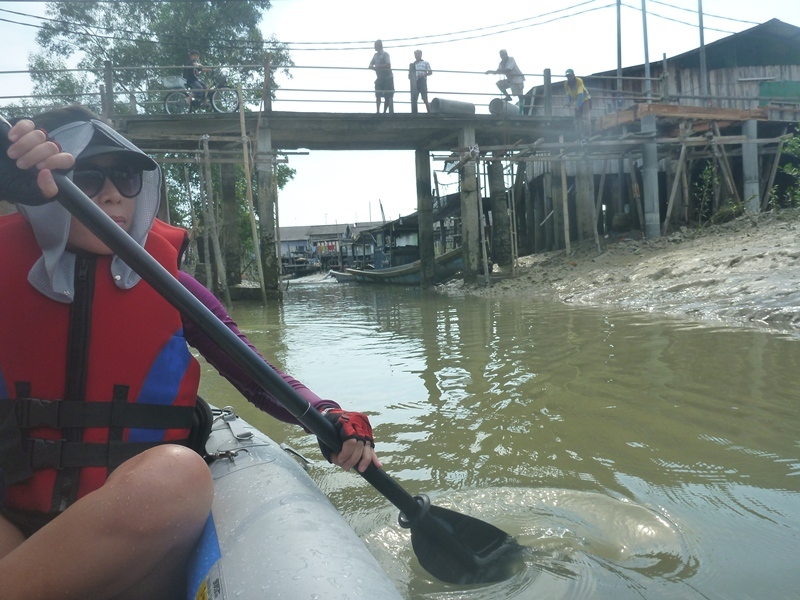 I made my usual mistake and did not bring enough water and was already feeling very thirsty as we paddled slowly out the small river past the rows of houses in stilts. 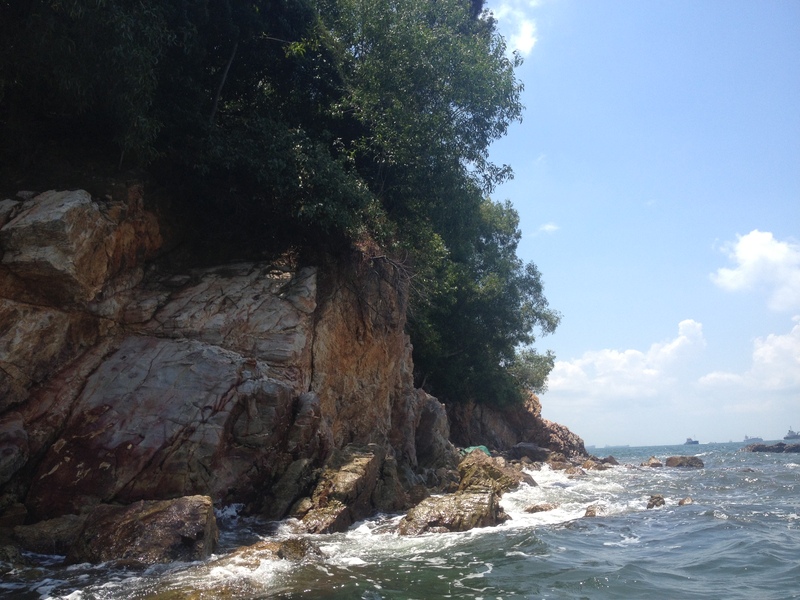 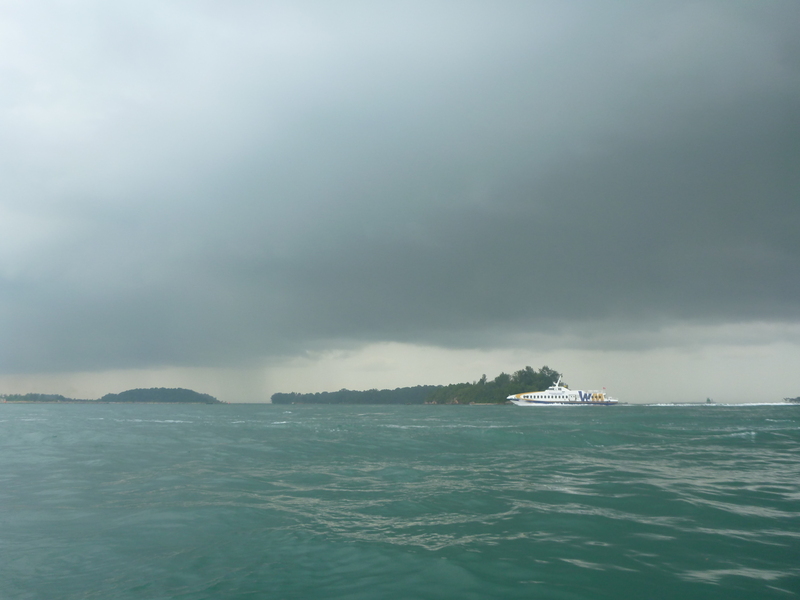 We soon reached the strait between Kukup and Pulau Kukup (Pulau means ‘Island’ in Malay). 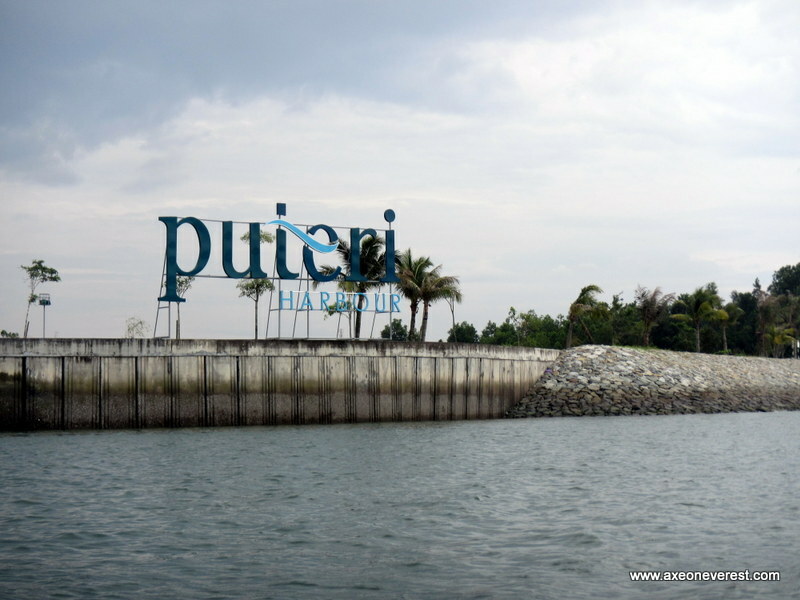 Pulau Kukup is said to be the second largest uninhabited Mangrove Island in the world. 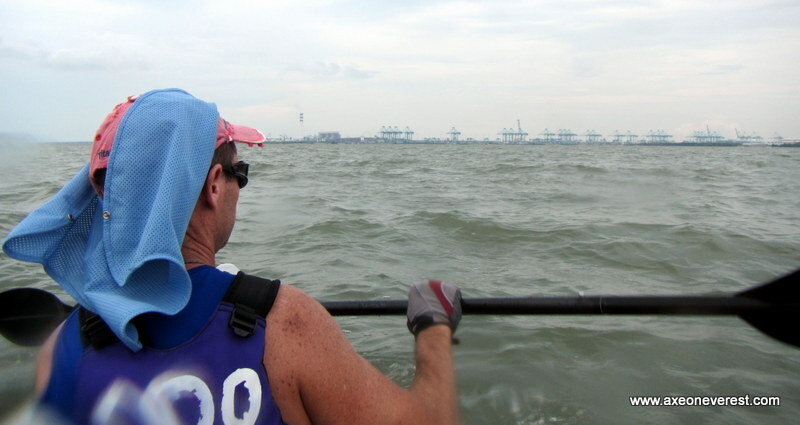 The distance across the small Strait varies from between 500 – 1000m. 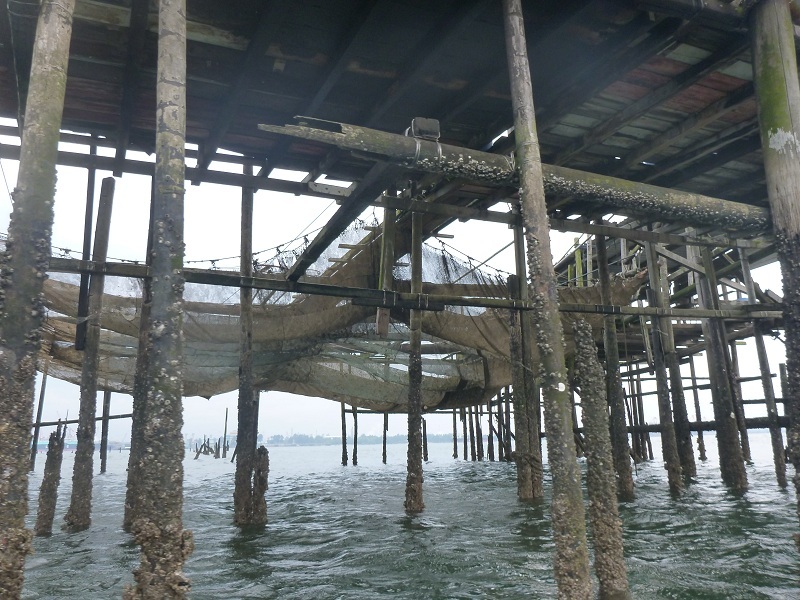 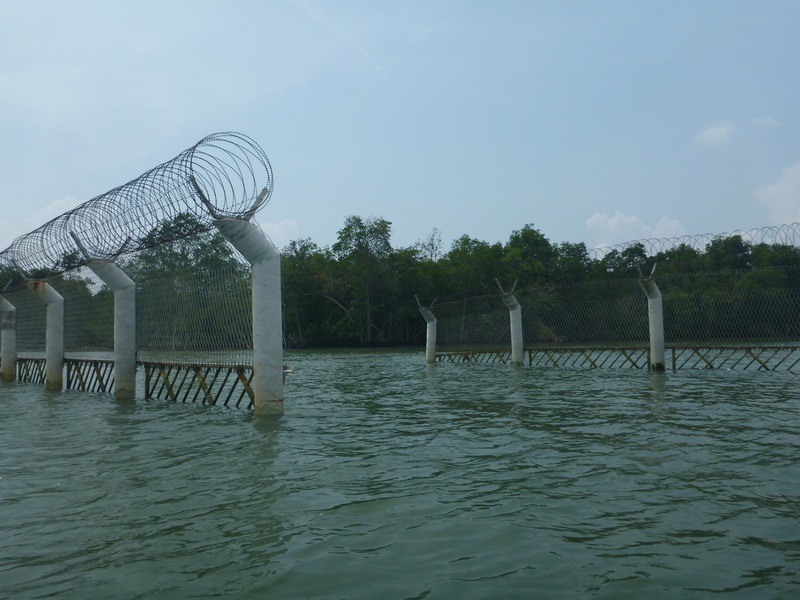 The strait is lined with floating fish farms. 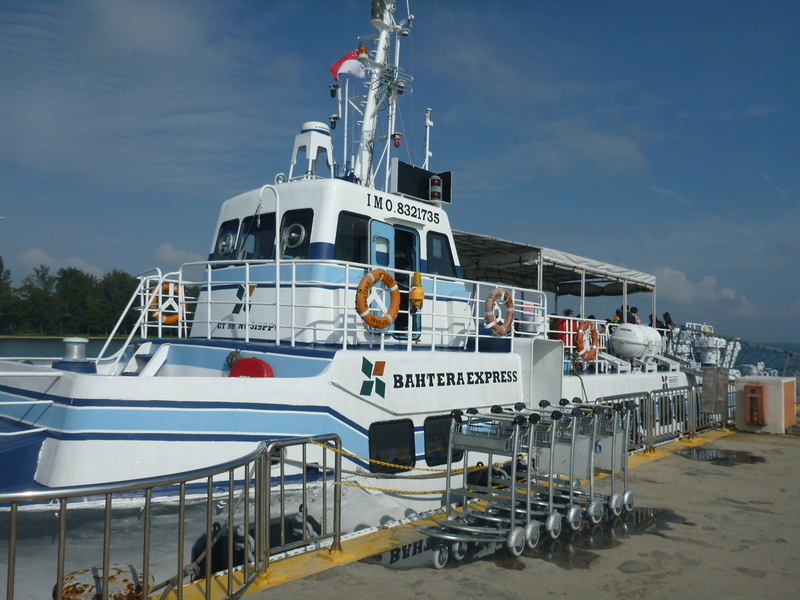 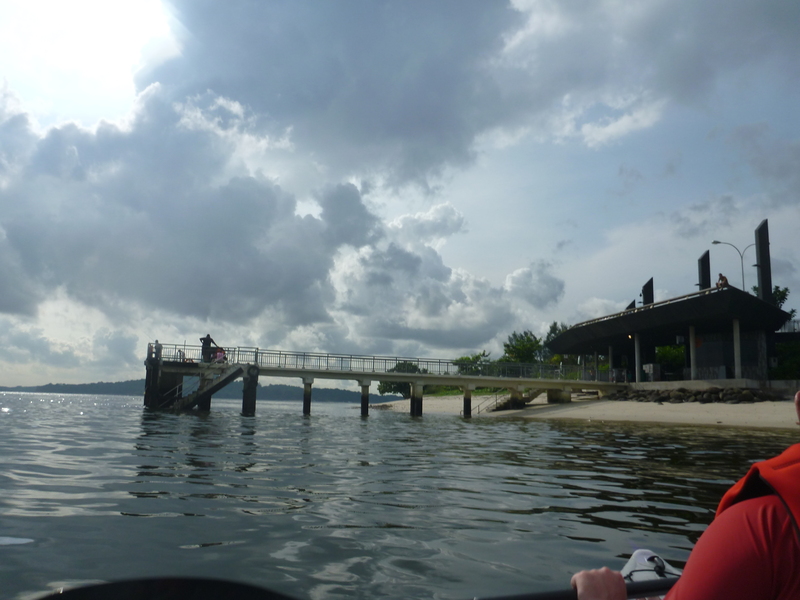 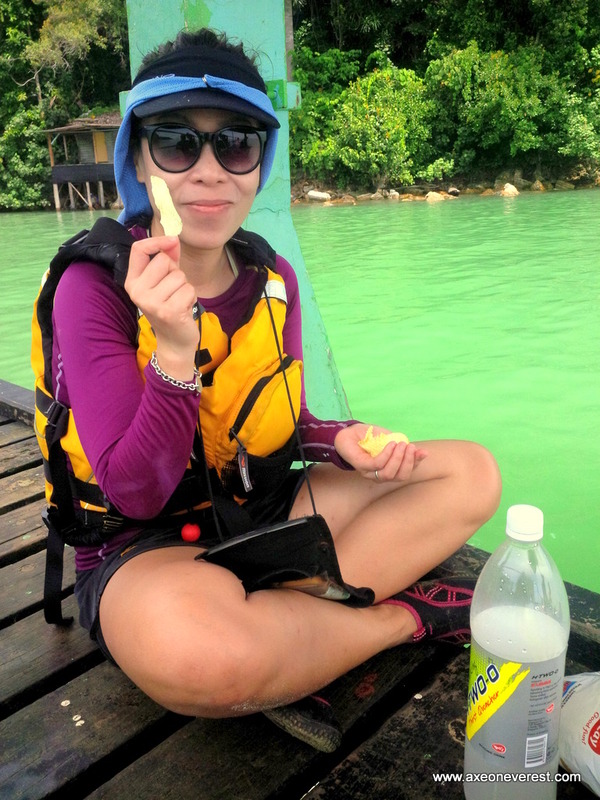 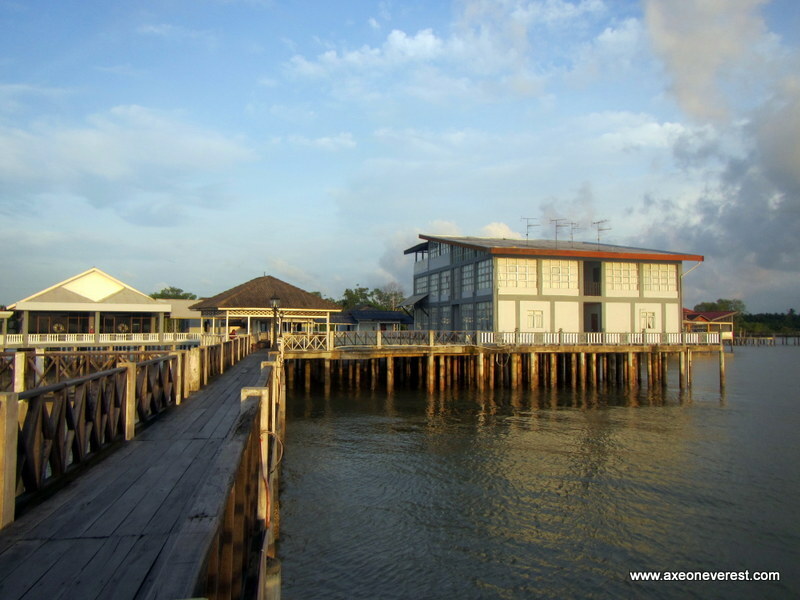 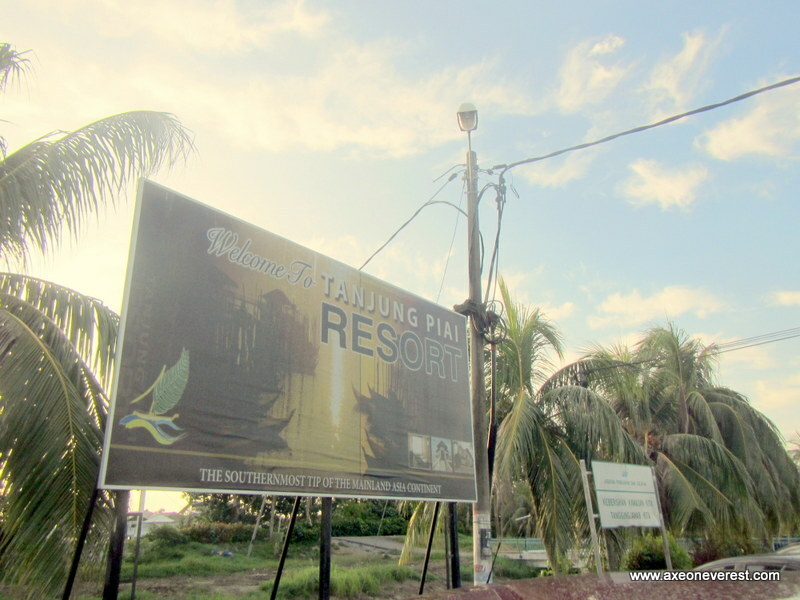 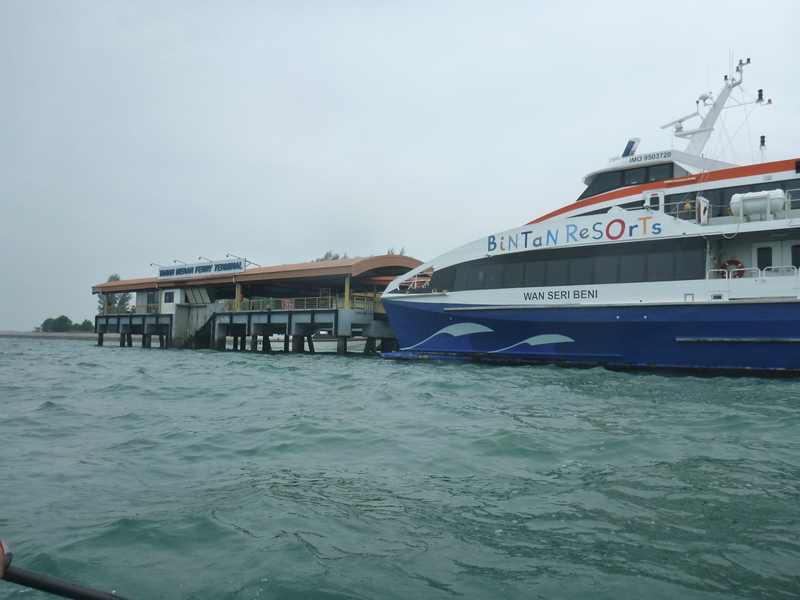 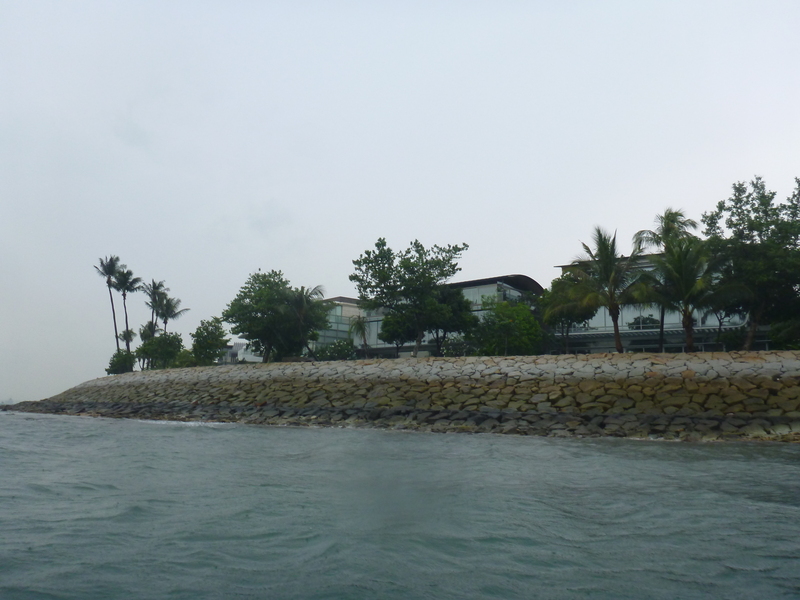 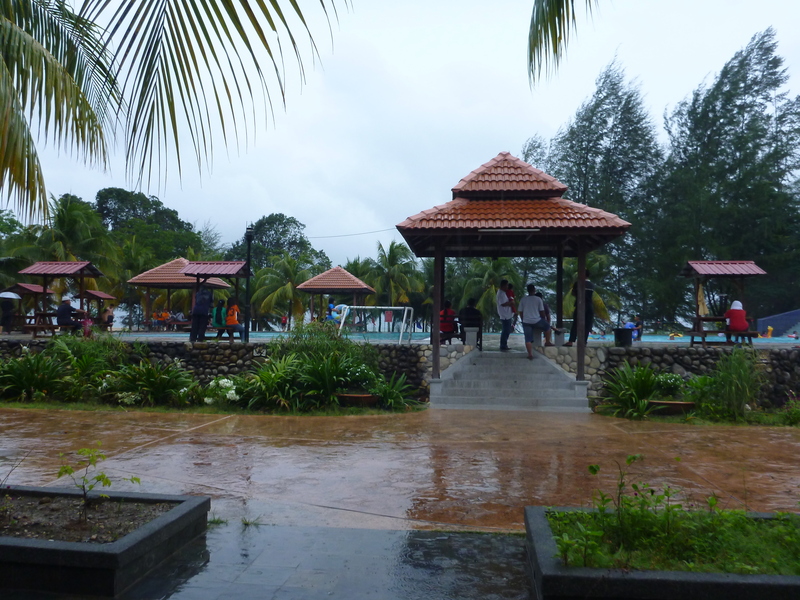 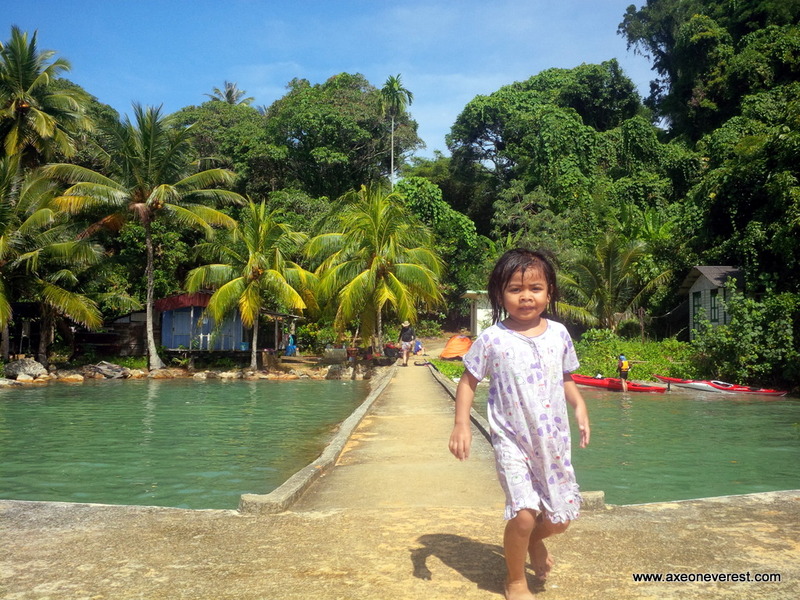 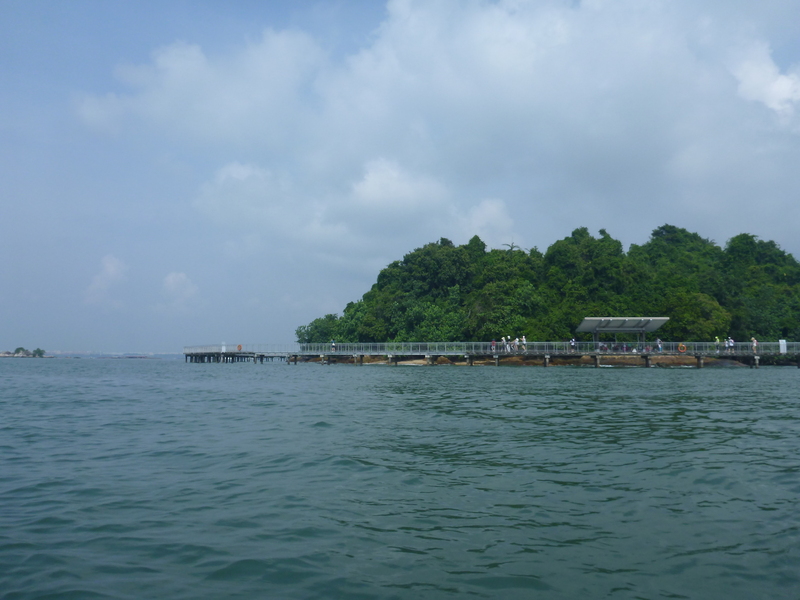 You can take a small ferry across to Pulau Kukup and go for a walk along the board walks there. 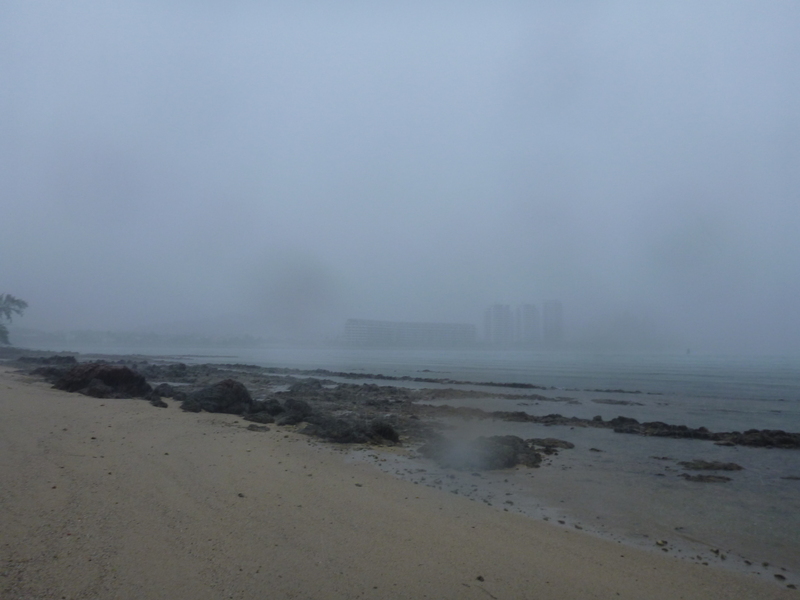 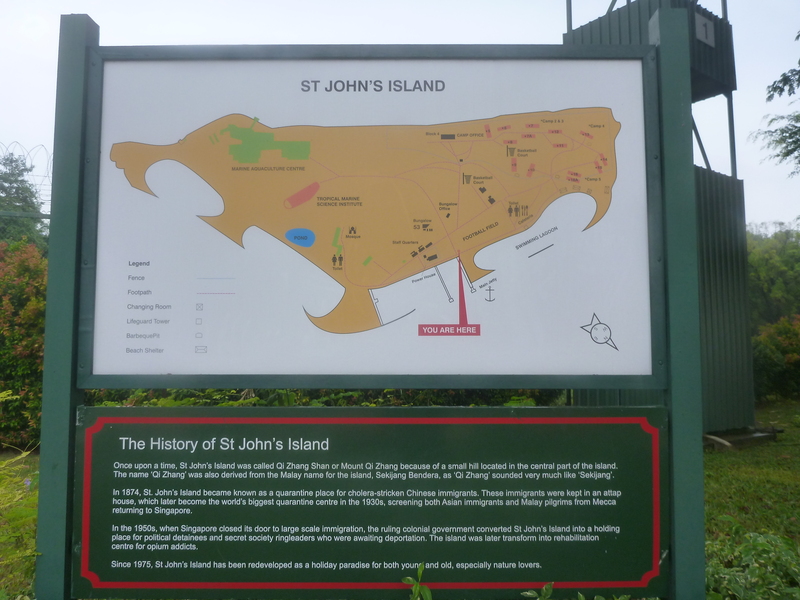 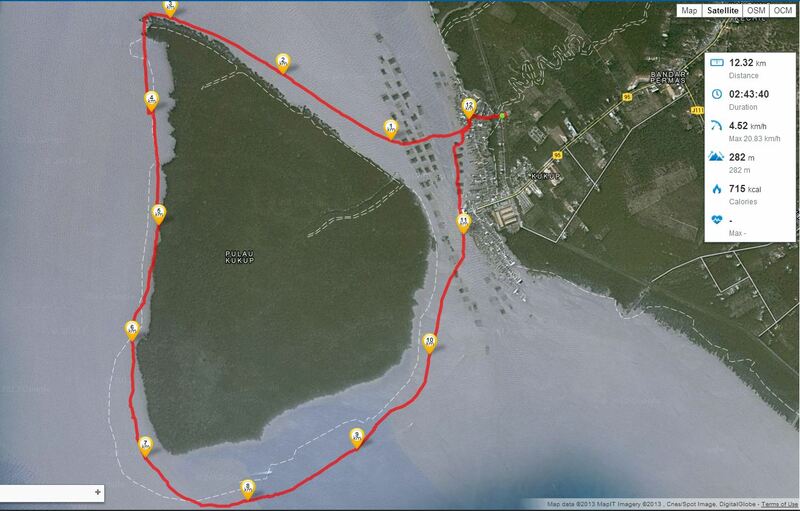 Our plan was to circumnavigate the island, which meant a total round trip distance of about 12km. 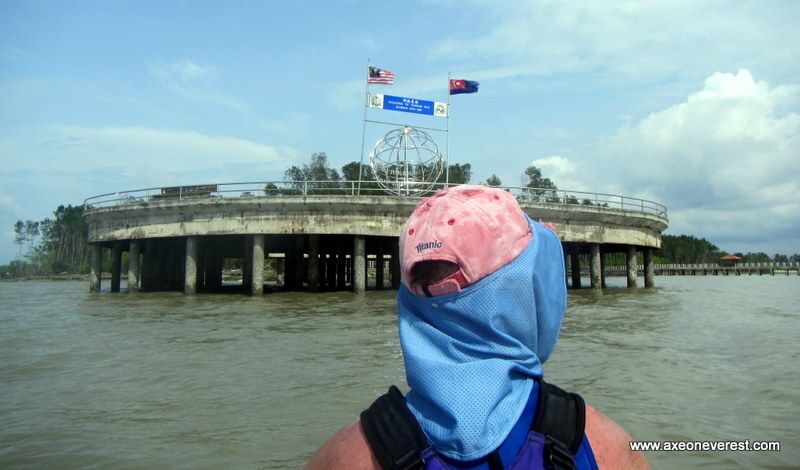 We paddled north first and soon left the fish farms and the human population behind. 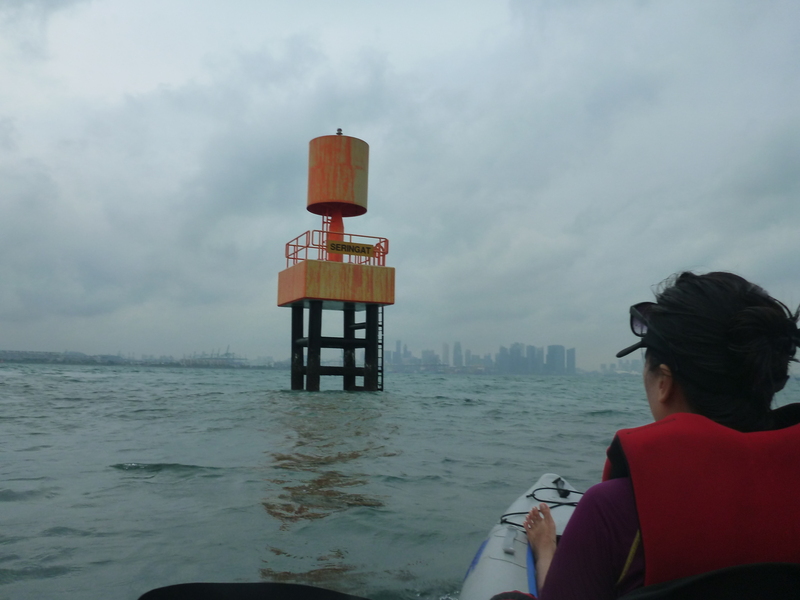 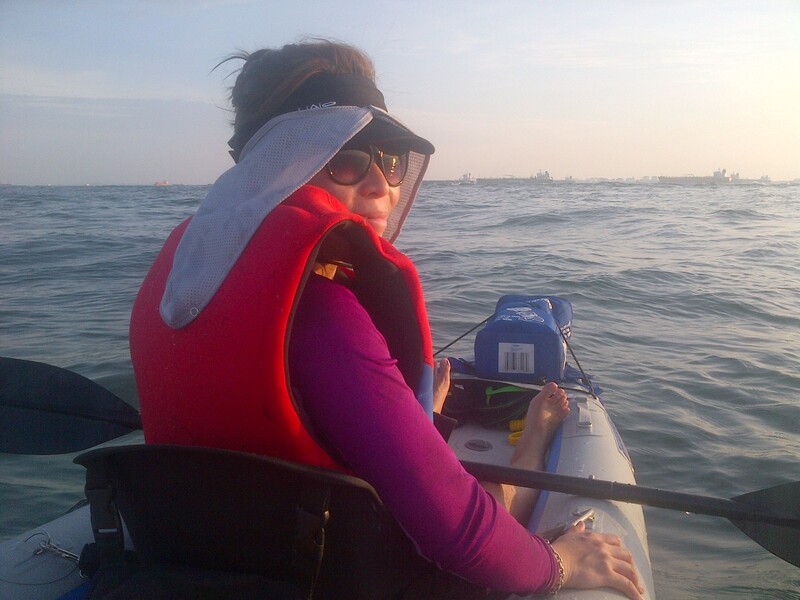 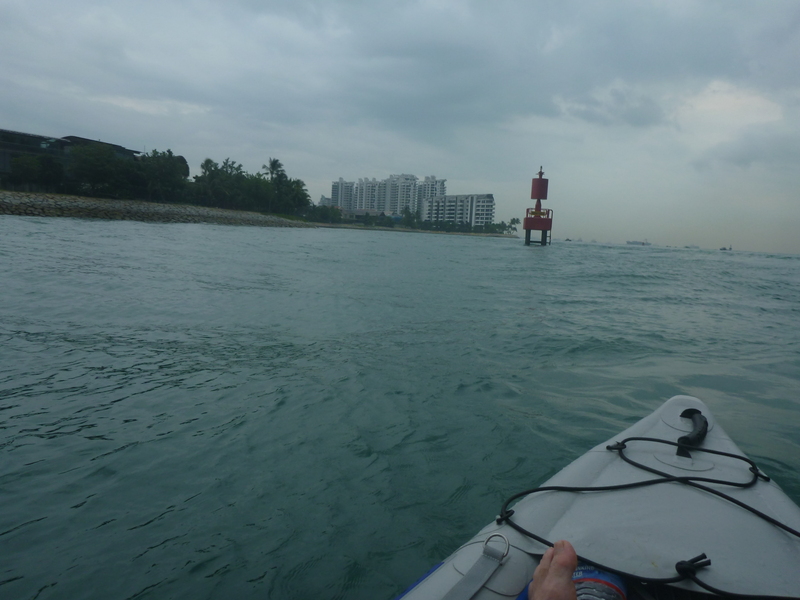 It was incredibly peaceful as we glided along and soon reached the northern tip of Pulau Kukup. 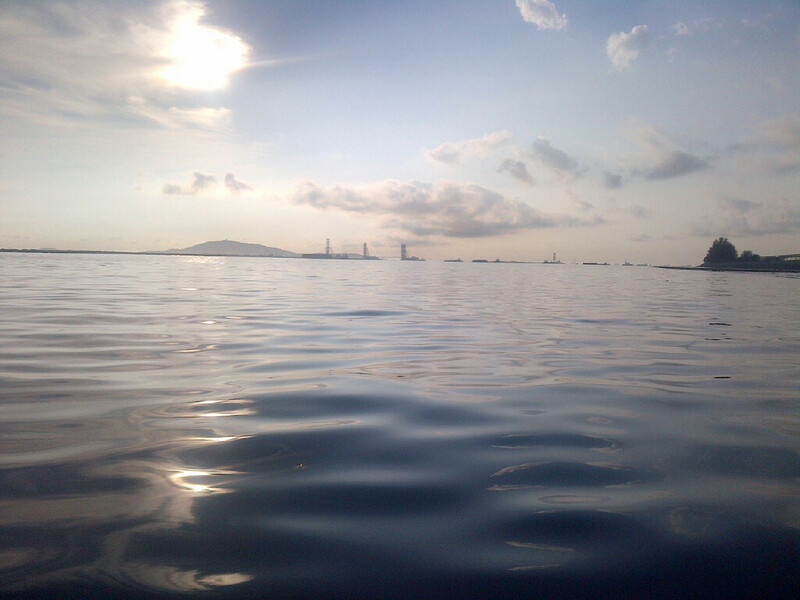 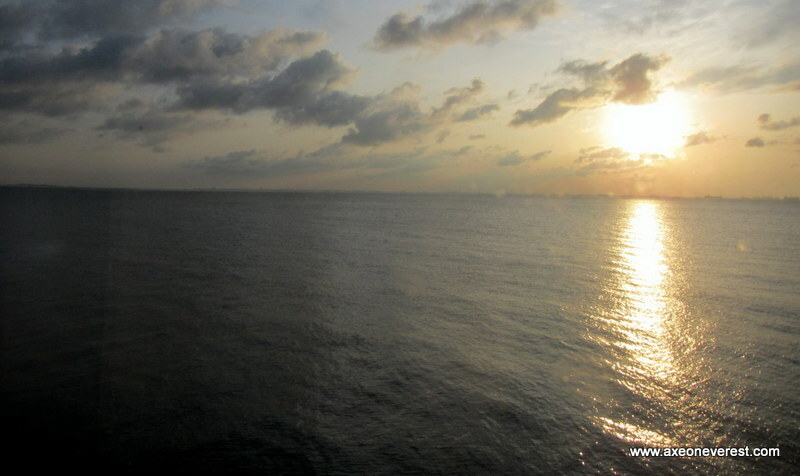 The sea was calm and with no wind at all the sun beat down mercilessly. 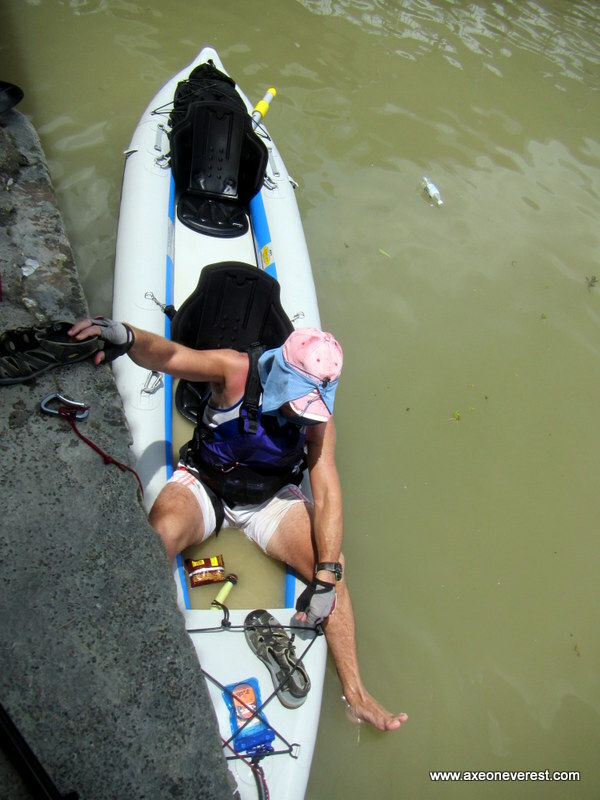 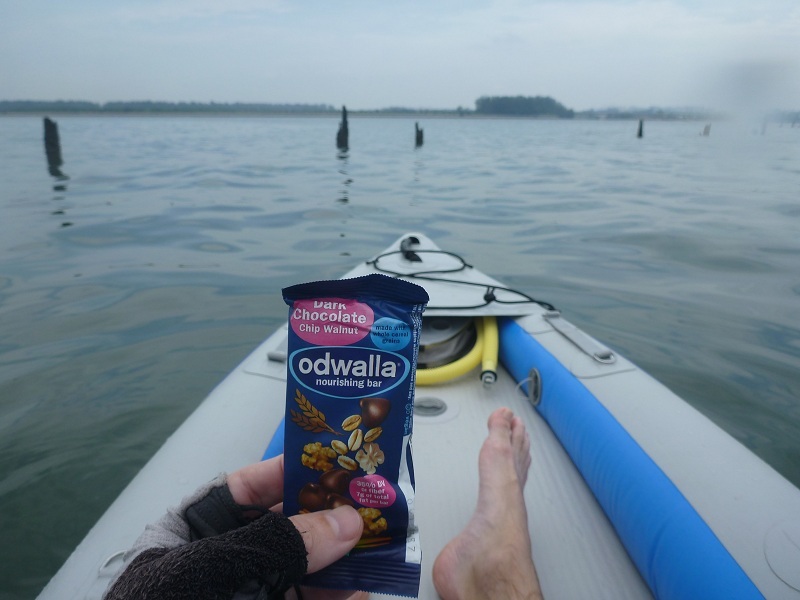 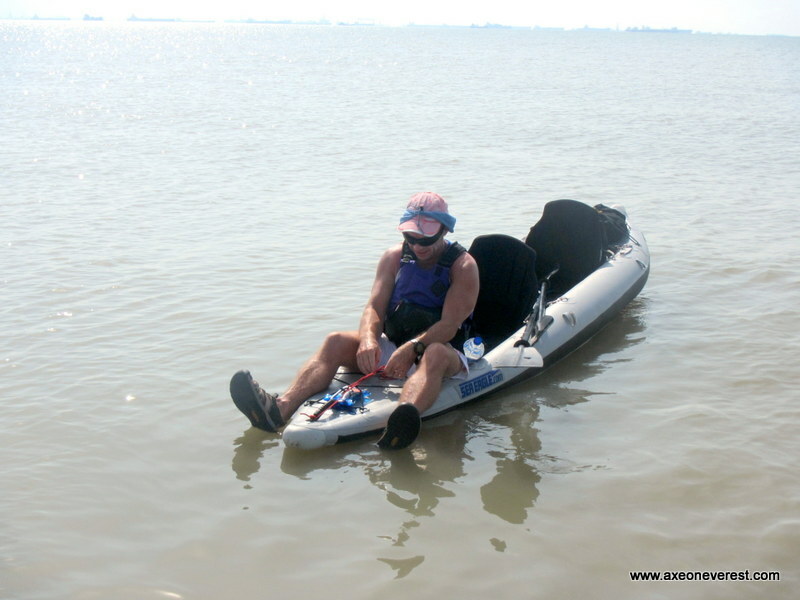 I was soon feeling very hot and thirsty and knew it was going to be a long paddle without much water. 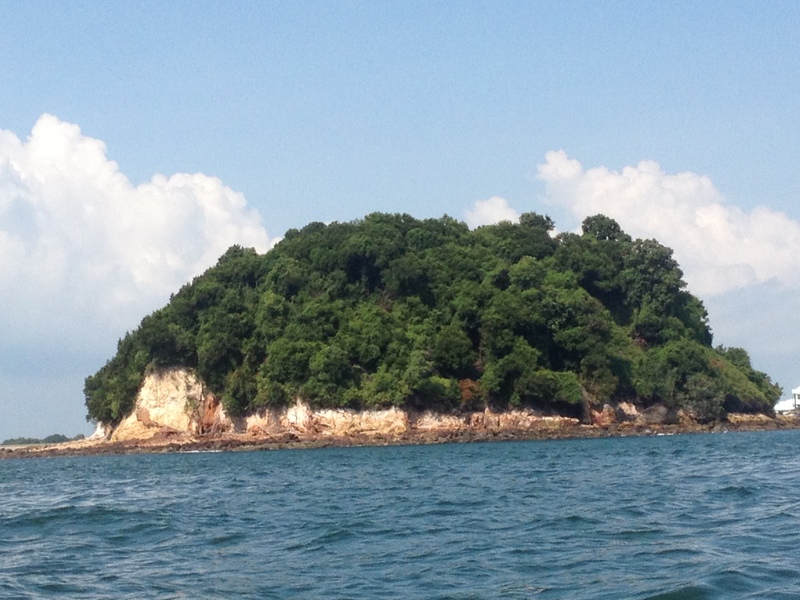 As we came back down the western side of Pulau Kukup the magic of this beautiful mangrove Island became more apparent. 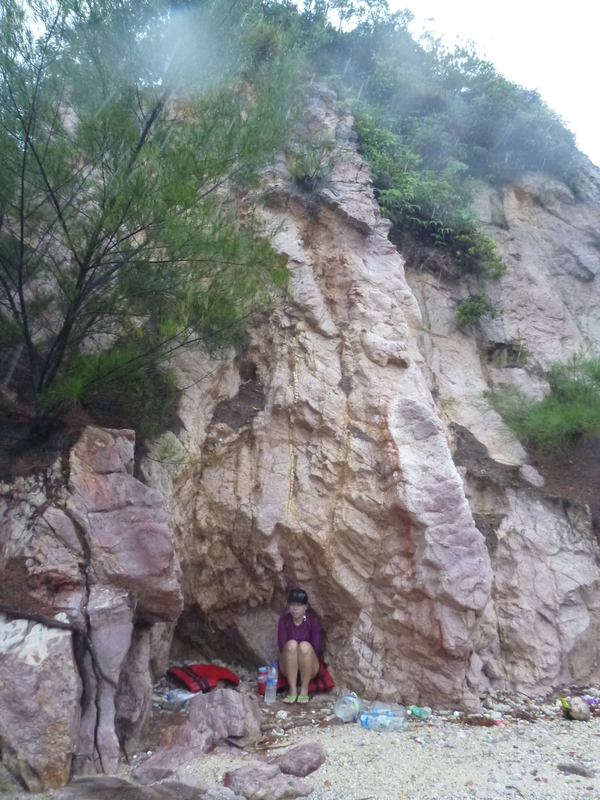 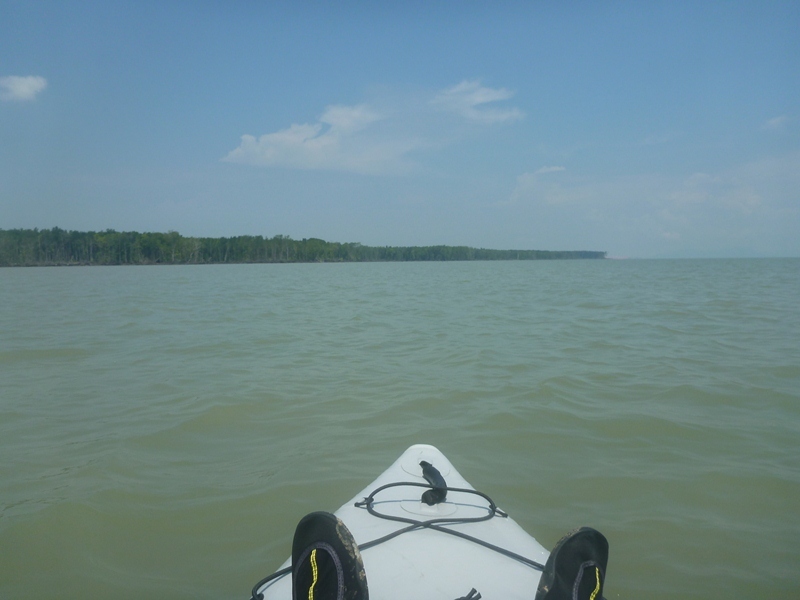 It was so calm and peaceful and we stopped frequently to drift and enjoy the tranquility. 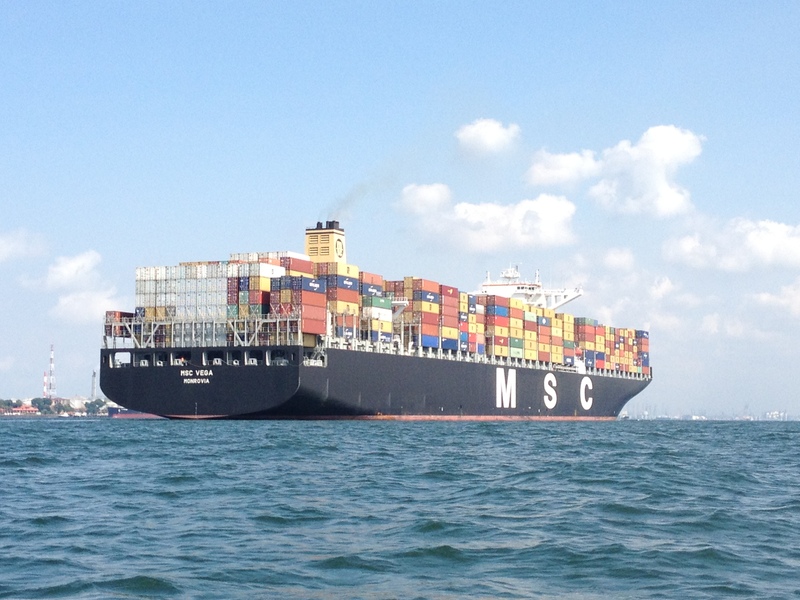 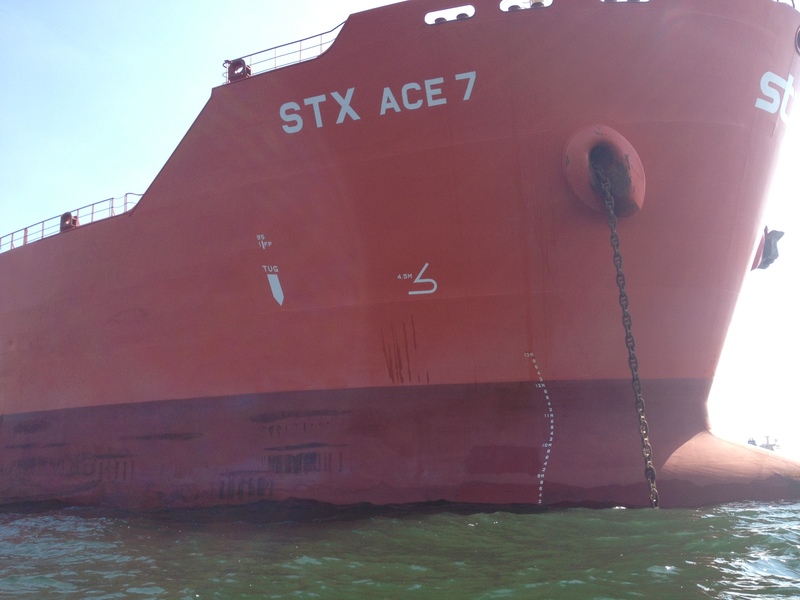 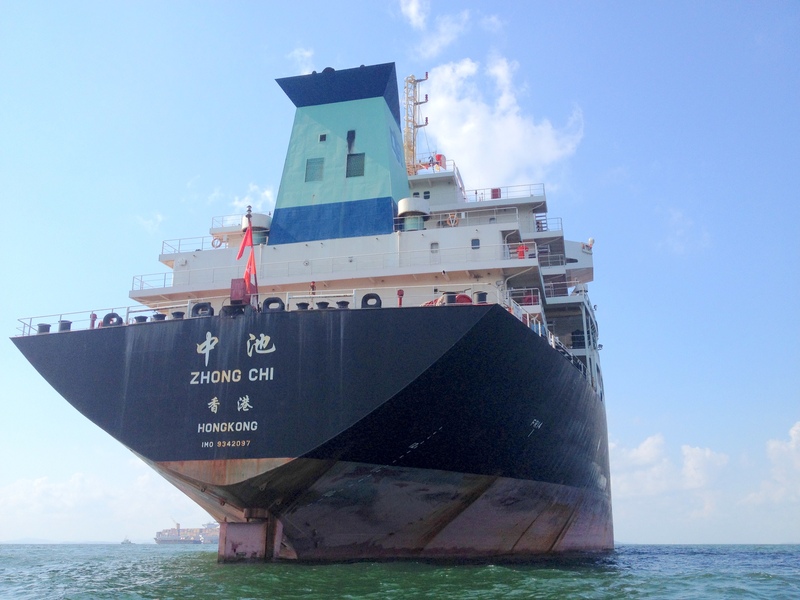 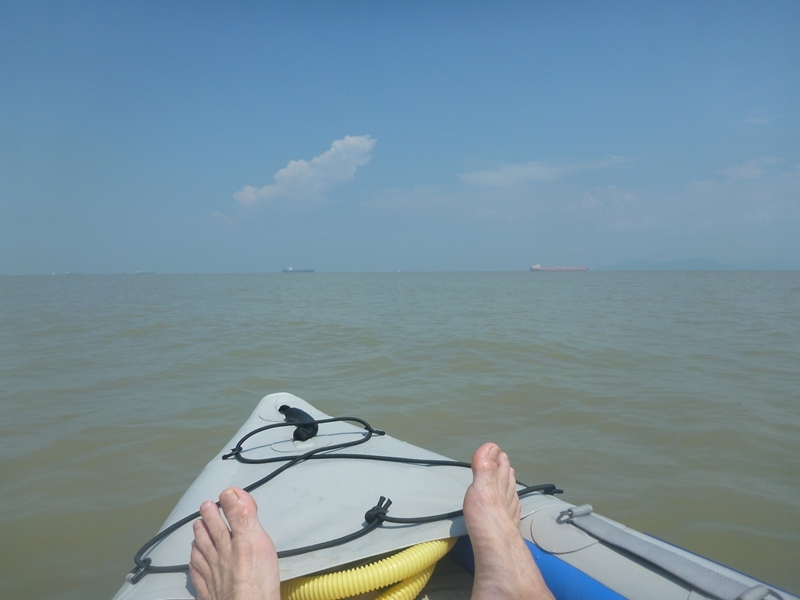 Far out to see on our right hand side we could see some huge container vessels steaming up the straits of Malacca – one of the busiest and most strategically important shipping channels in world shipping. 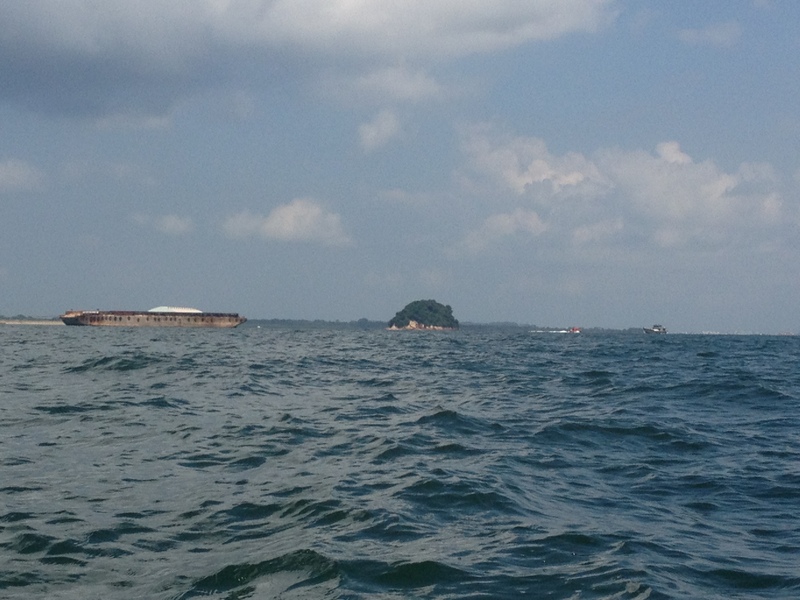 It also happens to be heavily pirate infested. 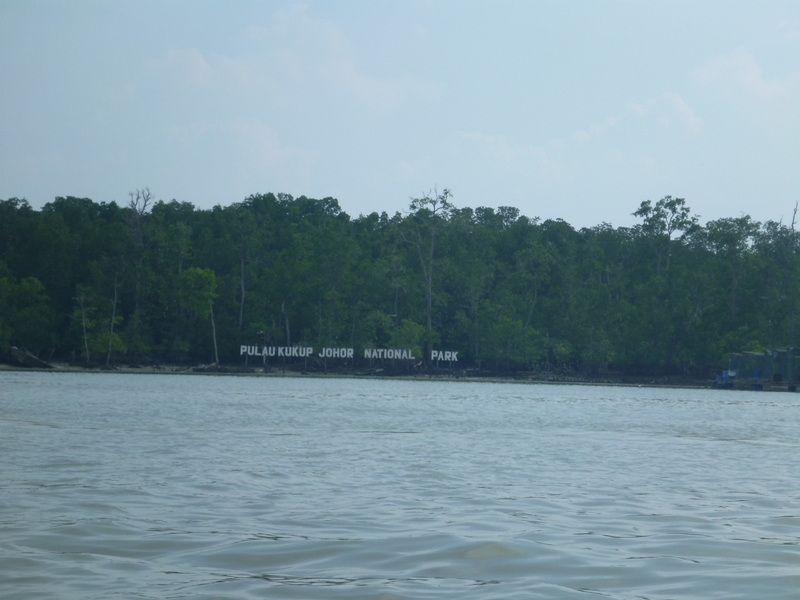 On our left side was the Mangroves of Pulau Kukup. 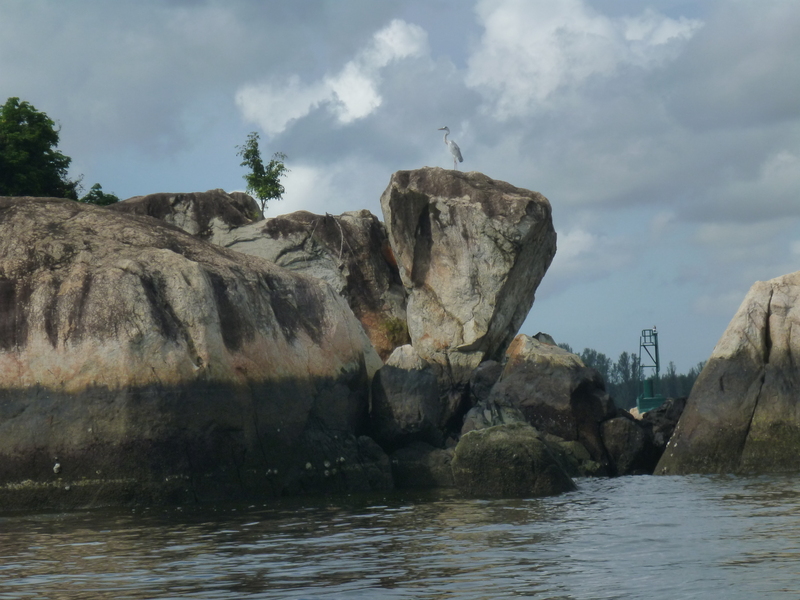 Bird life was abundant and small fish jumped out of the water continuously as we paddled along. 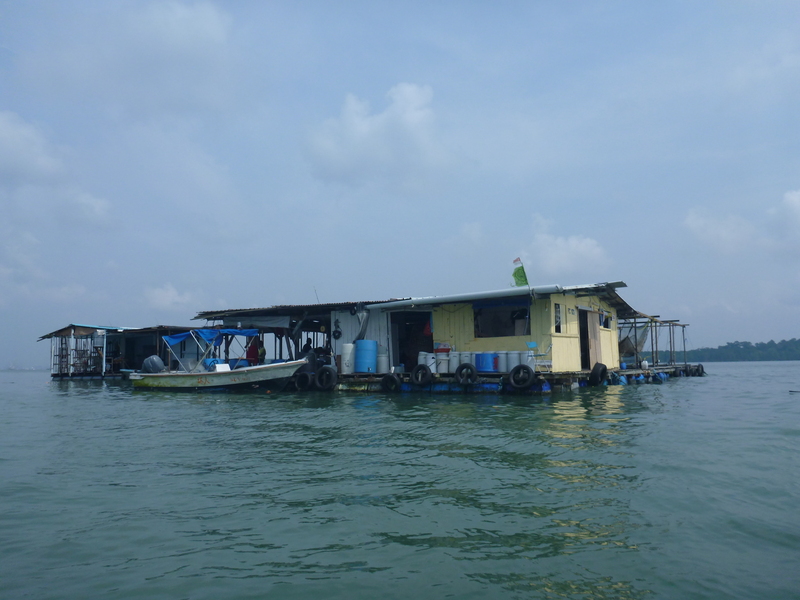 We passed a man cooking lunch over a wok in his house here. 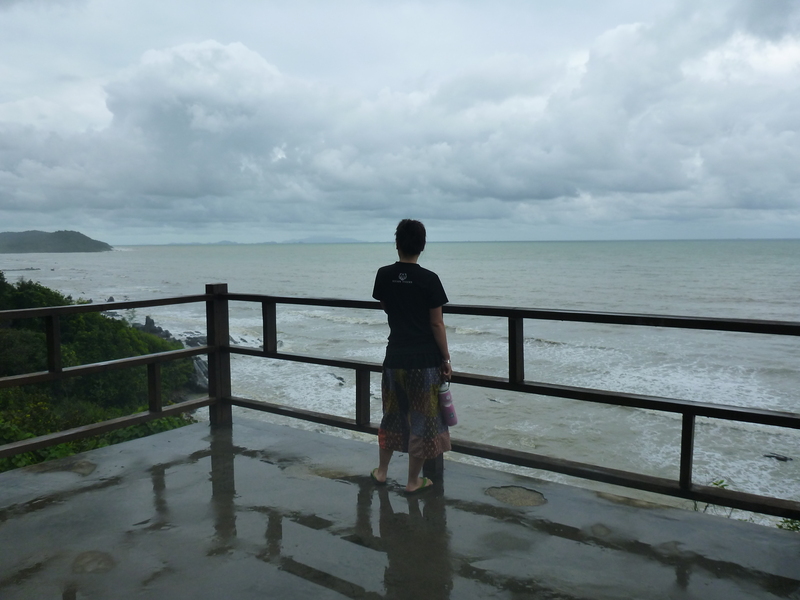 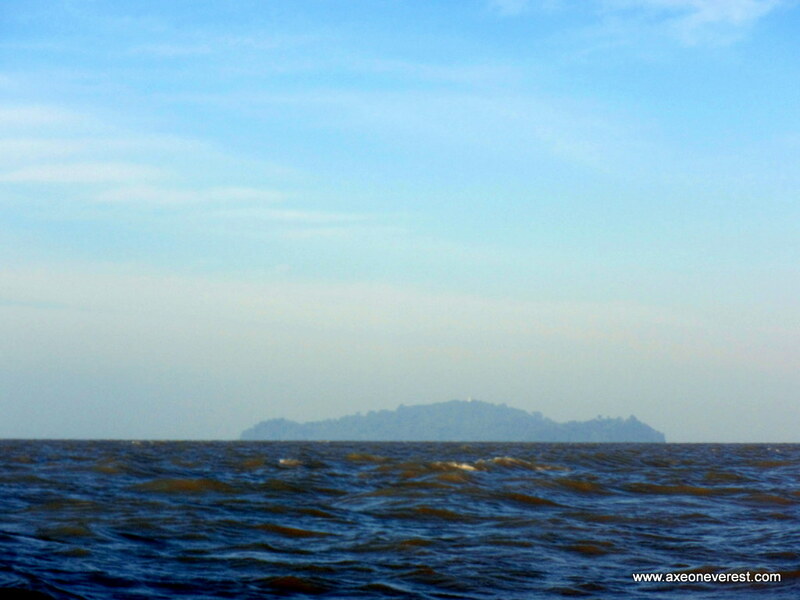 Looking across the strait to Pulau Kukup (Kukup Island) – the worlds second largest uninhabited mangrove Island. 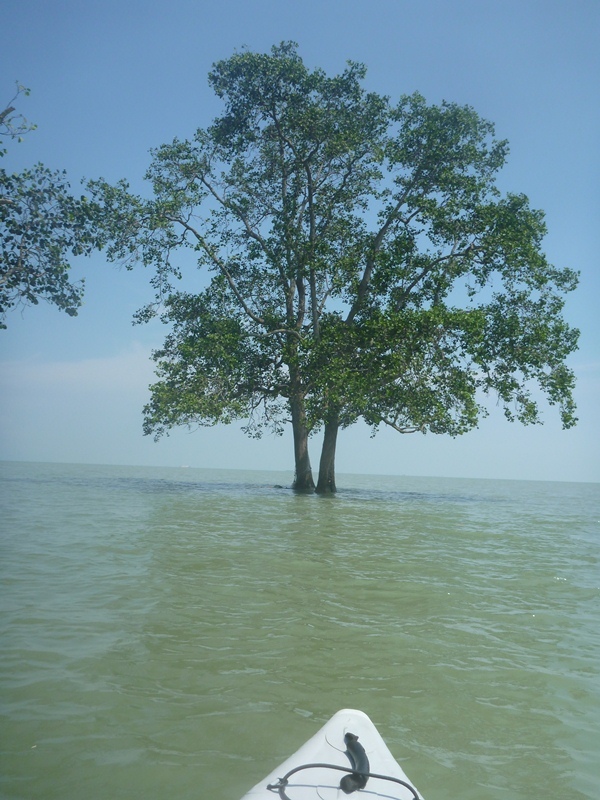 A lone mangrove at the Northern tip of Pulau Kukup. 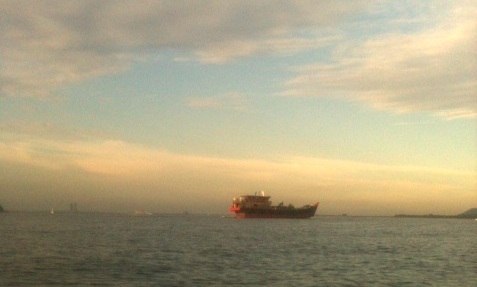 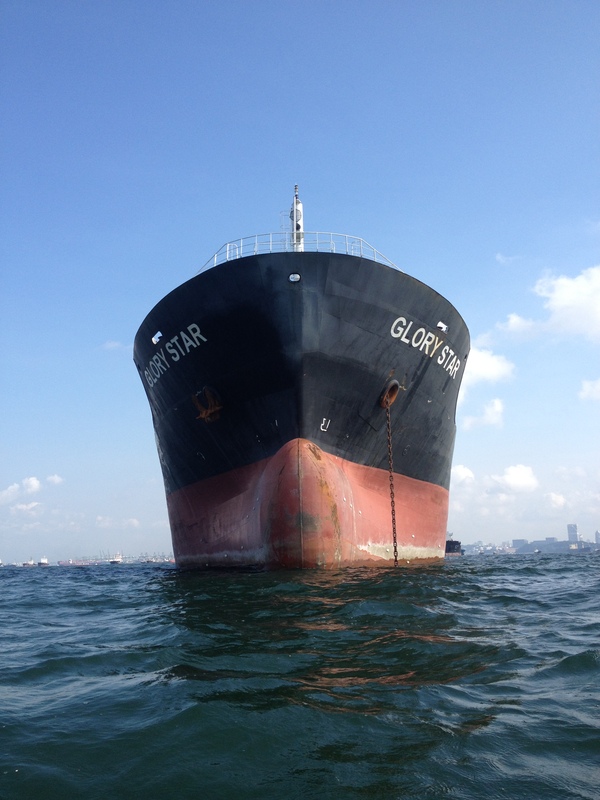 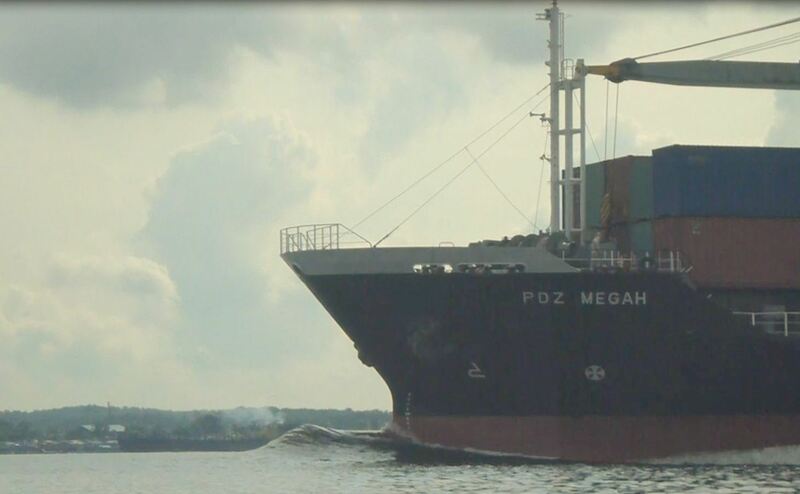 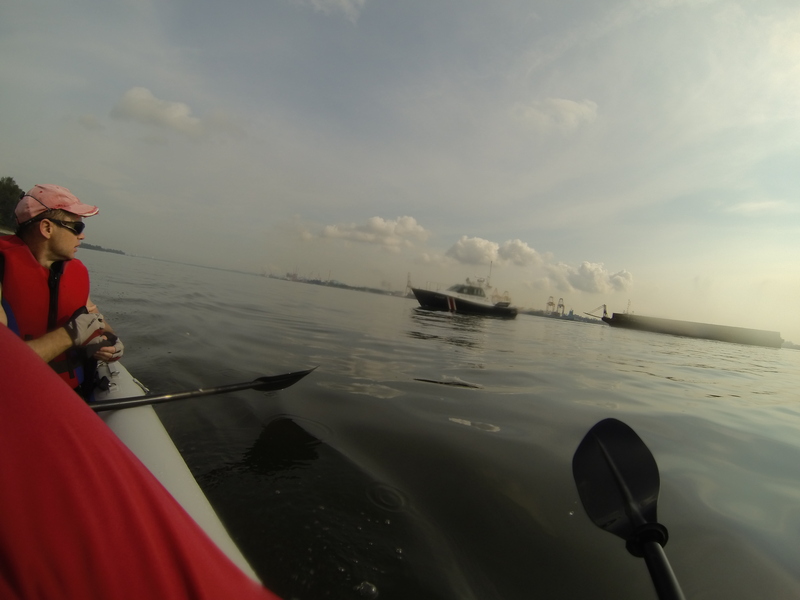 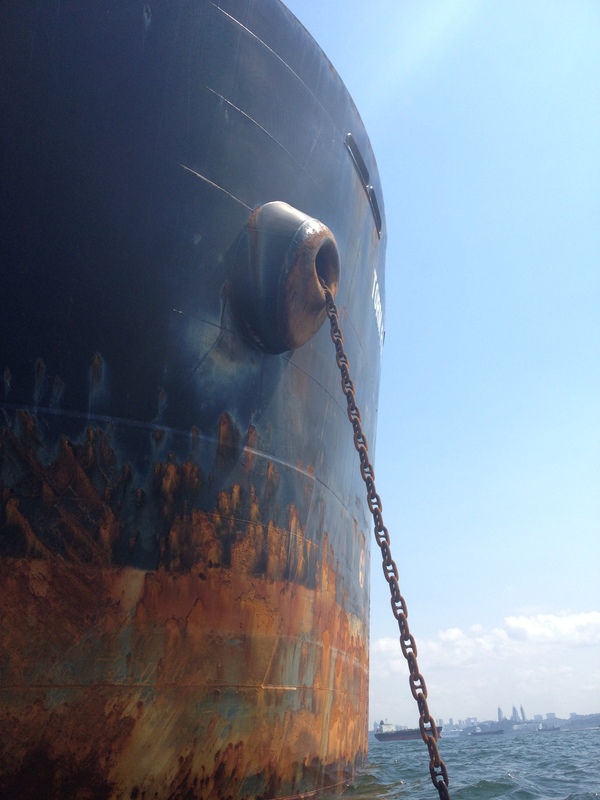 Looking out into the Malacca Strait at some huge cargo vessels. 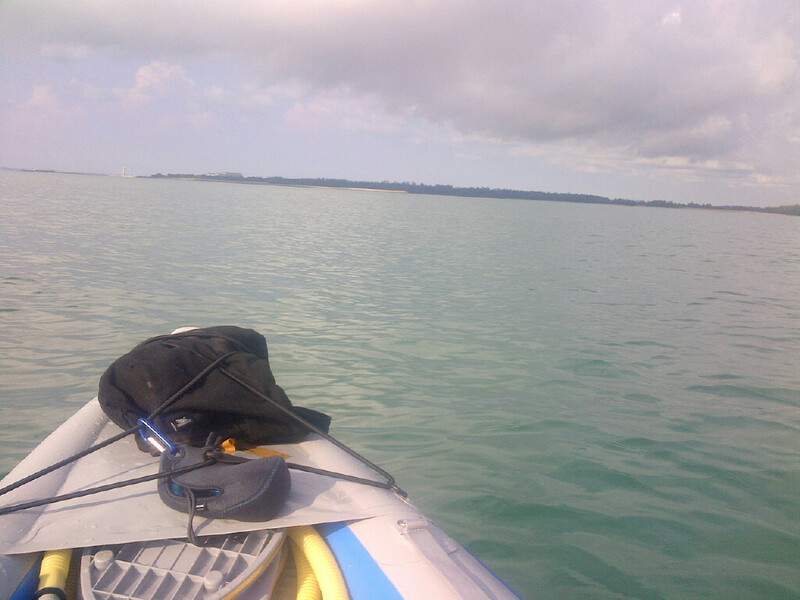 Coming around the southern tip of the Island we had to paddle a few hundred meters offshore as it was so shallow. 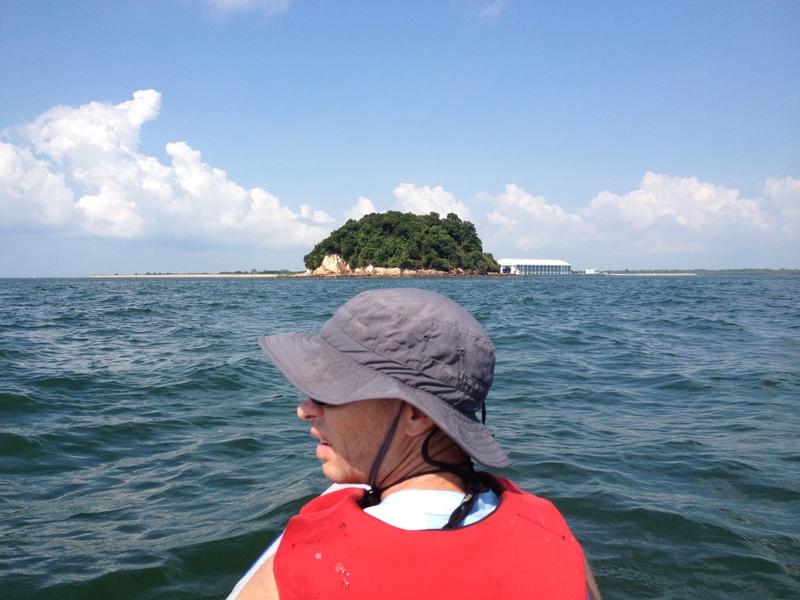 Soon we reached the southern tip of the island. 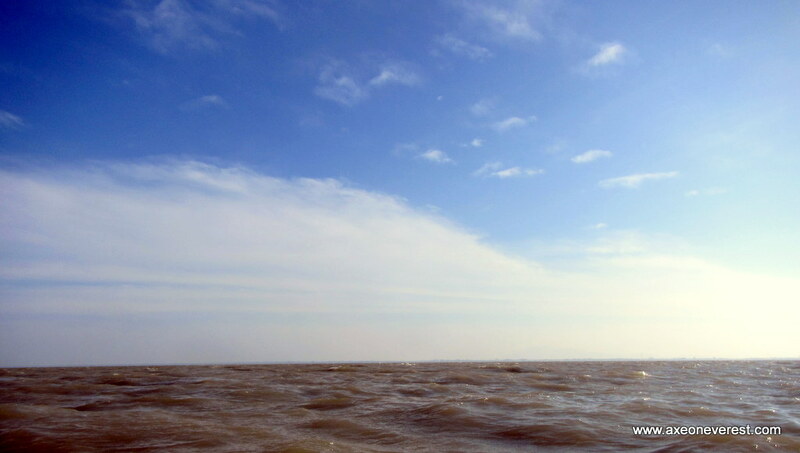 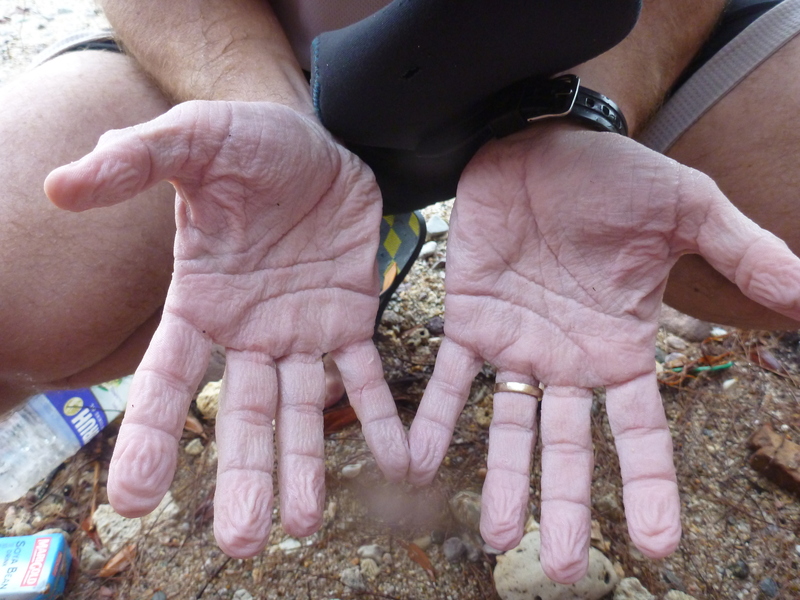 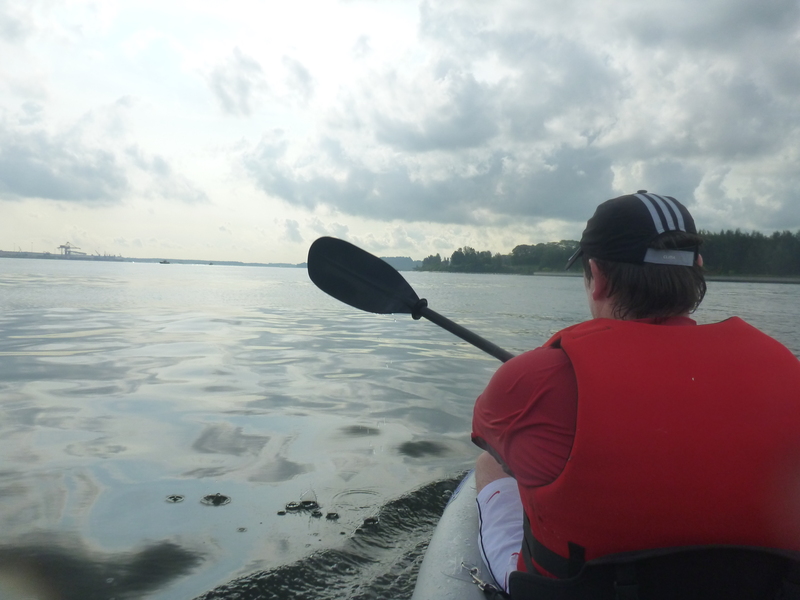 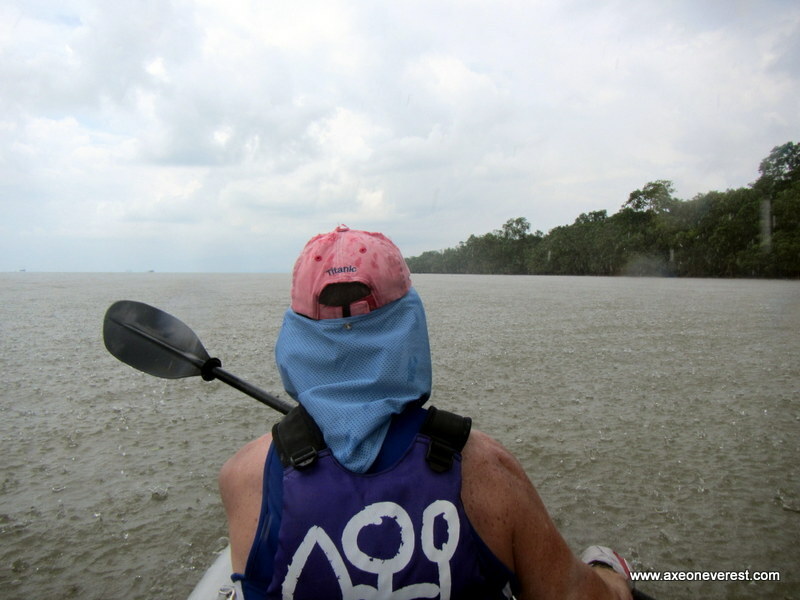 Here we realized the vast extent of the shallow mud flats and had to paddle a few hundred metres offshore to get enough water under the Divorce Machines keel to get around. 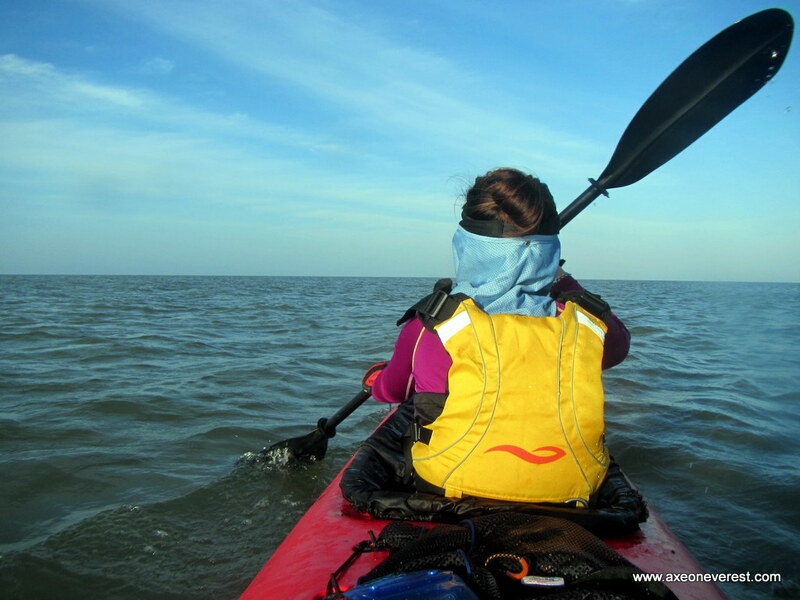 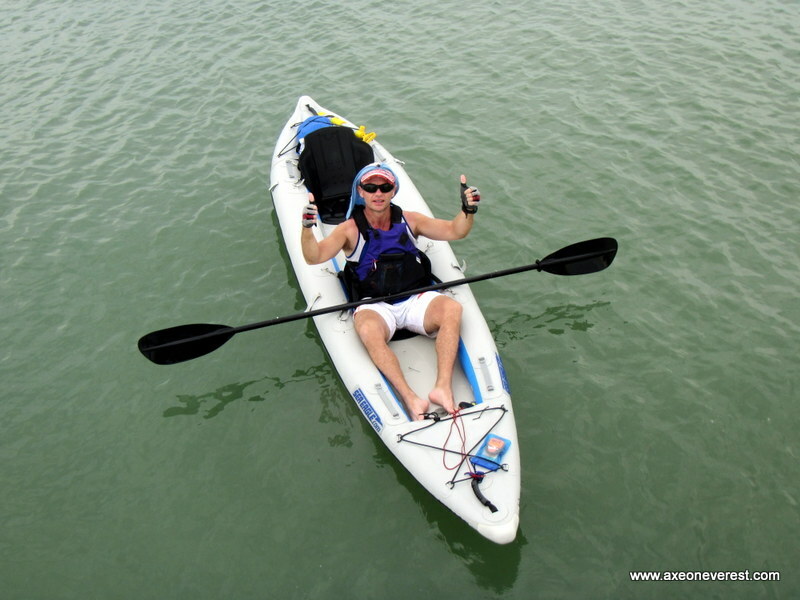 The problem with a sea kayaking circumnavigation beginning and ending in the same point is that you will usually have to fight current for at least part of your journey. 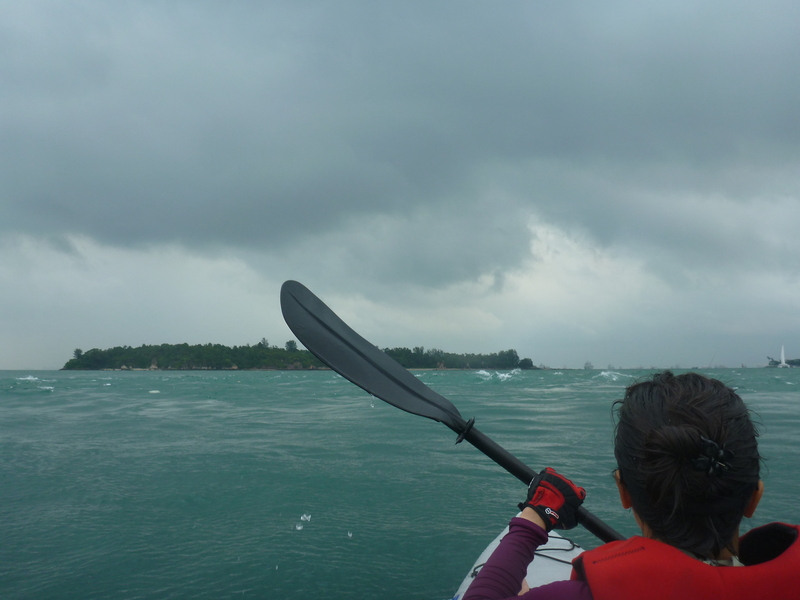 And for the last hour we were battling into the current as we rounded the southern tip and paddled the last 3km back up the straits to Kukup. 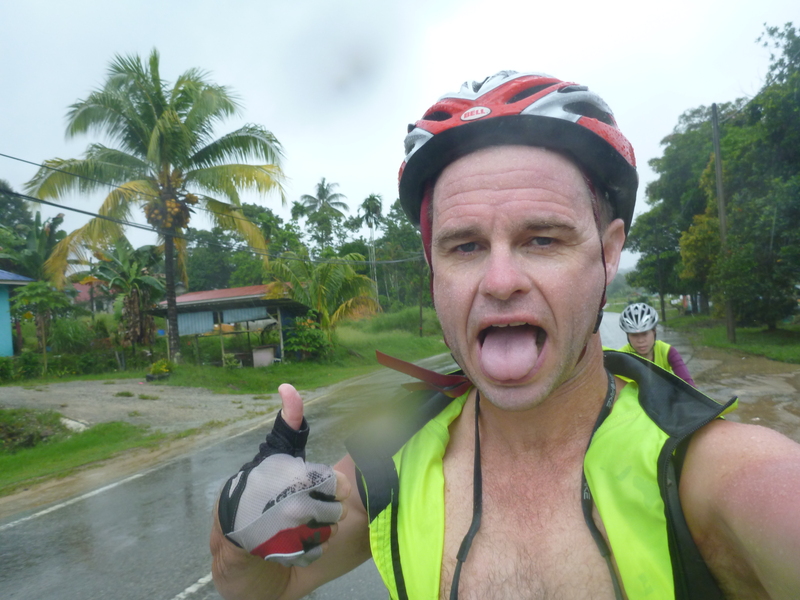 By this stage I was feeling severely dehydrated which was causing me to feel very weak and lethargic and develop a headache. 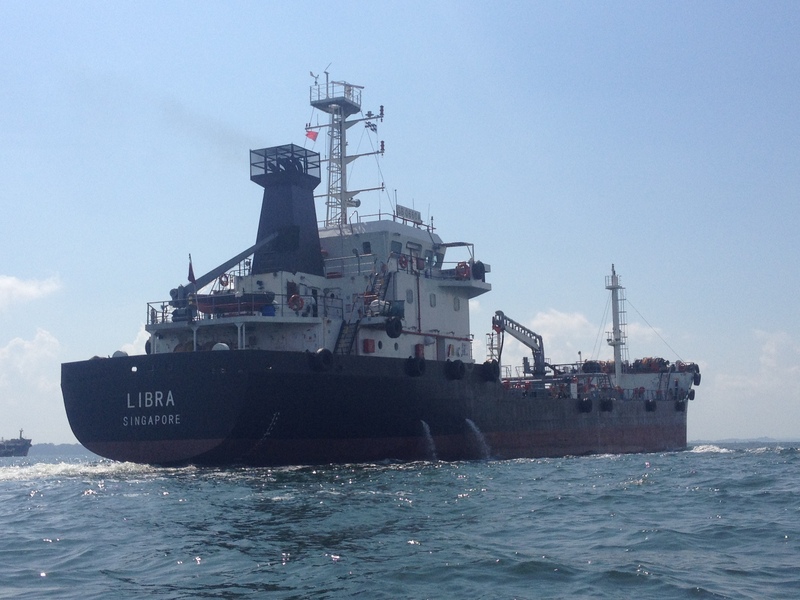 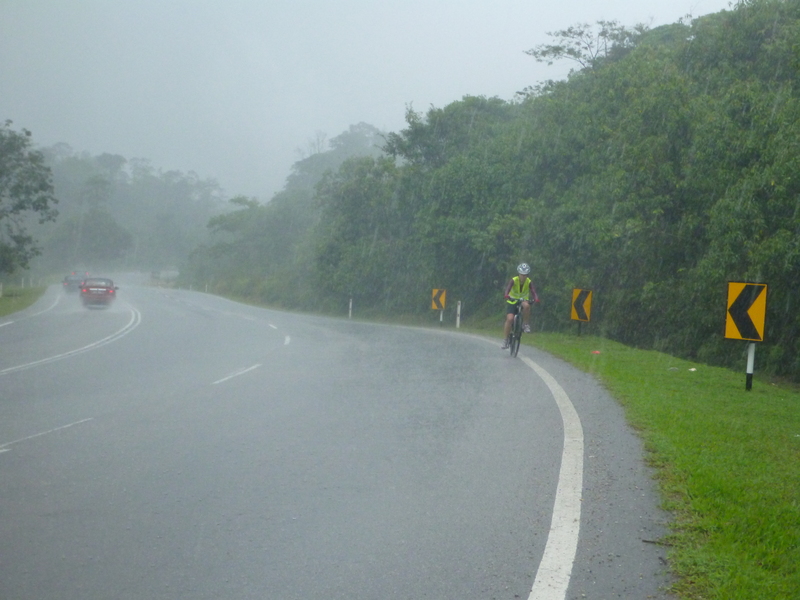 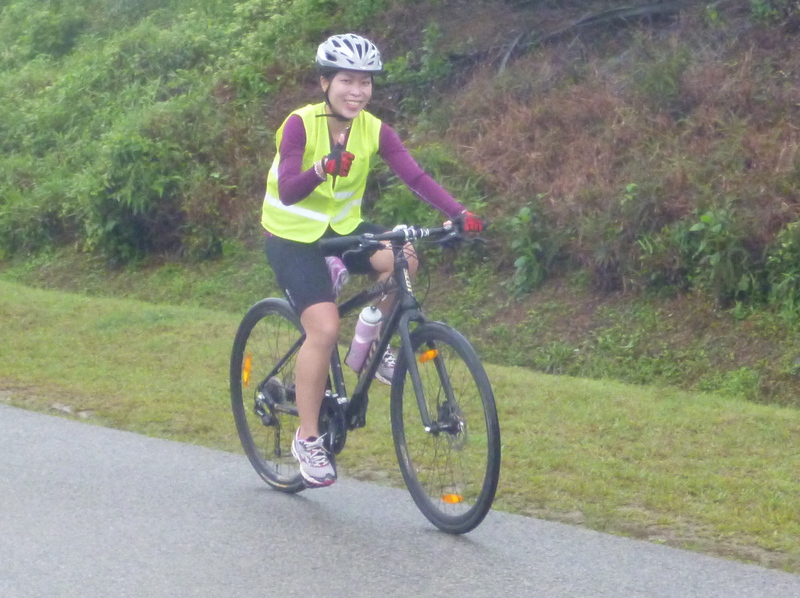 Stephanie was going strong however and put in a great effort to get us back over the Strait to Kukup. 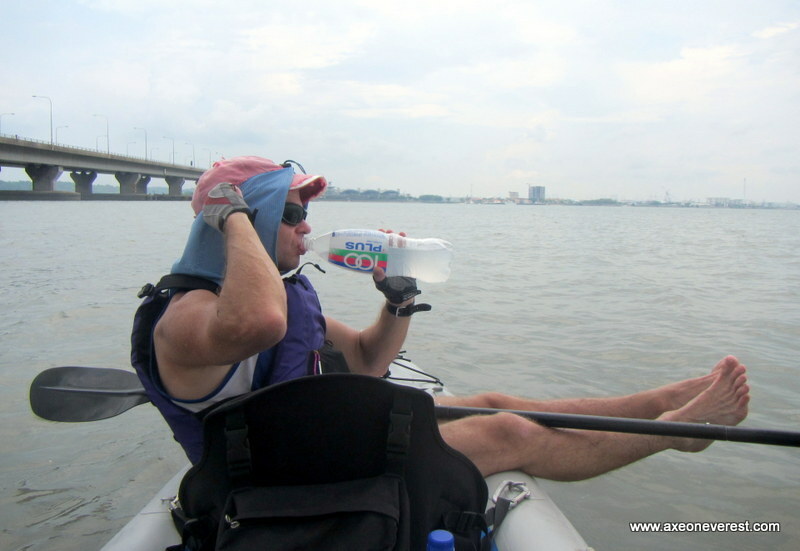 This is not the first time I have made the mistake of not being adequately hydrated before the kayak and also not taking enough water along with us. 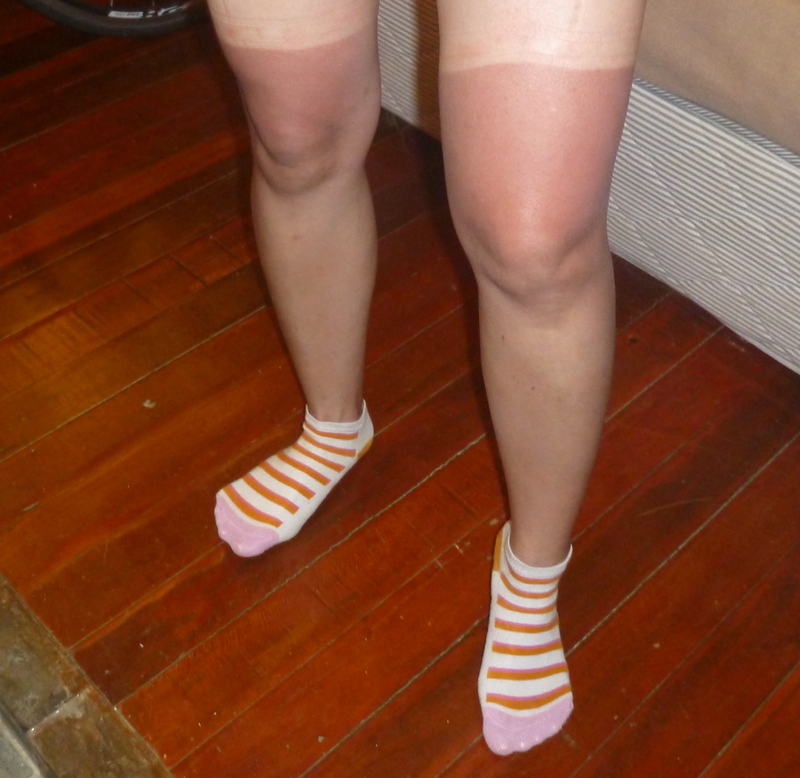 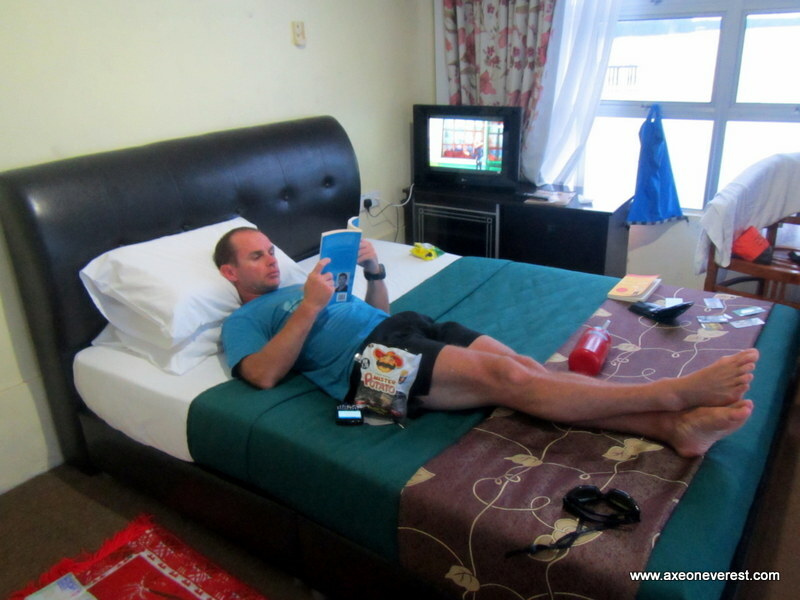 It is very interesting to see how my performance decreases when I get dehydrated. 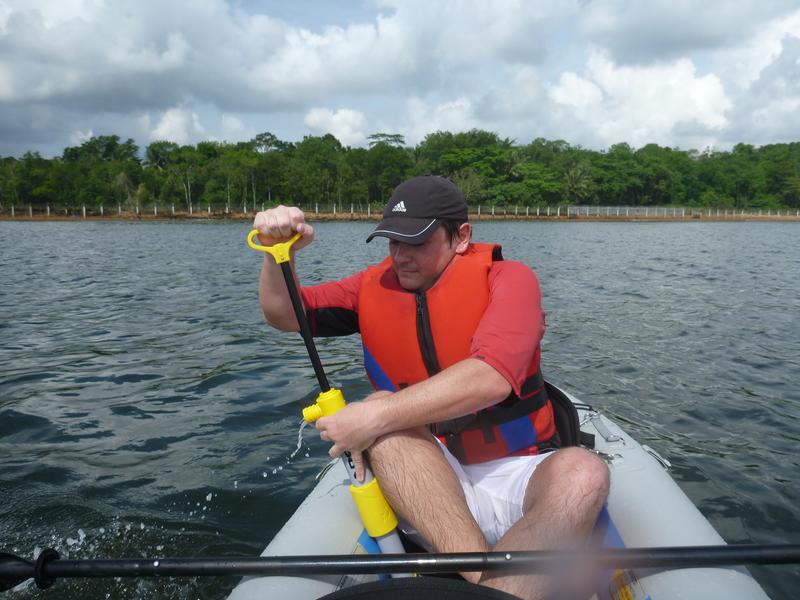 I estimate that during this paddle I was probably was at around 50% only of my normal strength and endurance, purely through not drinking enough. 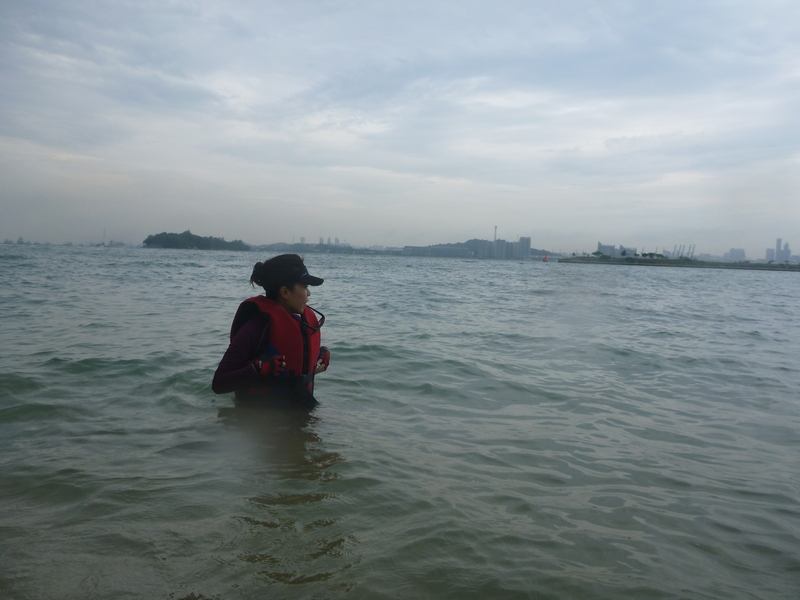 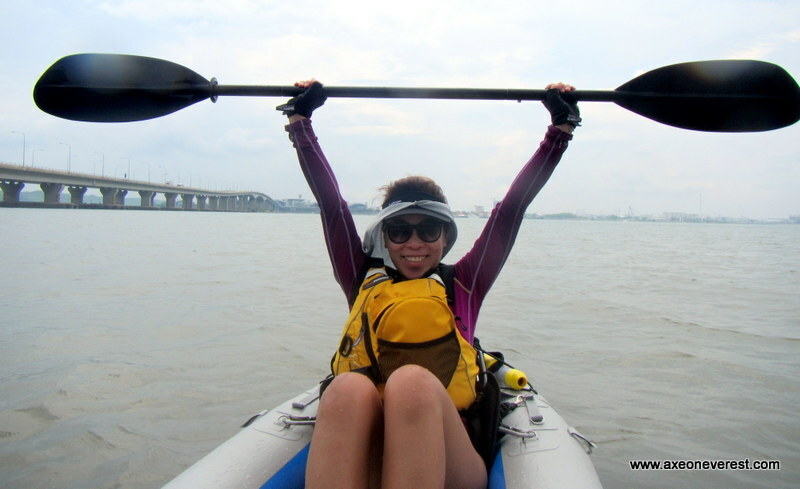 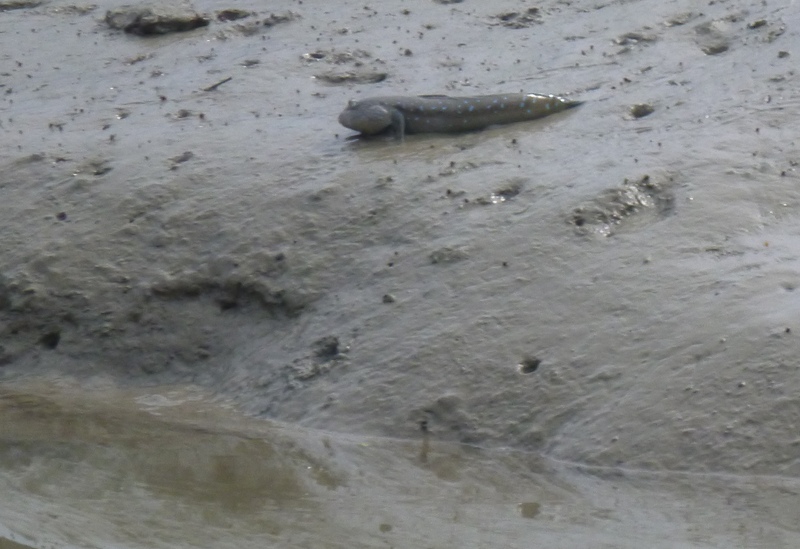 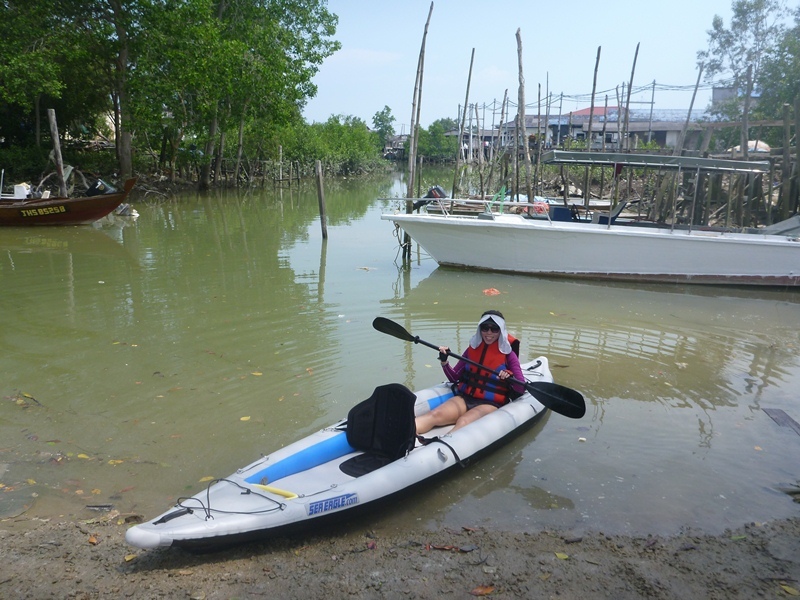 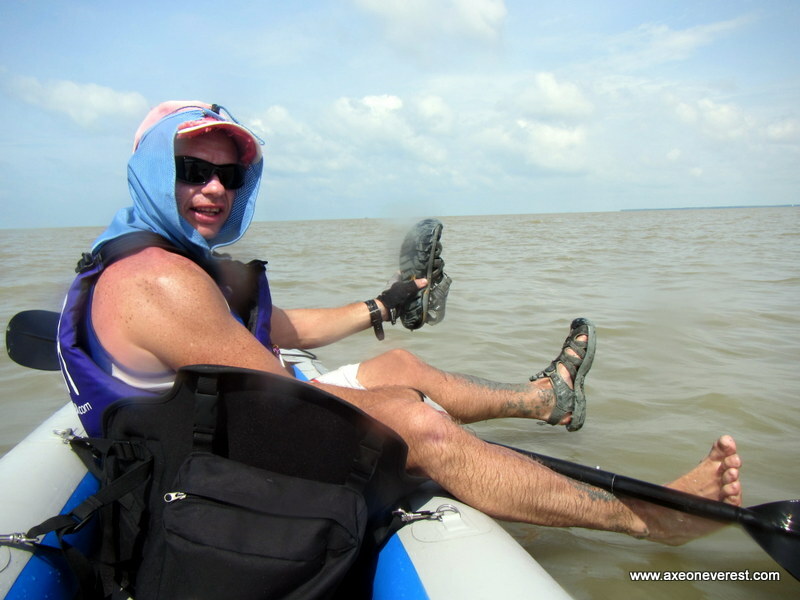 The tide was going out was we reached the small Sungei (river) where we started from and it was fascinating as we paddled back up the river to see the hundred of mudskippers jumping around the mudflats and skimming along on top of the water as we approached. 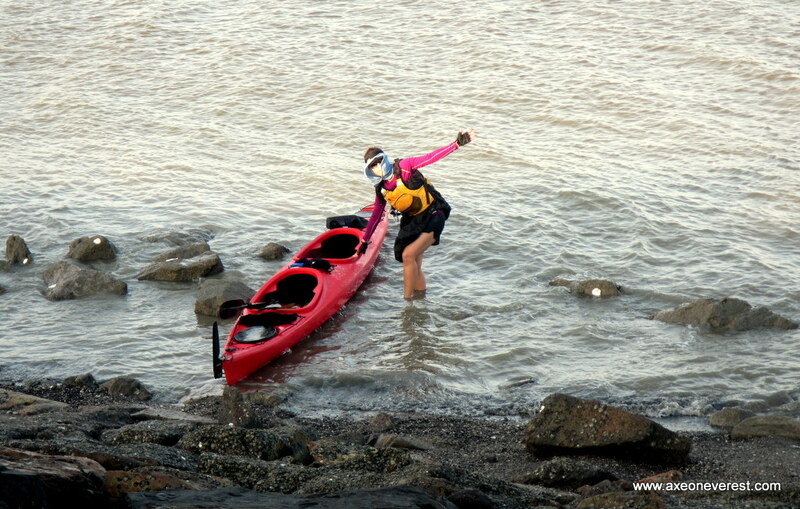 Stephanie paddling back up the river at low tide as we finish the paddle. 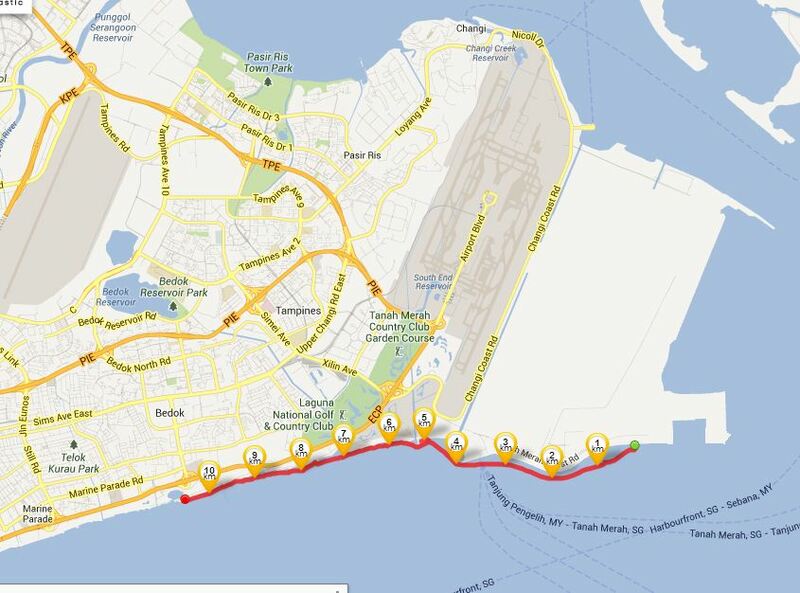 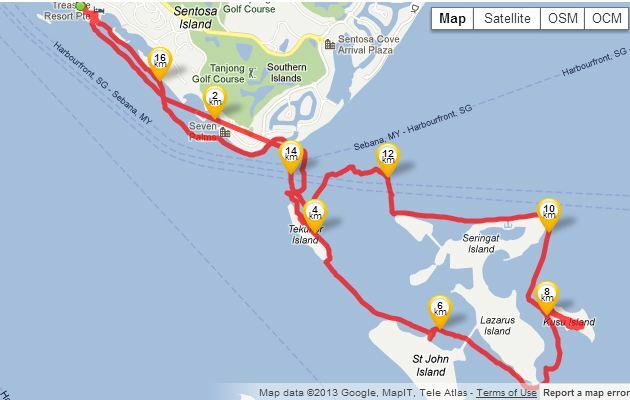 The GPS track of our route around Pulau Kukup showing km markings in red. 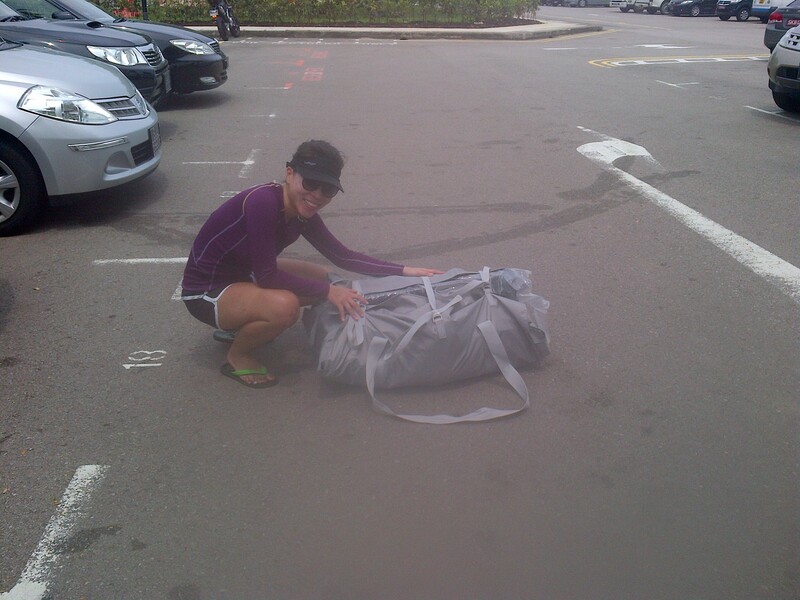 Stephanie with the Divorce Machine all packed up in the boot. 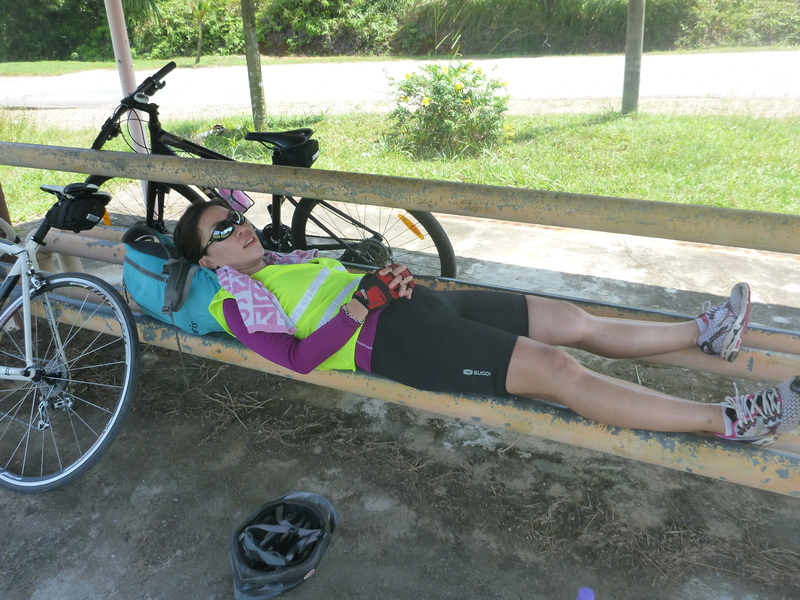 We soon had the Divorce Machine packed up in the boot of the car and I was very happy to start rehydrating with some well-earned 100-plus sports drink. 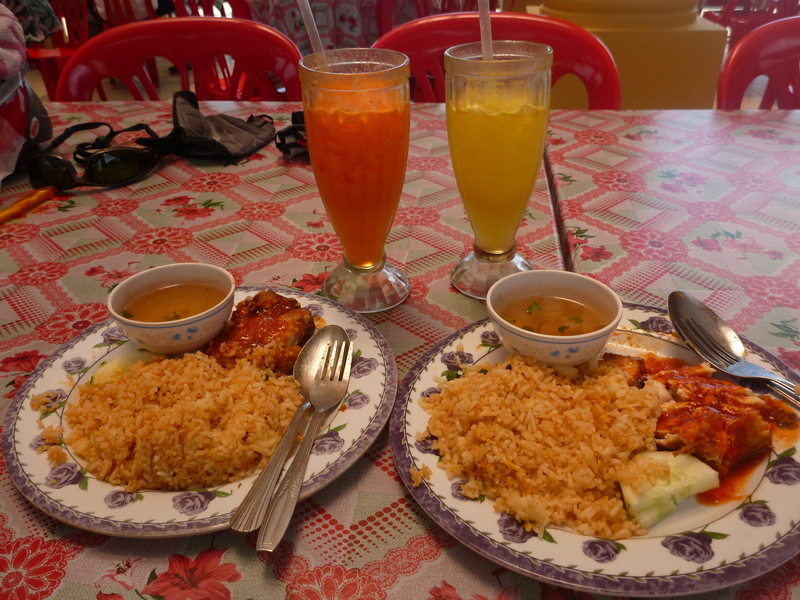 We wandered down the relaxed main street of Kukup and had a beautiful plate of nasi goring ayam (fried rice with chicken). 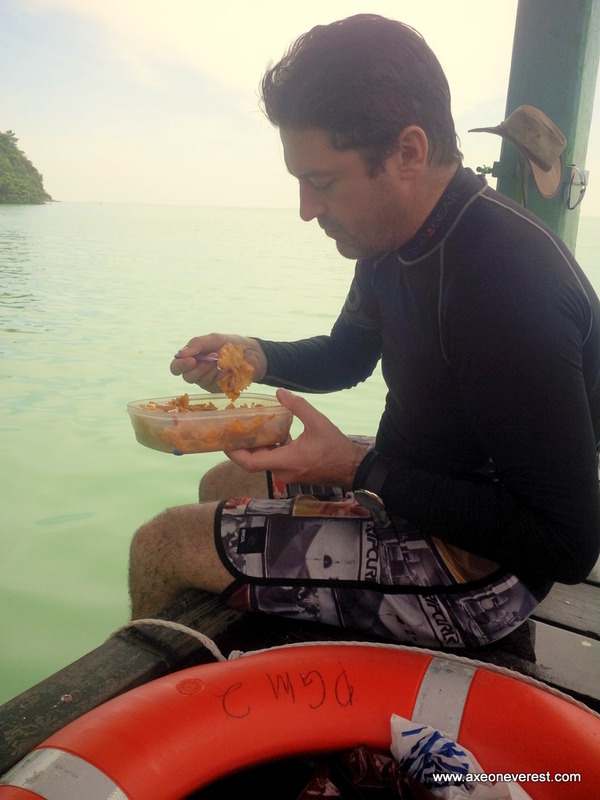 Food always tastes better when you are hungry. 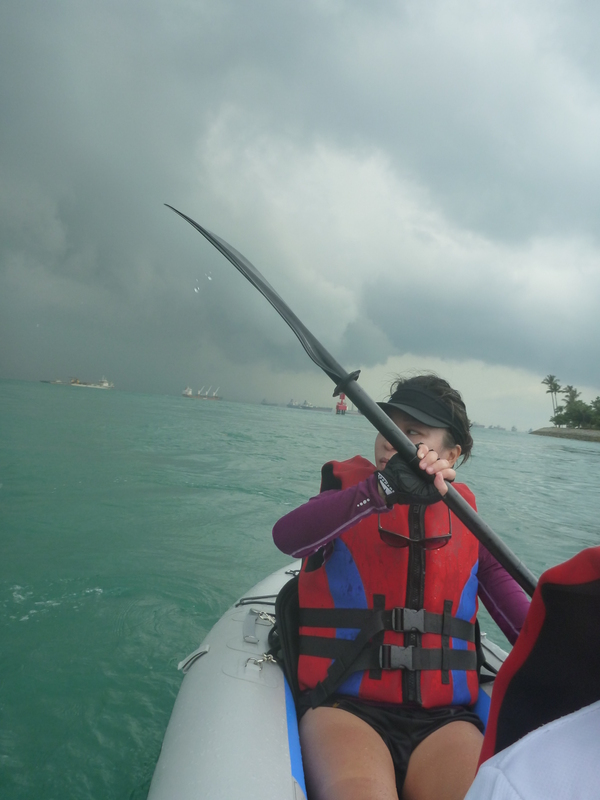 Overall the paddle was an interesting change of scene from Singapore. 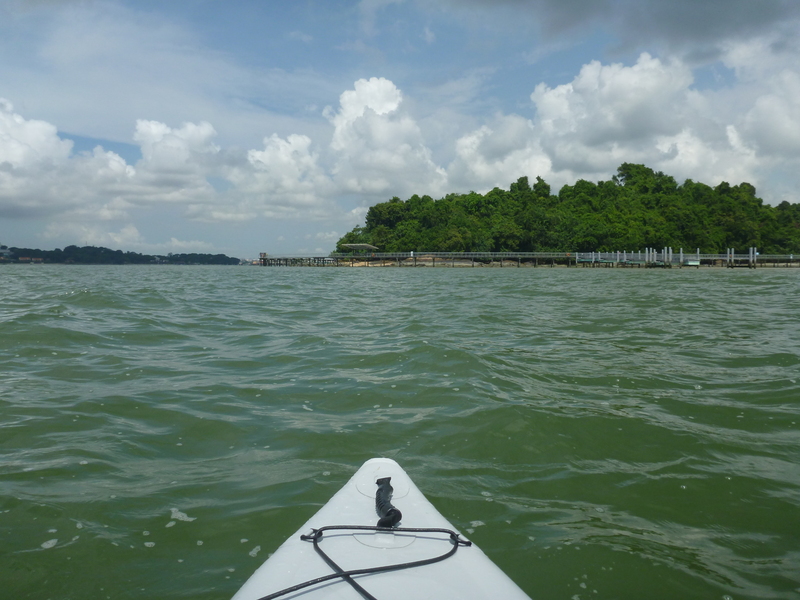 We describe it as a very peaceful paddle as you really get a feeling of quiet isolation especially when you paddle around the western side of Pulau Kukup. 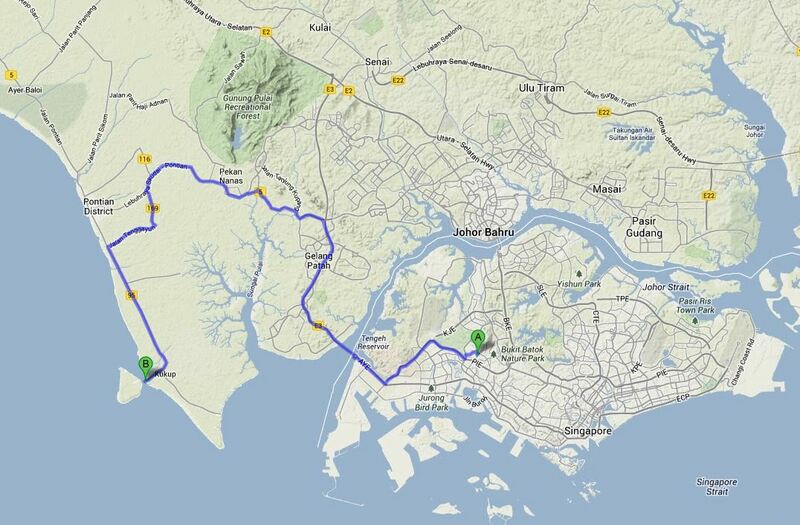 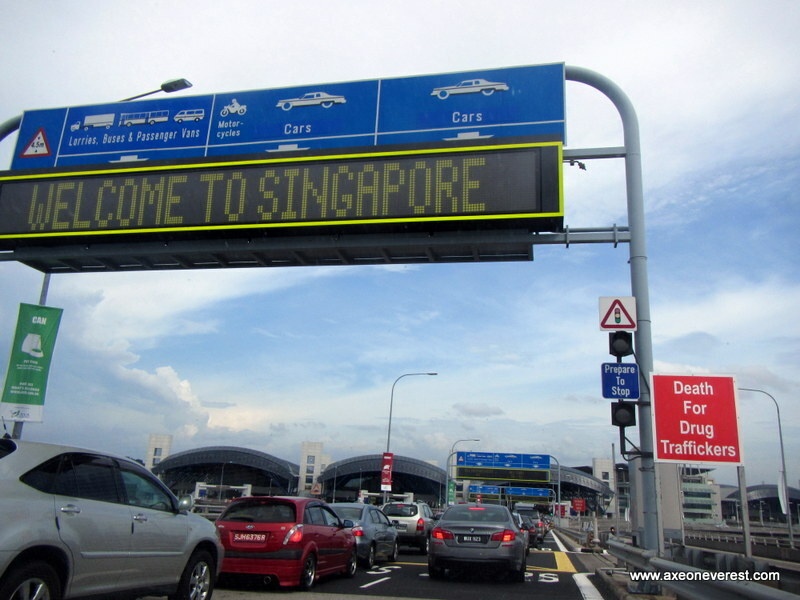 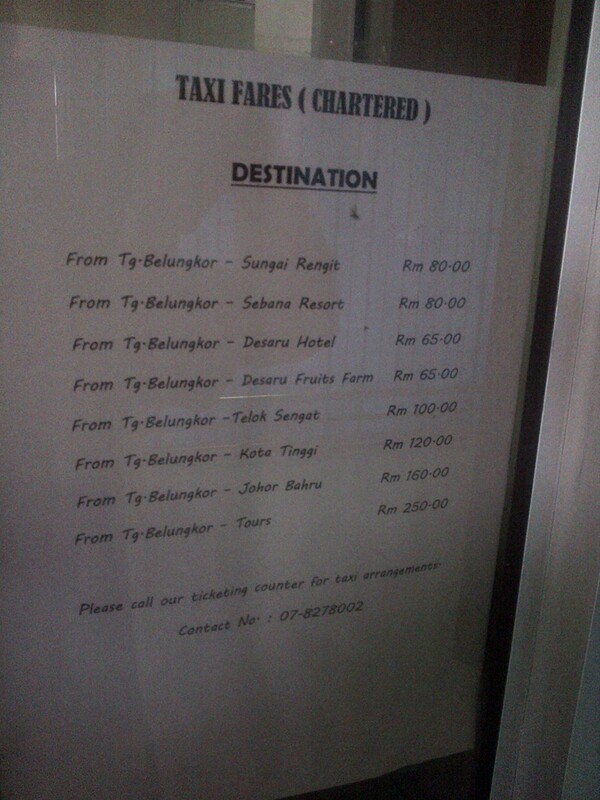 Total cost of the day including petrol, toll charges, causeway charges and food was around S$30 for both of us! 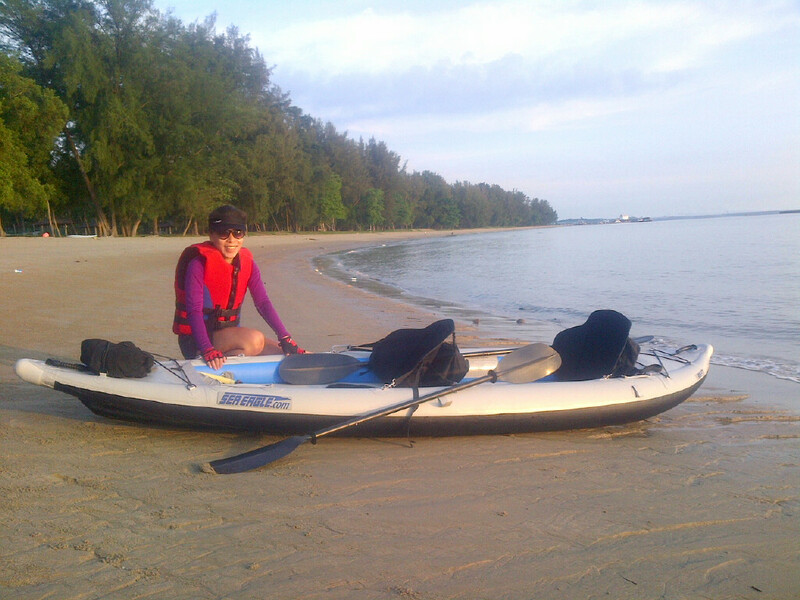 And I am fairly sure we did a world first circumnavigation of the Pulau Kukup in an inflatable kayak by a husband and wife team. 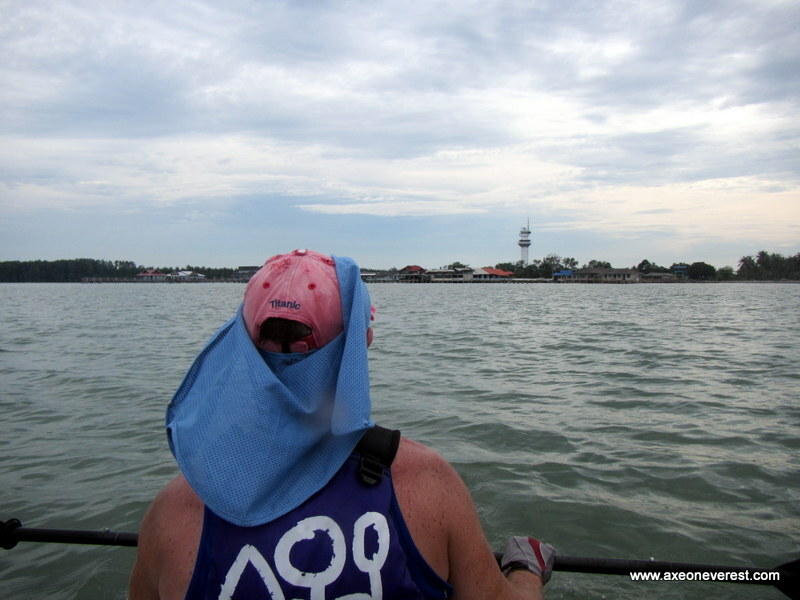 Not that doing a world first is important to us at all to be frank BUT we did prove once again that you don’t need to spend hundreds or even thousands of dollars and weeks of leave to fly somewhere to have an adventure. 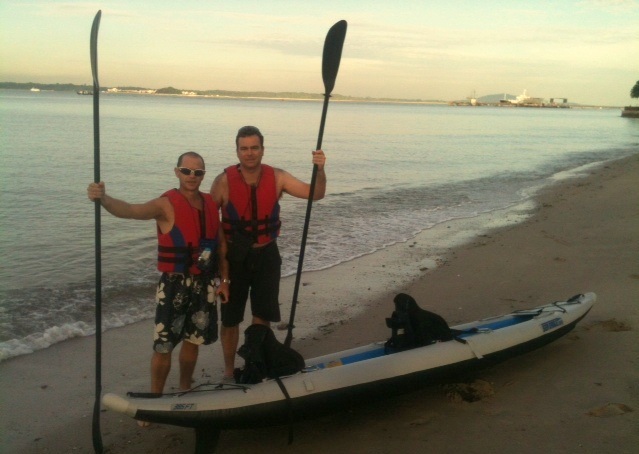 You can do one from your back doorstep. 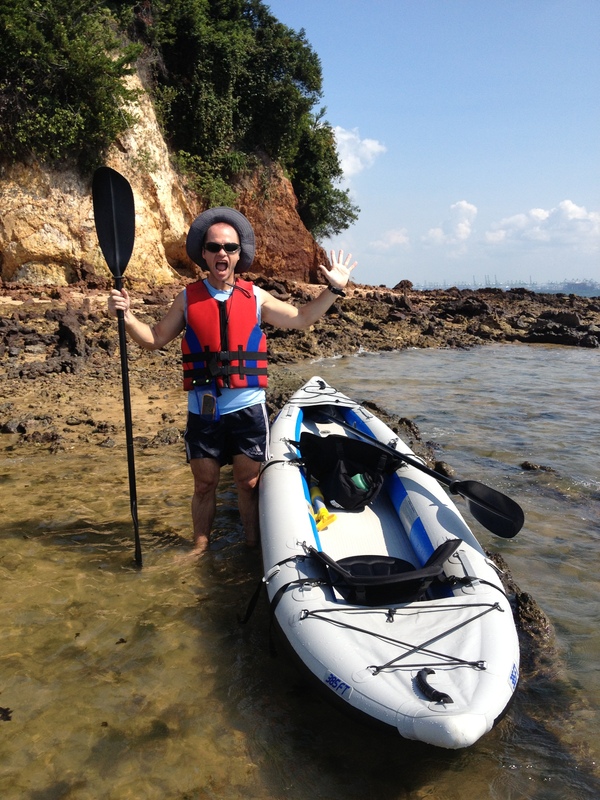 Happy adventuring!